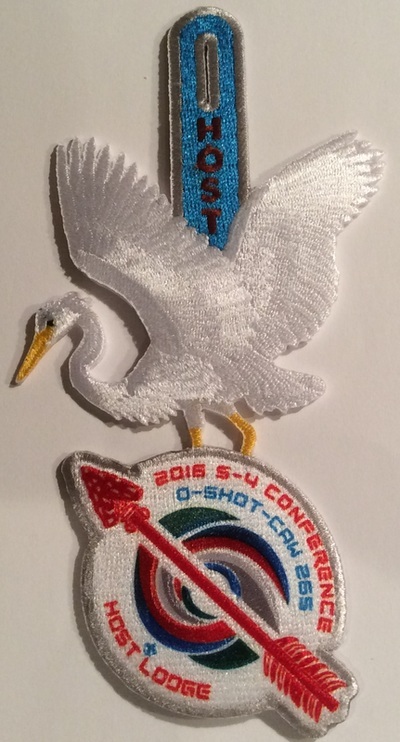 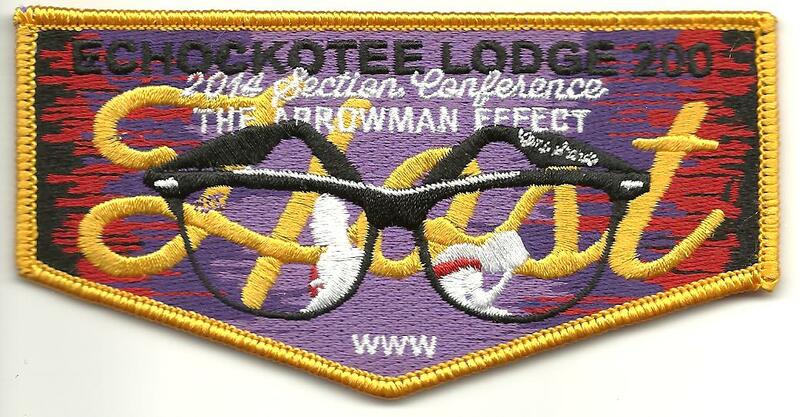 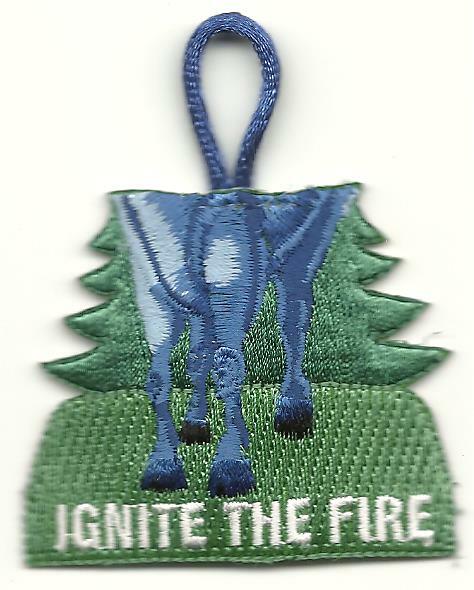 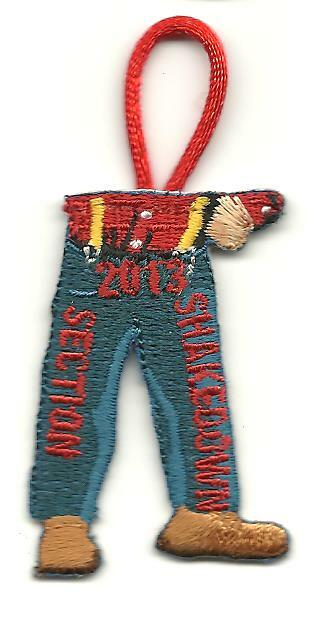 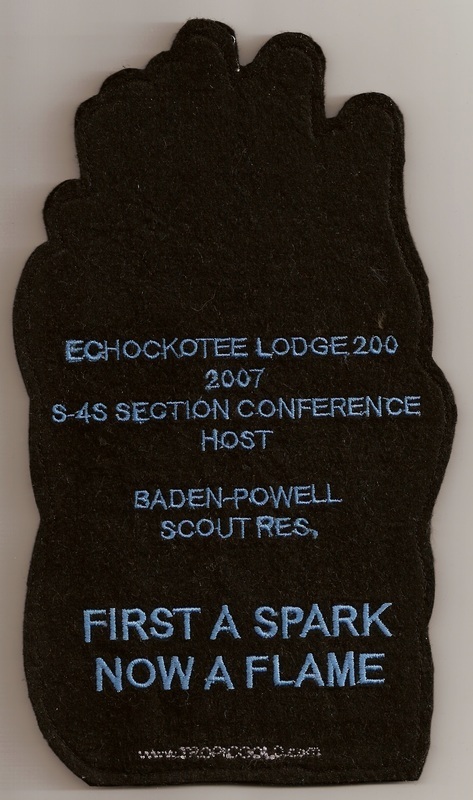 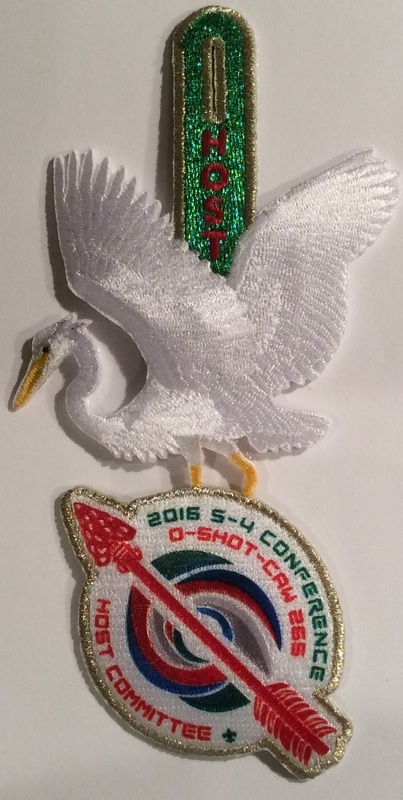 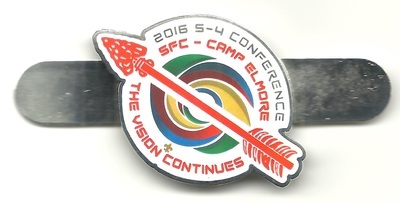 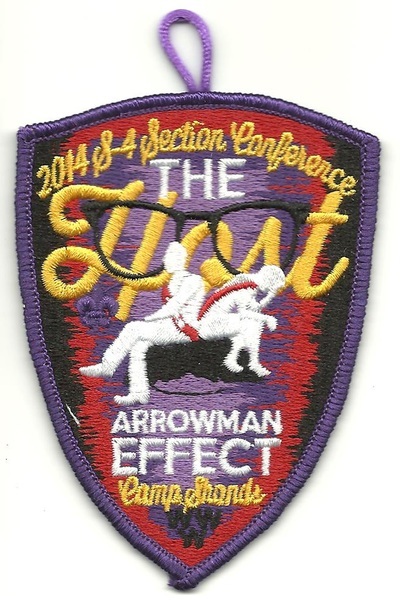 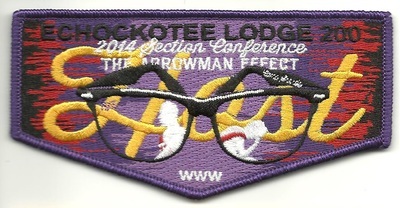 Items pictured below were created and issued by the lodges that hosted the Area or Section events. 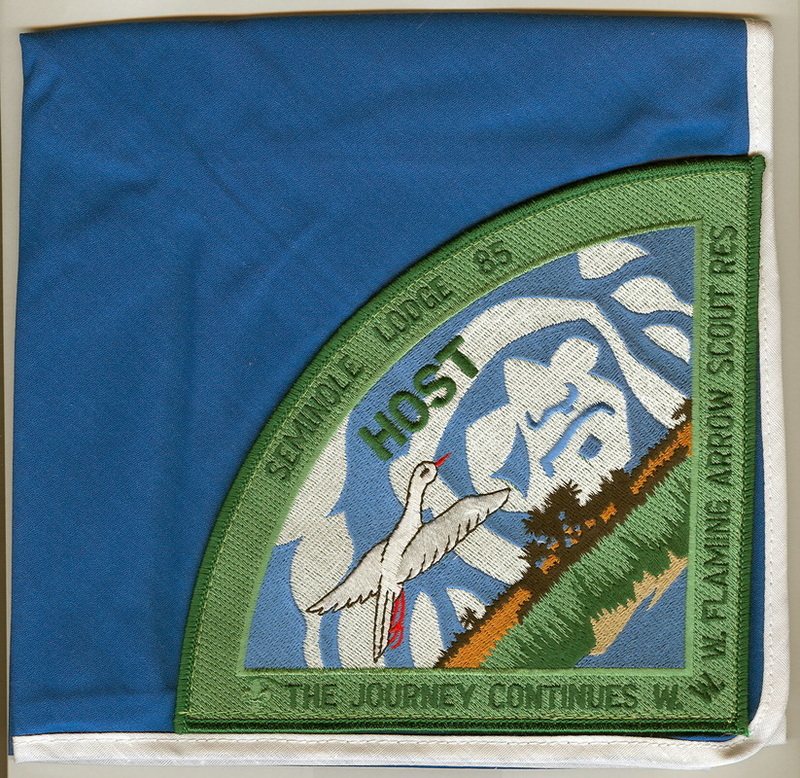 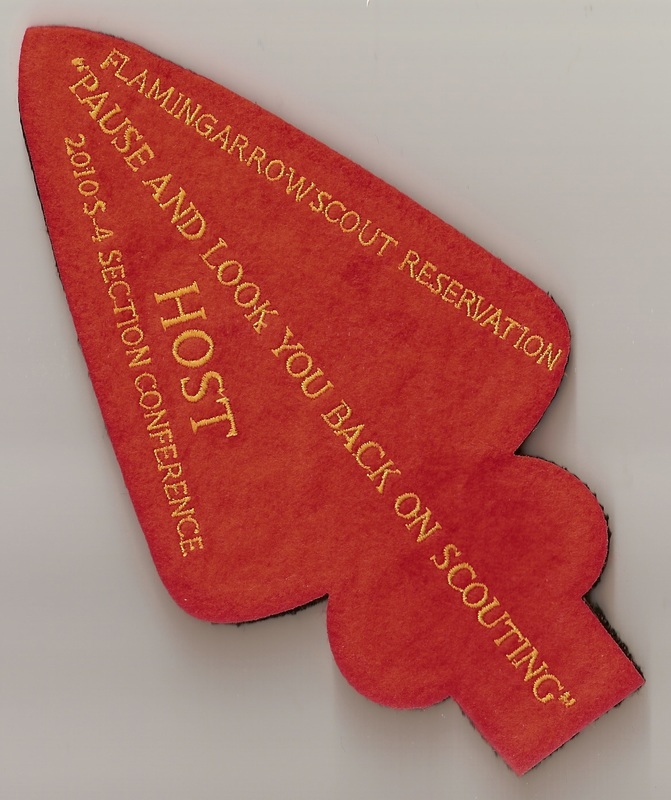 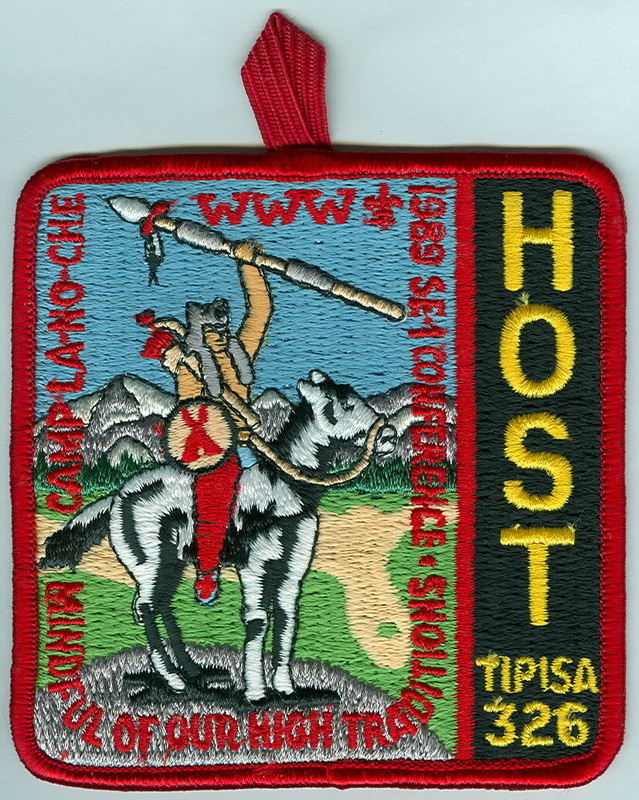 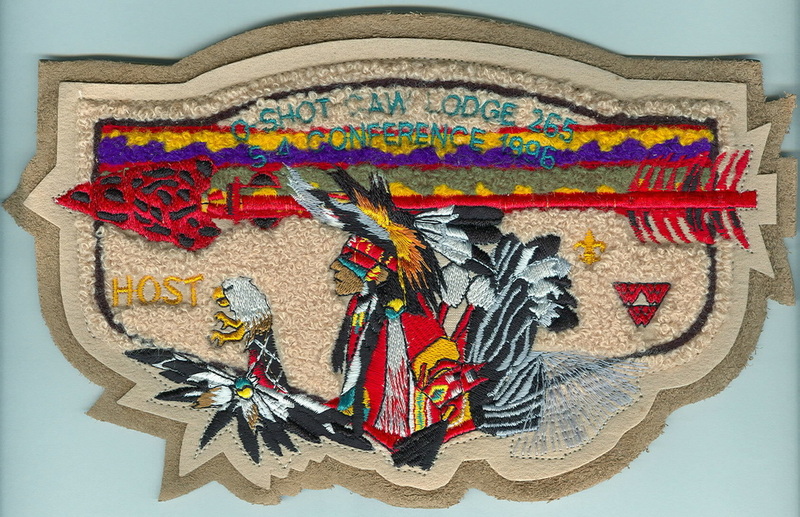 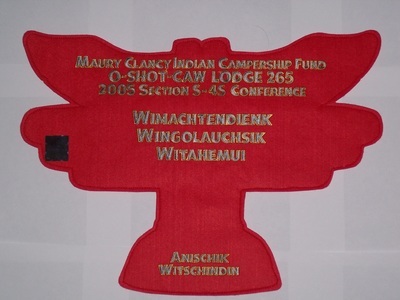 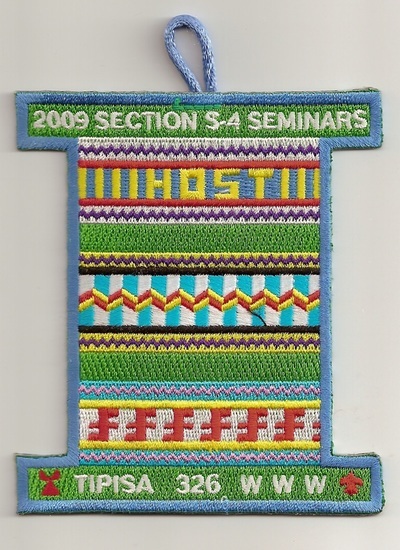 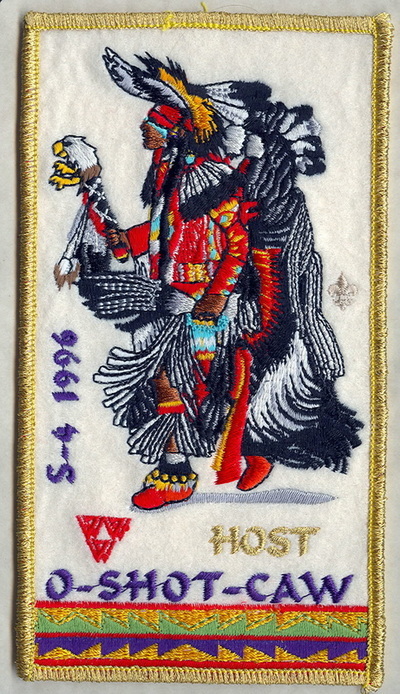 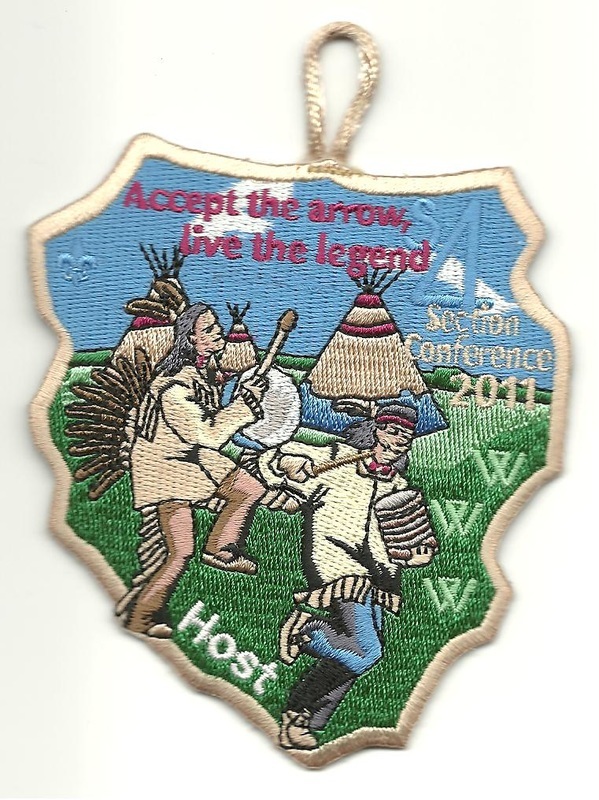 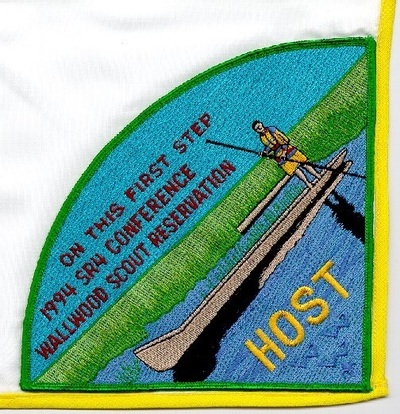 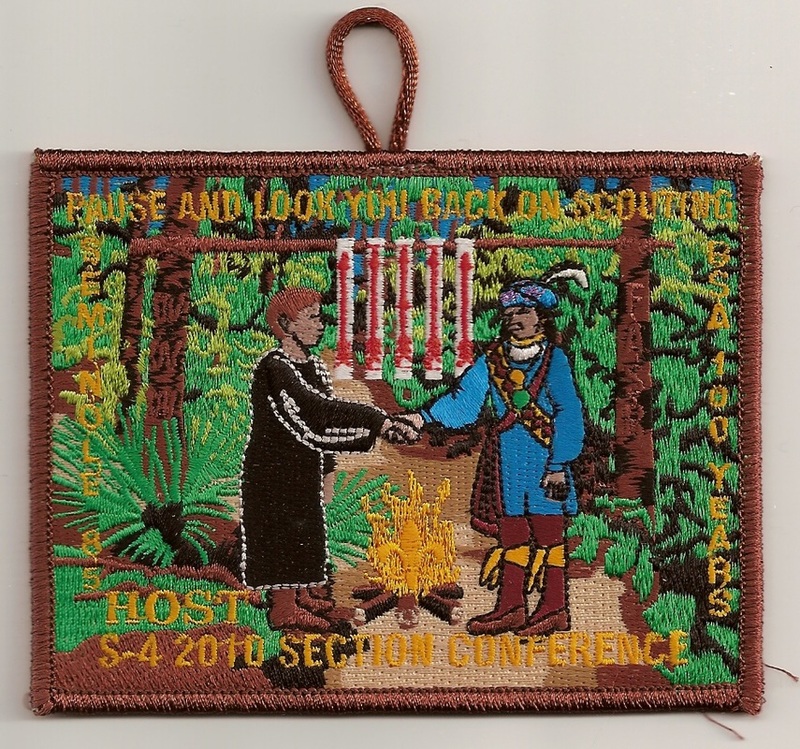 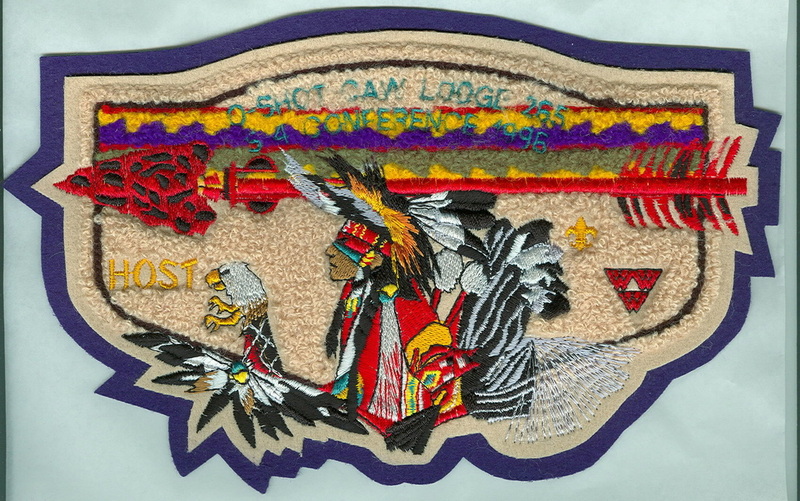 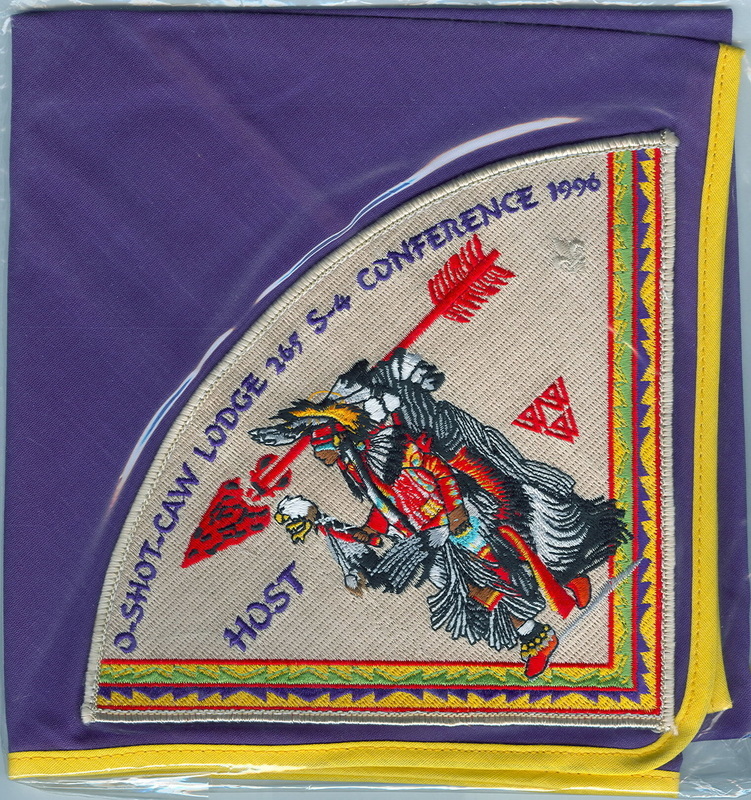 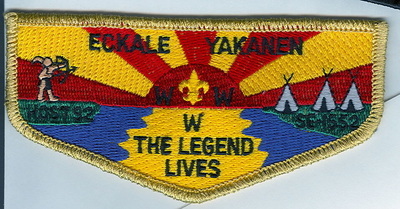 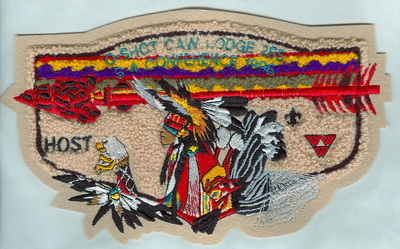 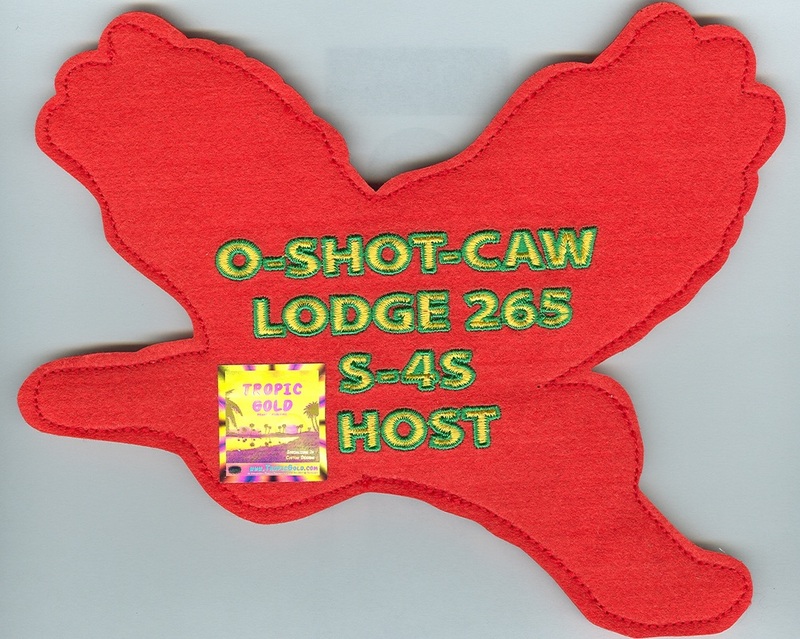 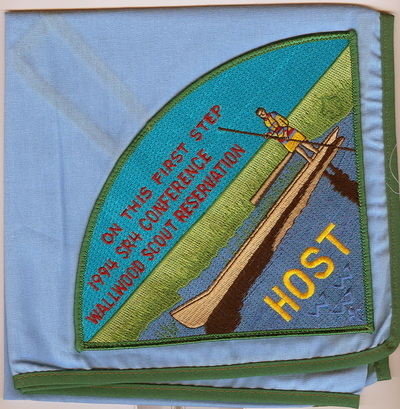 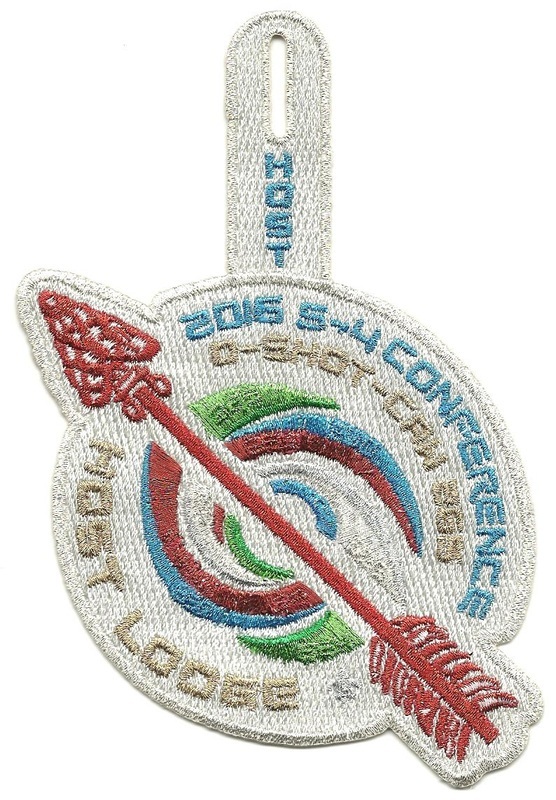 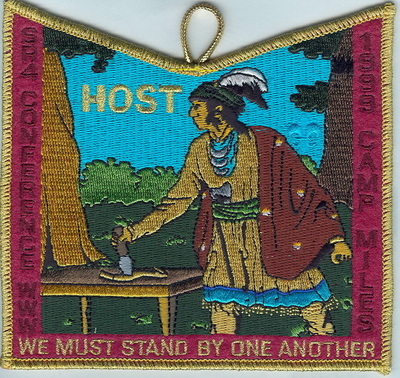 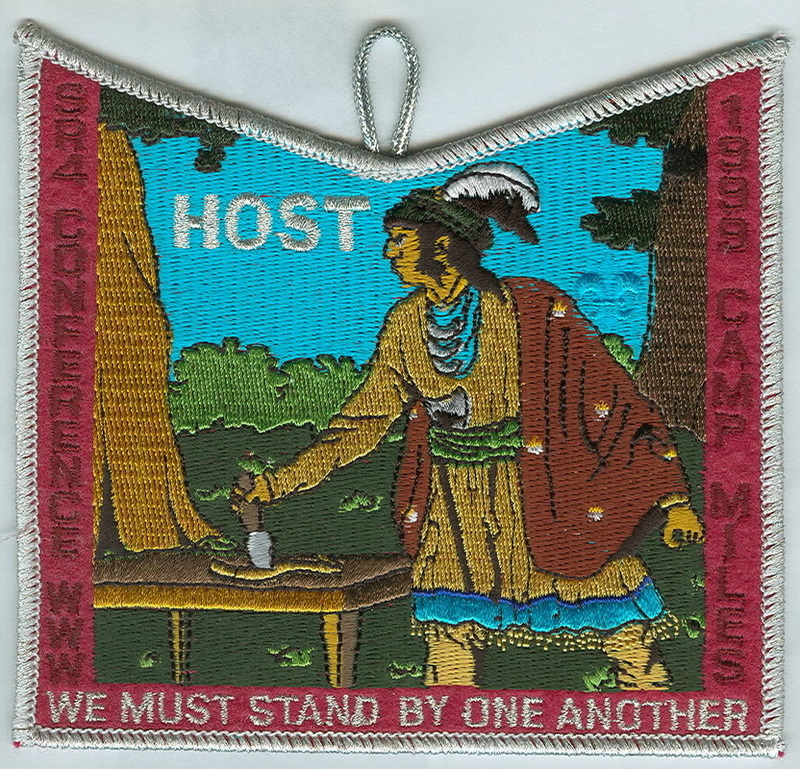 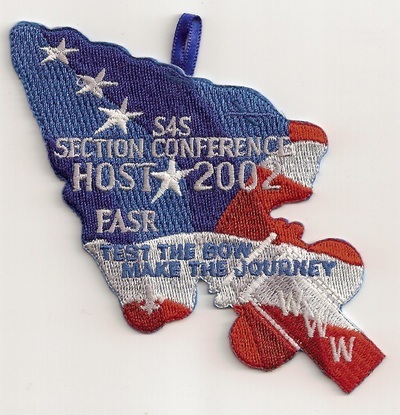 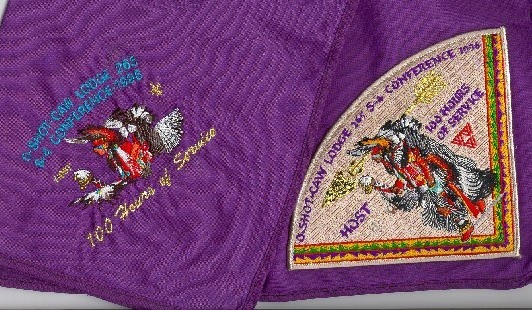 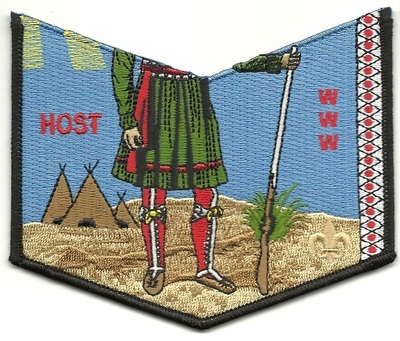 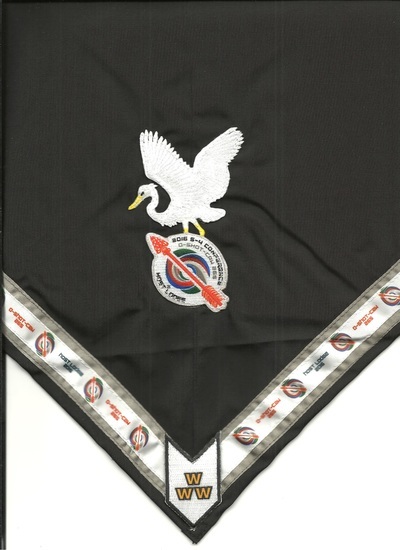 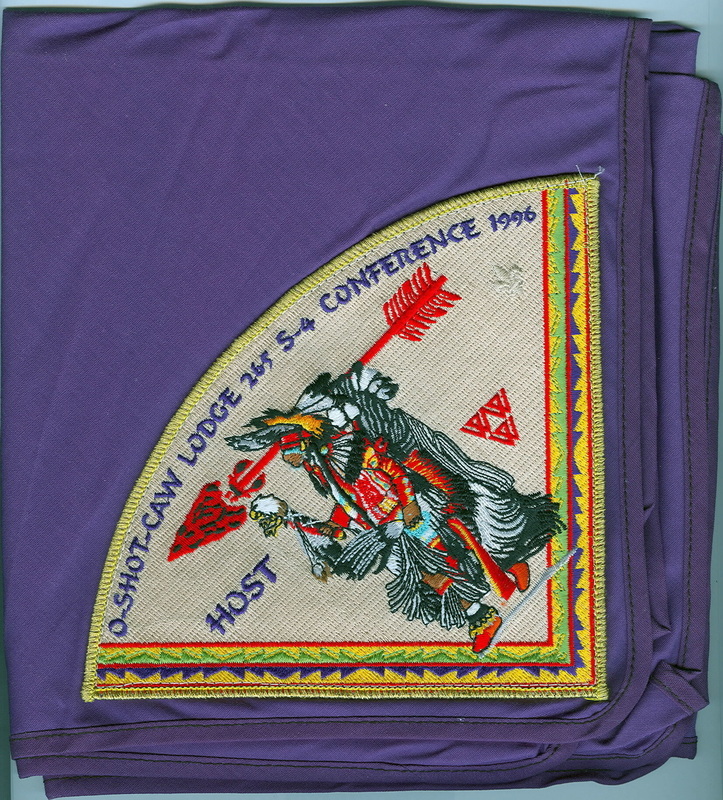 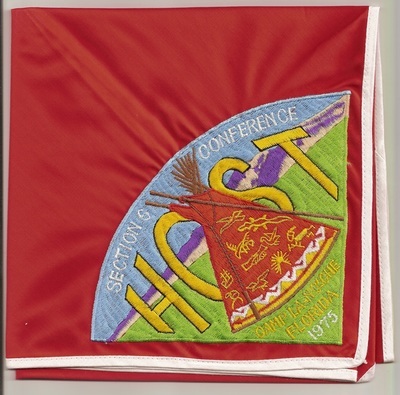 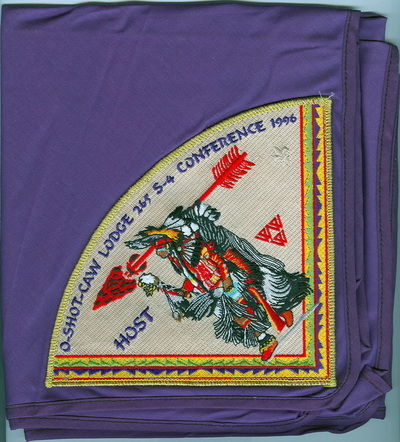 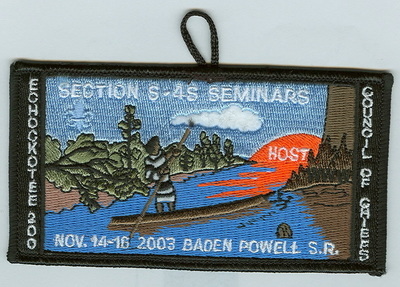 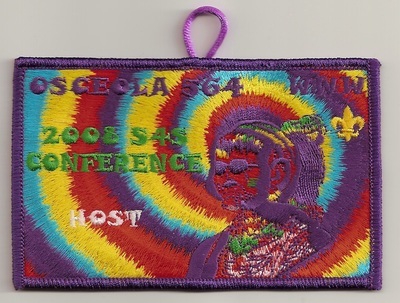 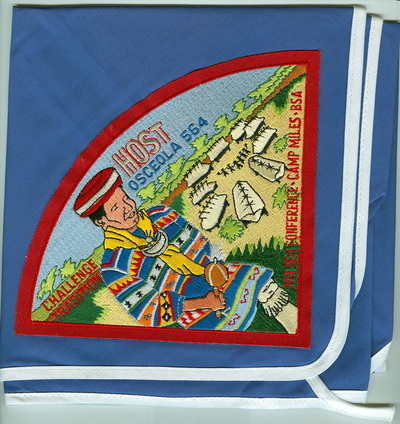 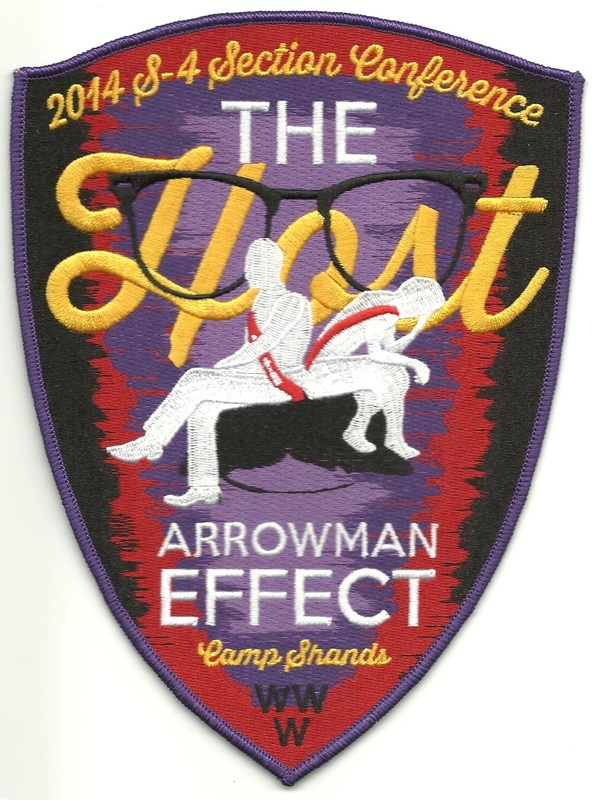 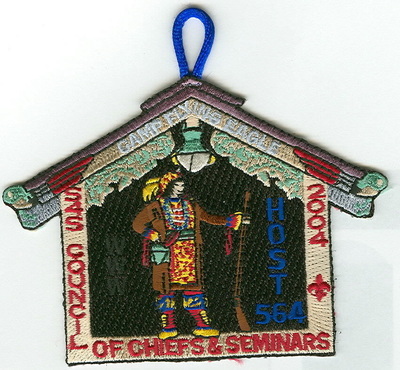 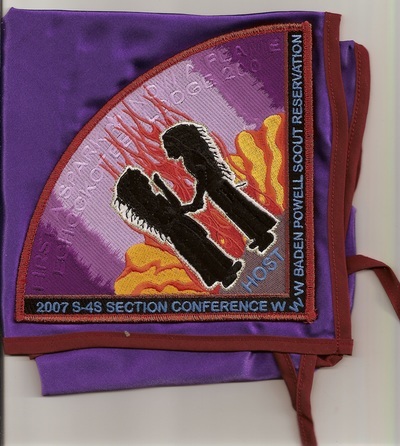 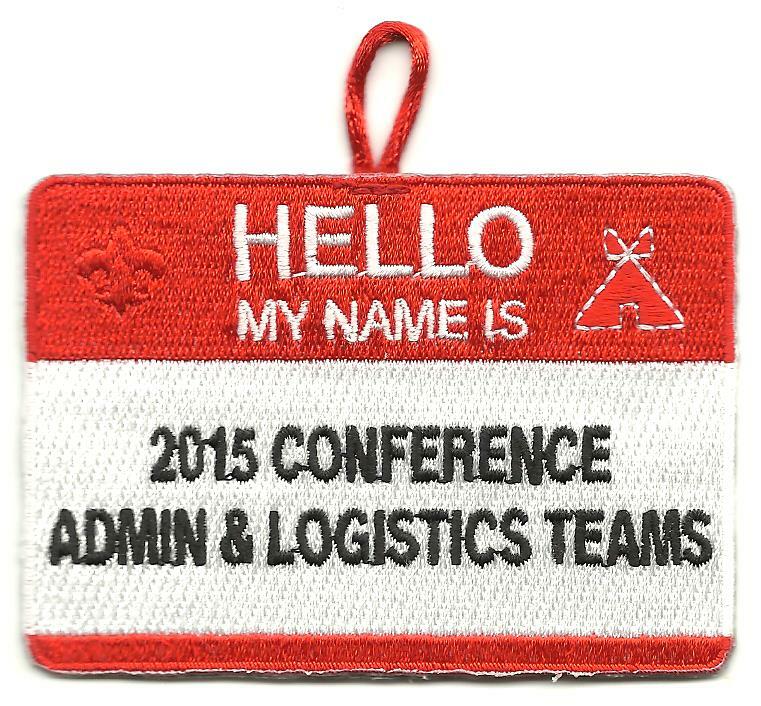 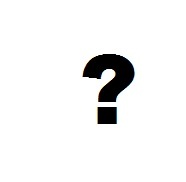 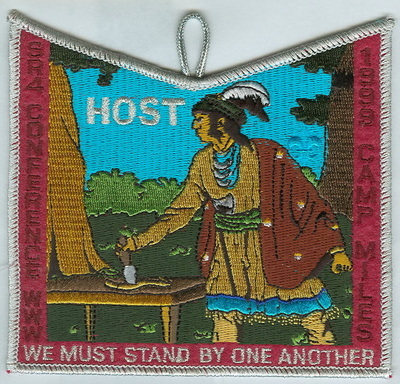 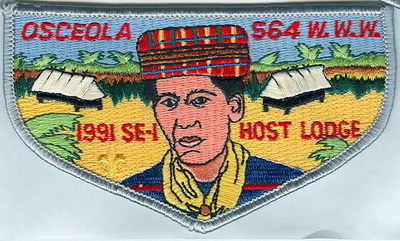 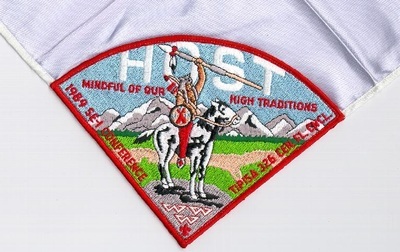 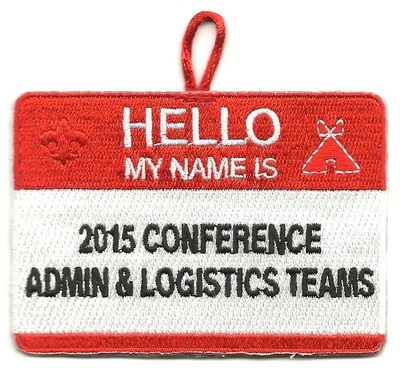 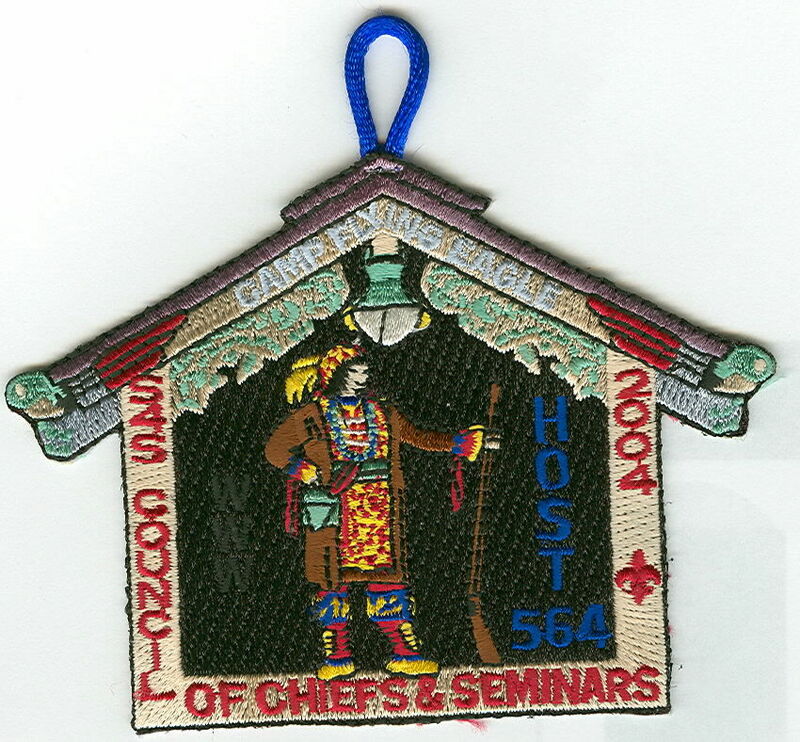 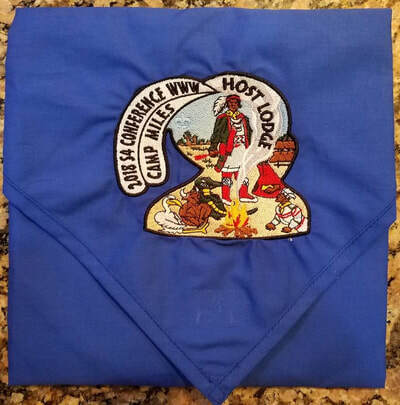 In some cases, the word "HOST" or lodge name does not appear, or the host version has a different color border, design feature, or neckerchief cloth than the standard issue for participants. 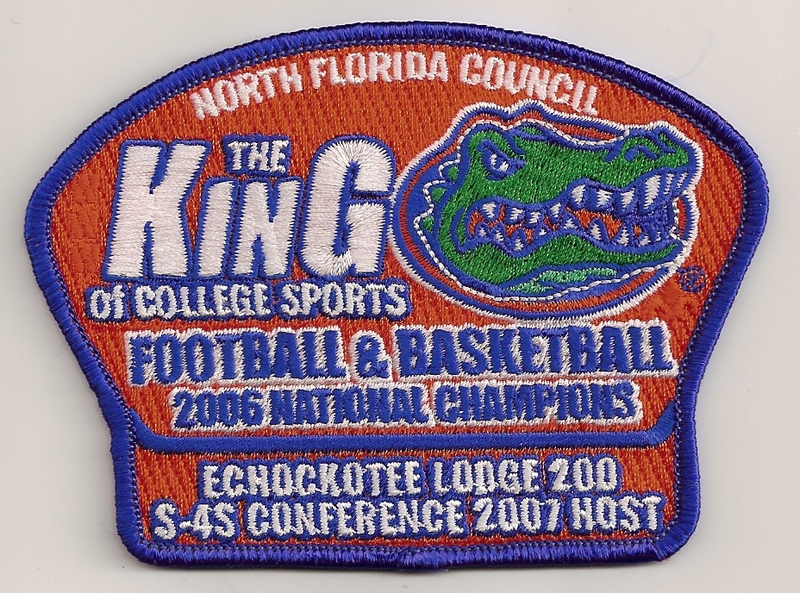 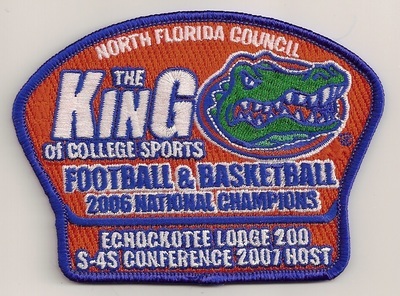 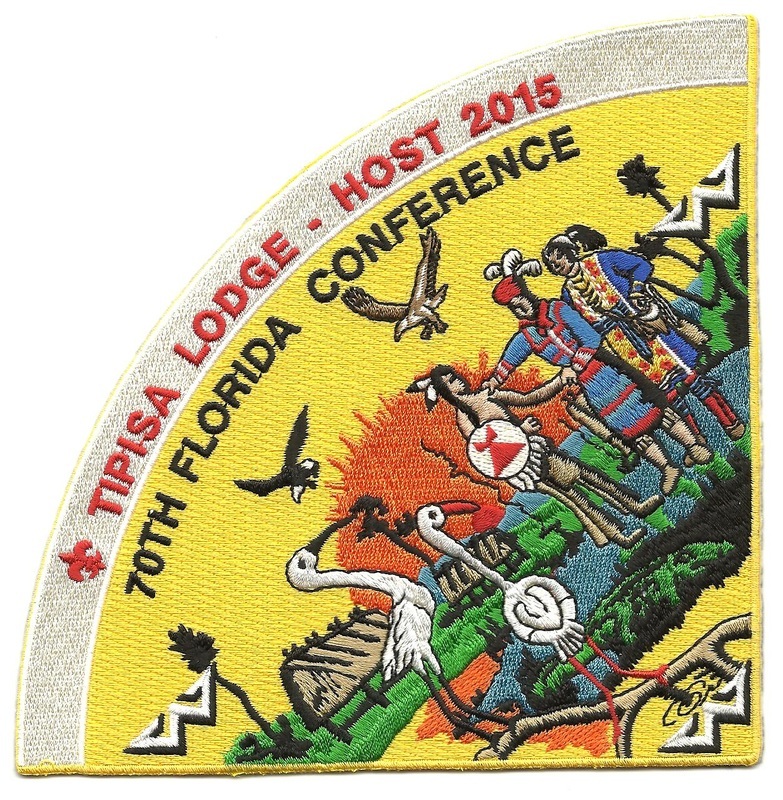 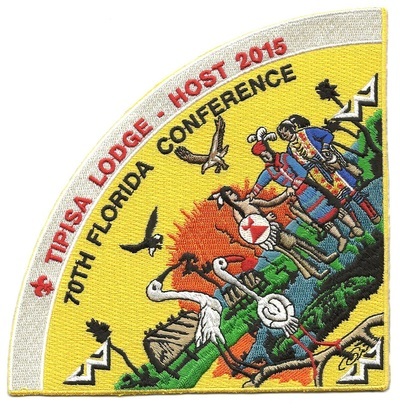 For Florida events, the lodge hosting the activity is responsible for the program for the event. 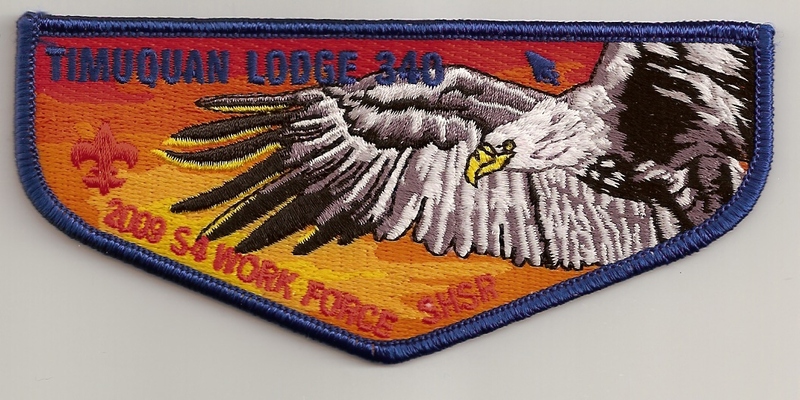 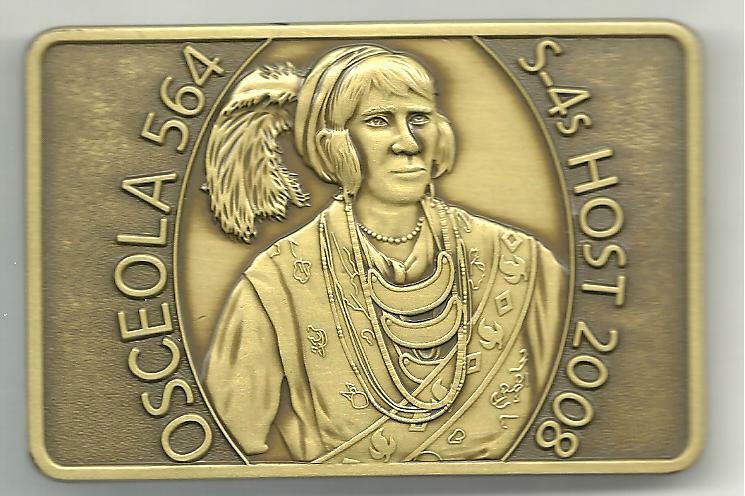 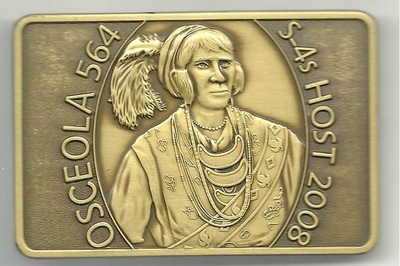 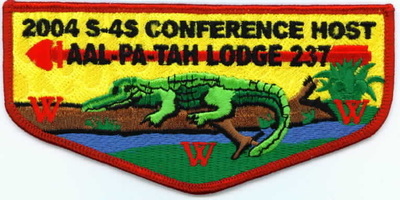 This differs from other Sections, where the host lodge is responsible for the physical location, and a separate staff runs the activities, creating "STAFF" emblems (exception is the 1999 Section S-4 Seminars, hosted by Alapaha Lodge 545, with separate "HOST" items for lodge members, and "STAFF" items for members of other lodges). 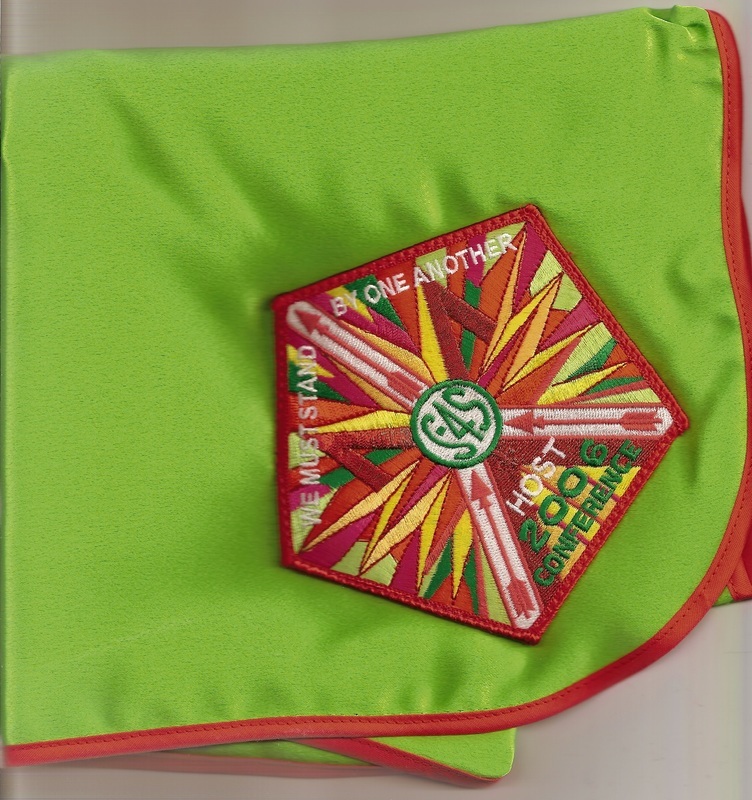 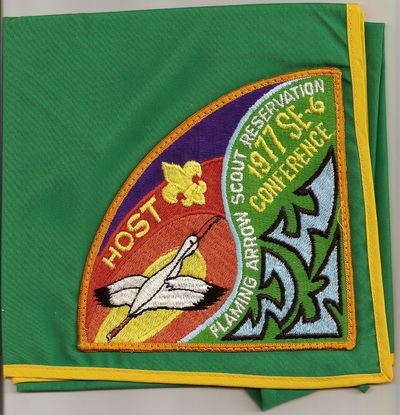 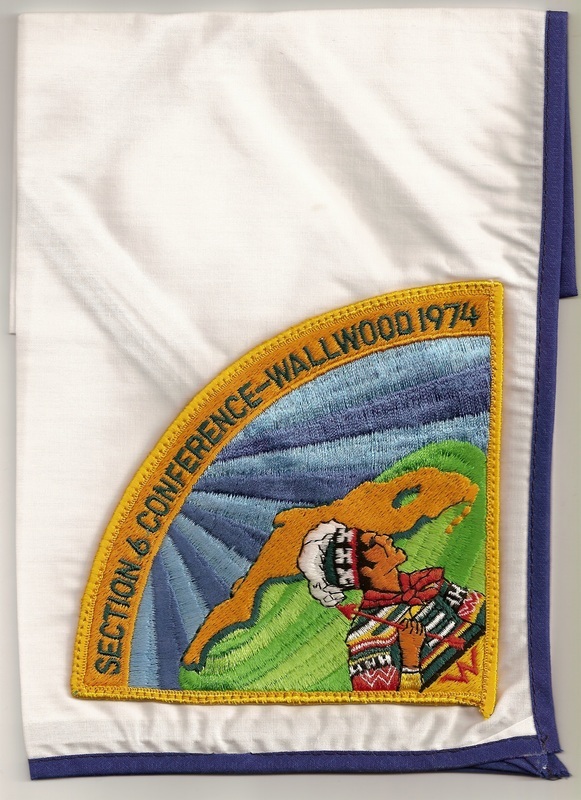 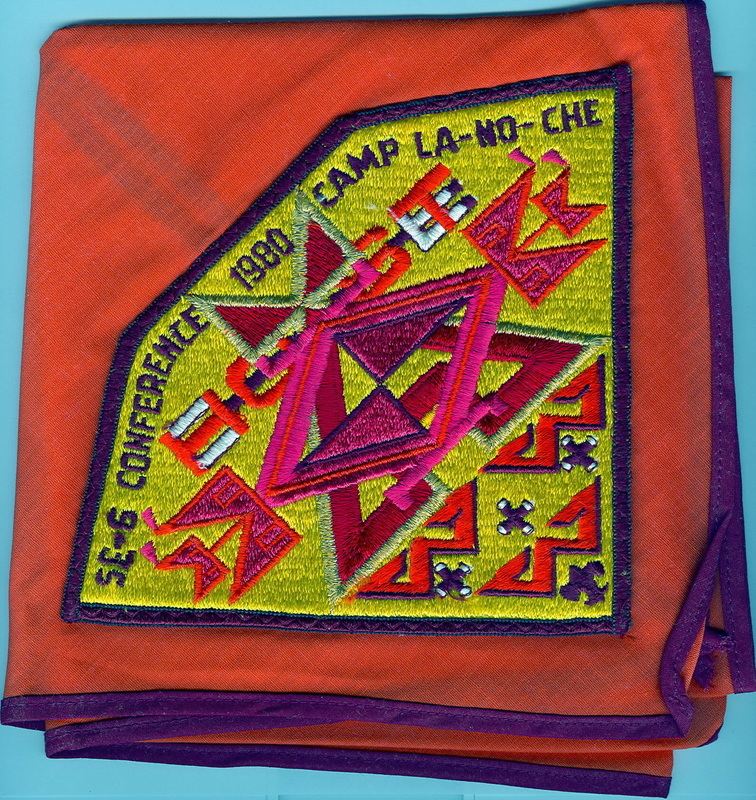 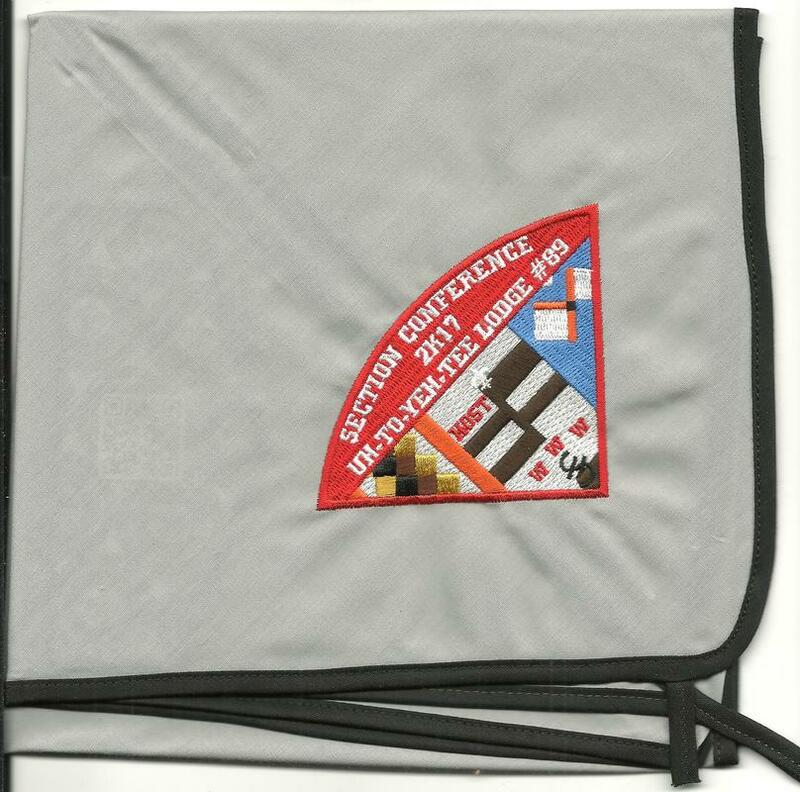 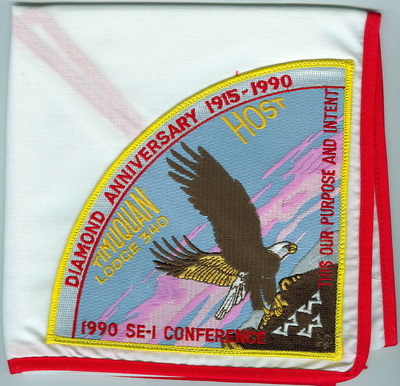 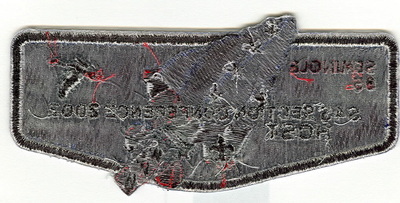 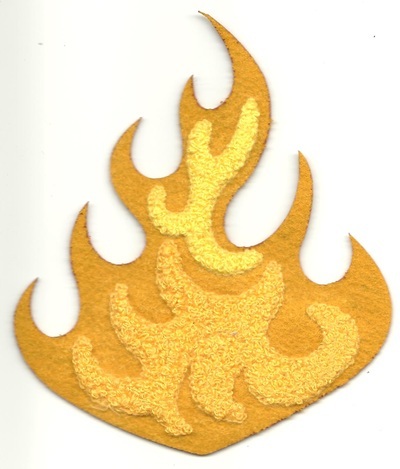 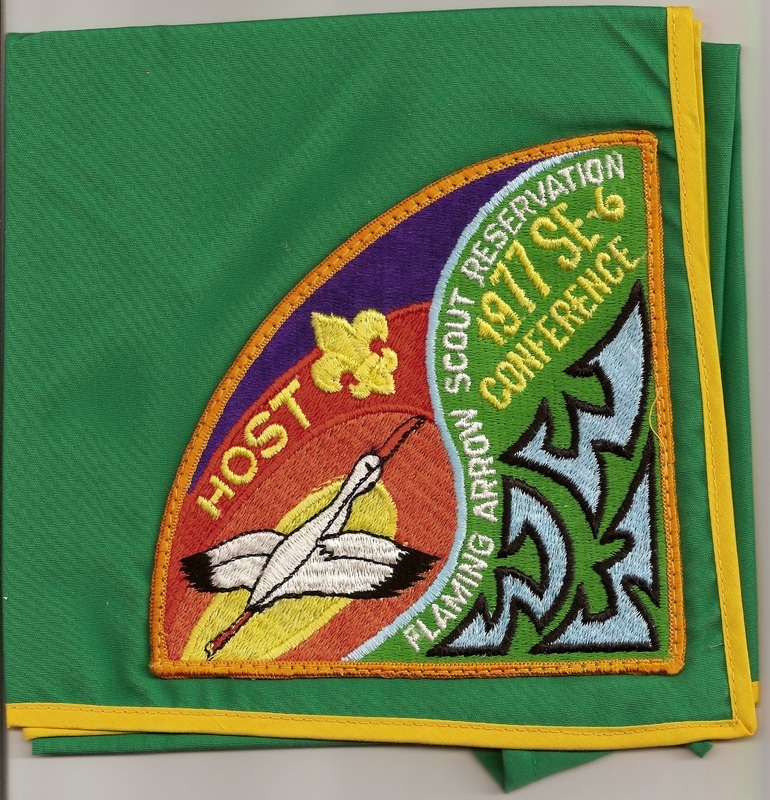 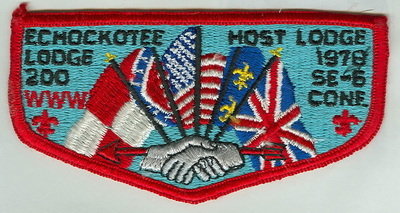 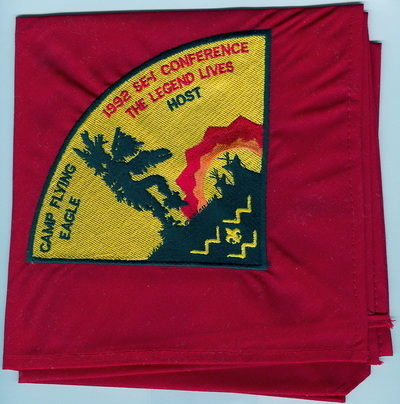 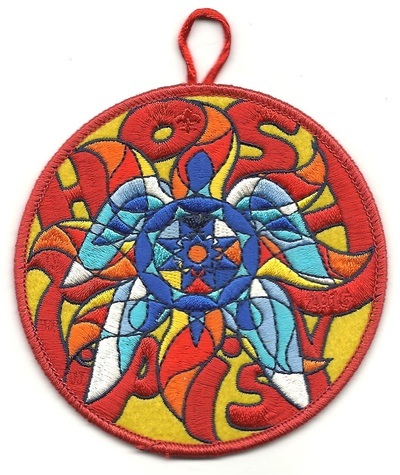 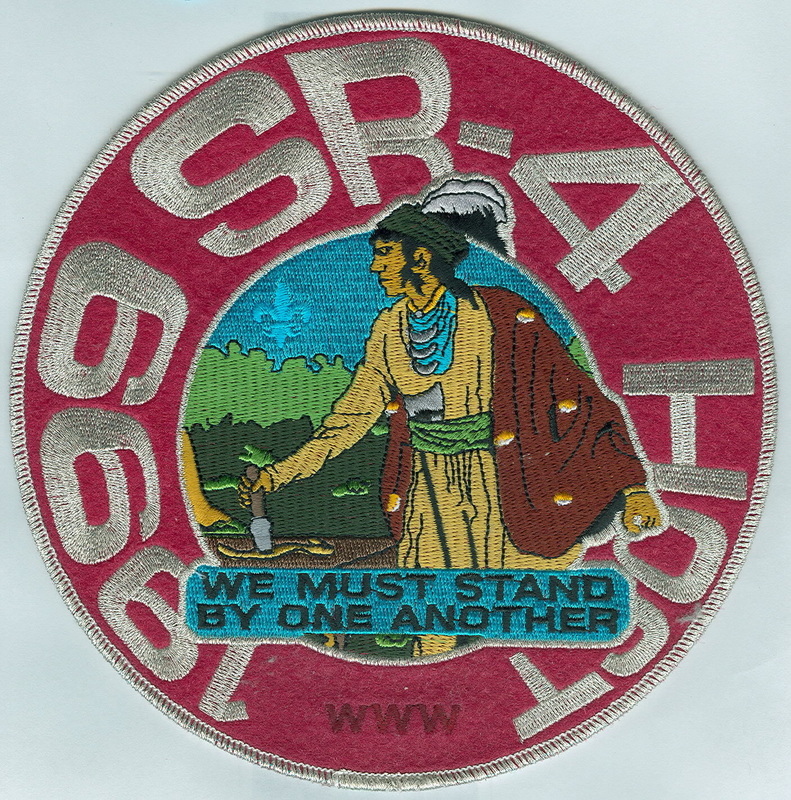 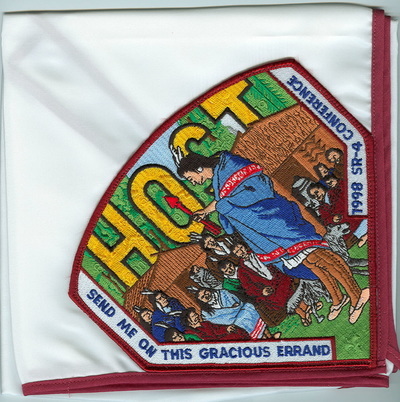 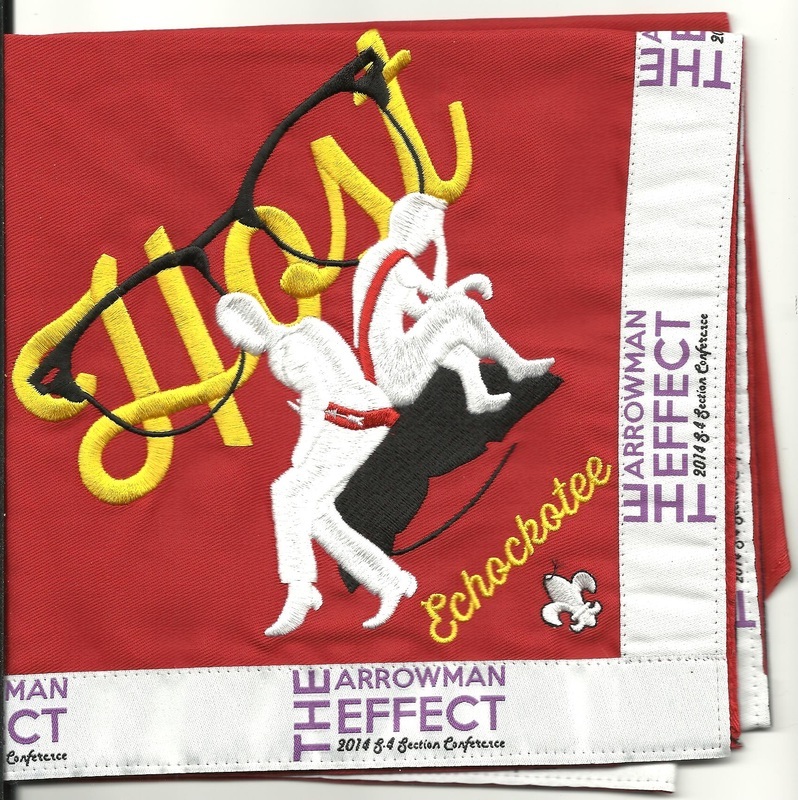 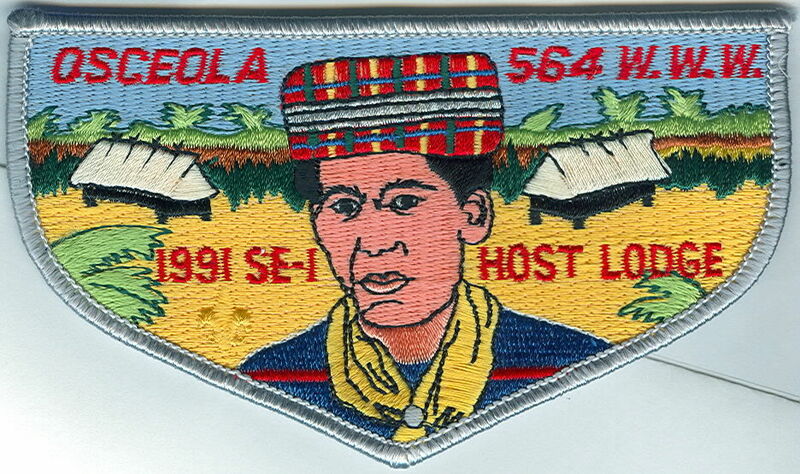 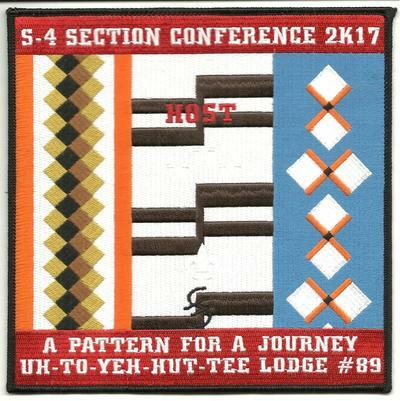 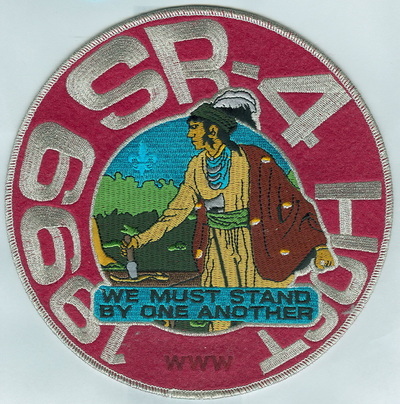 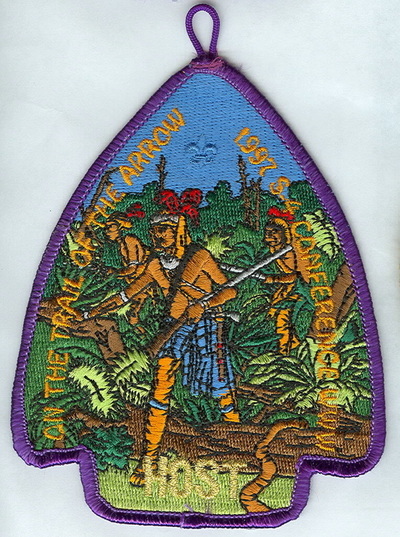 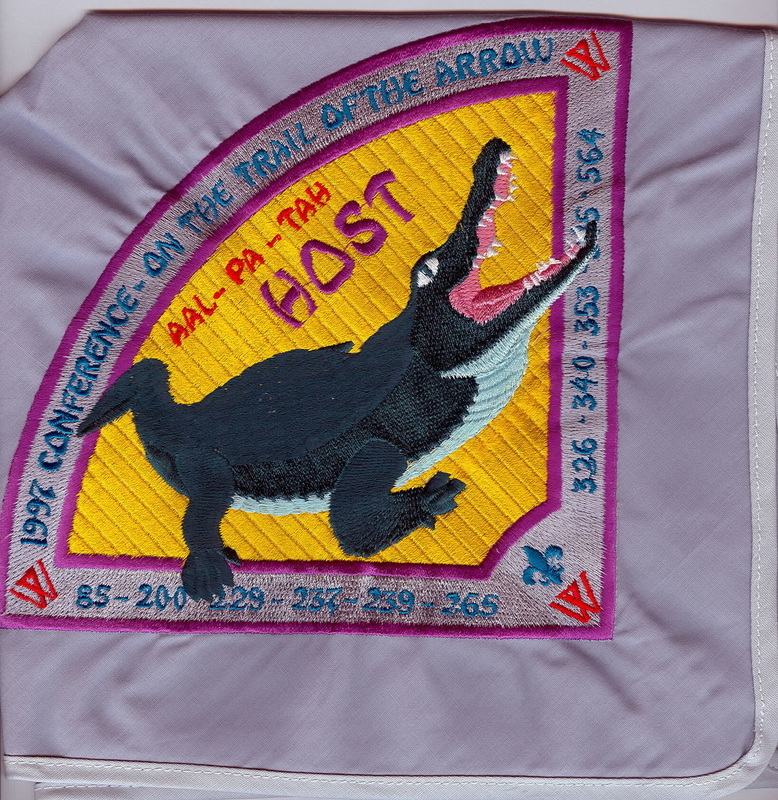 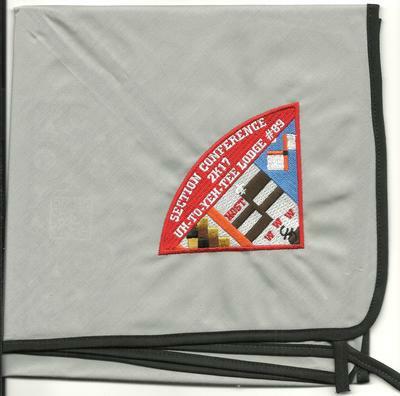 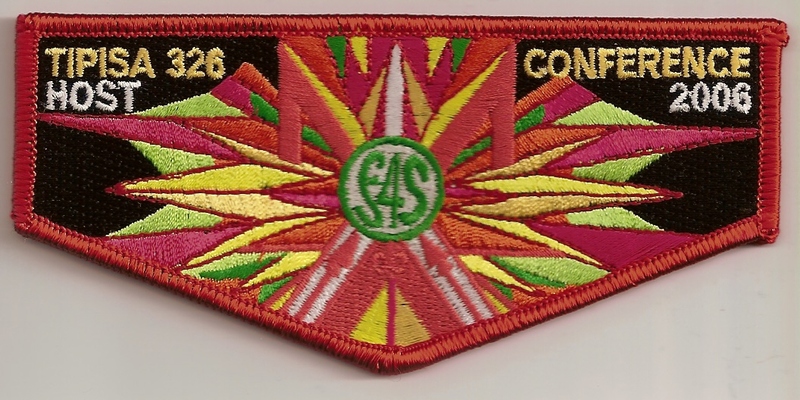 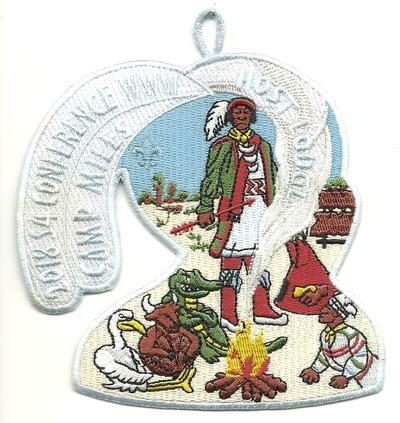 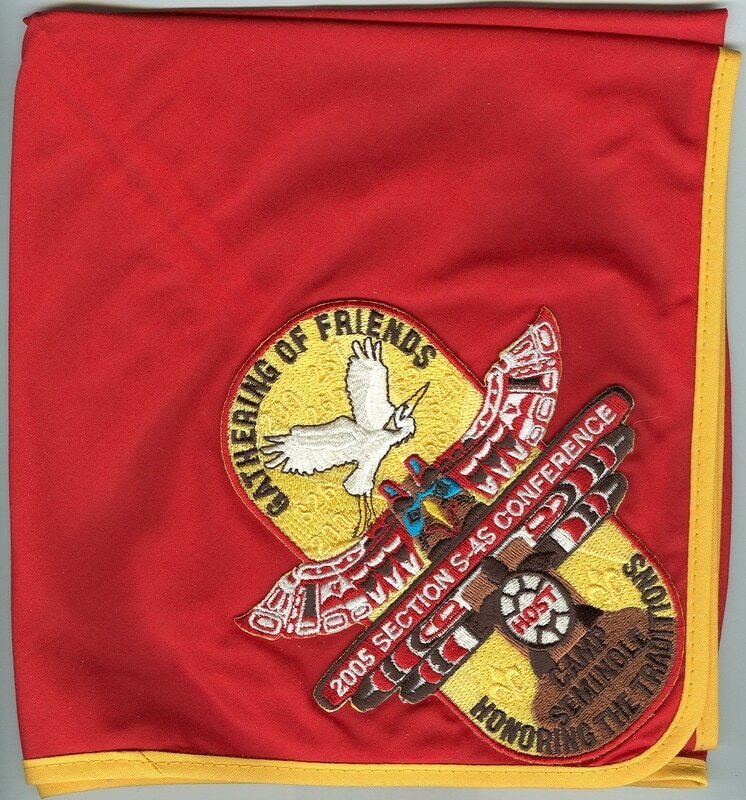 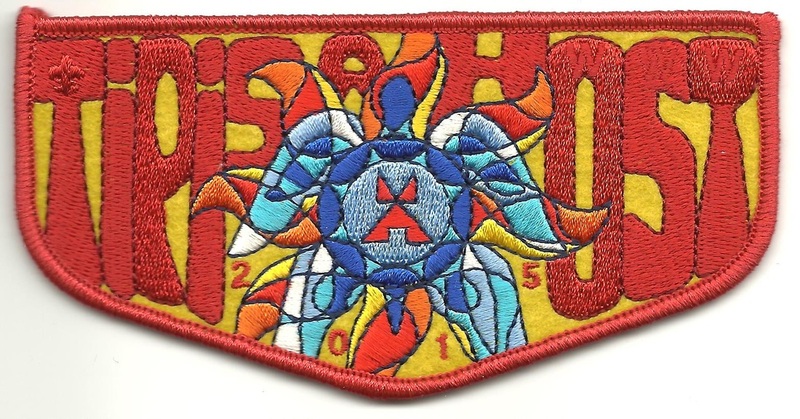 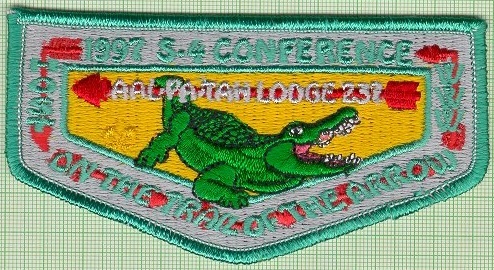 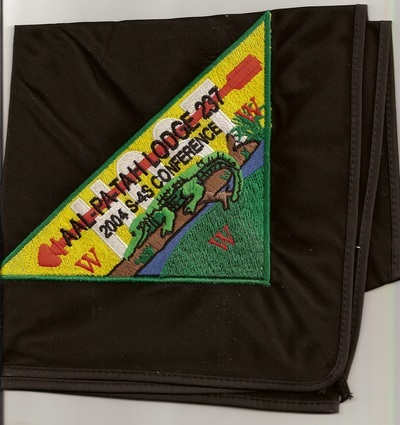 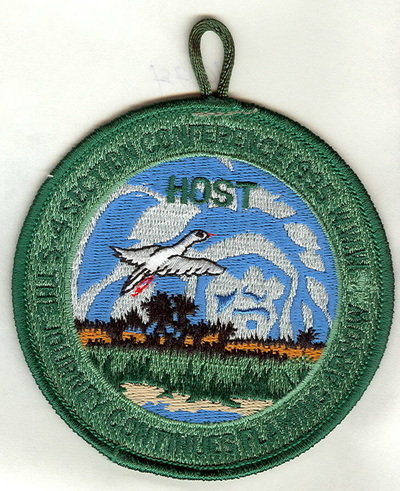 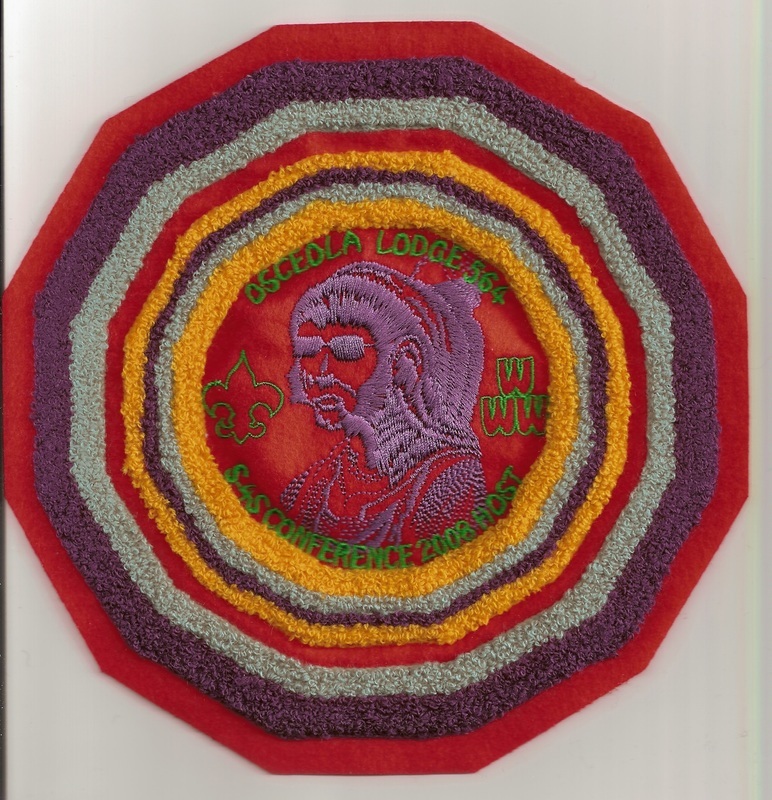 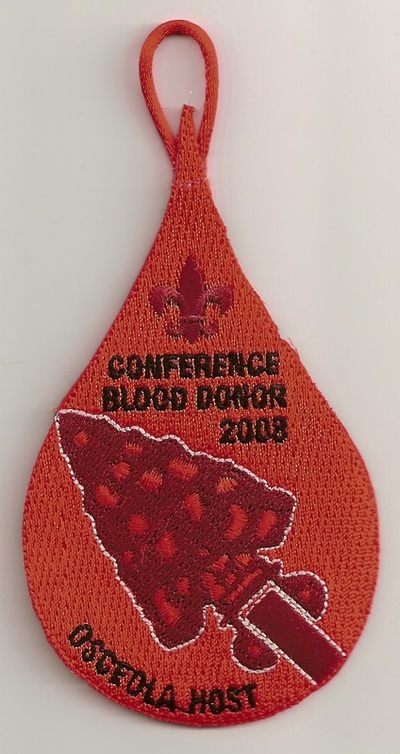 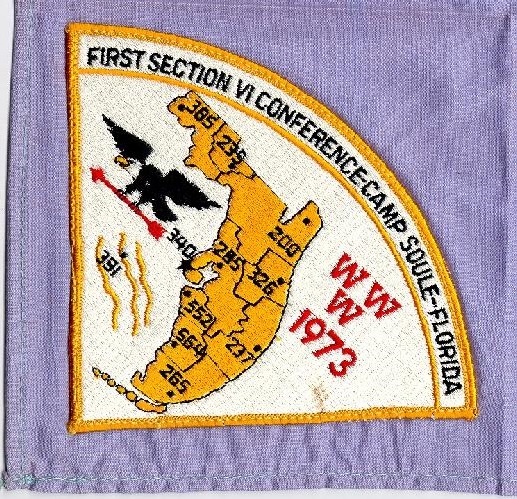 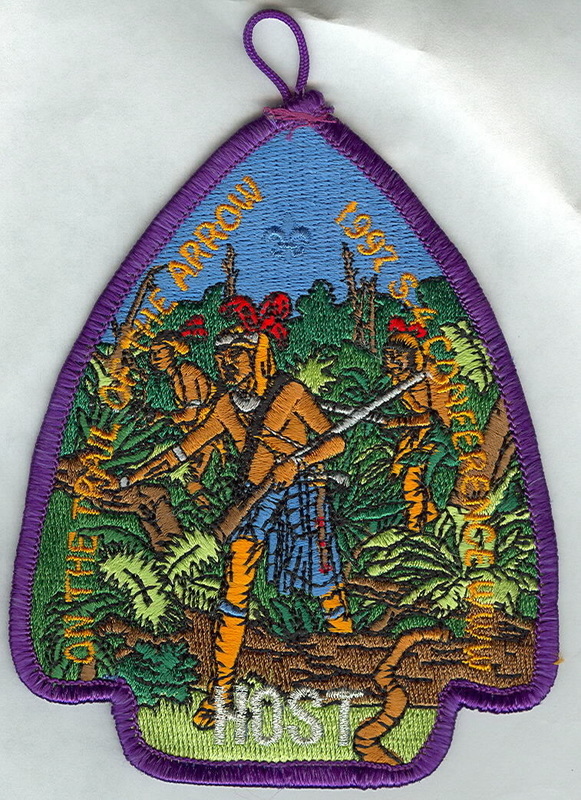 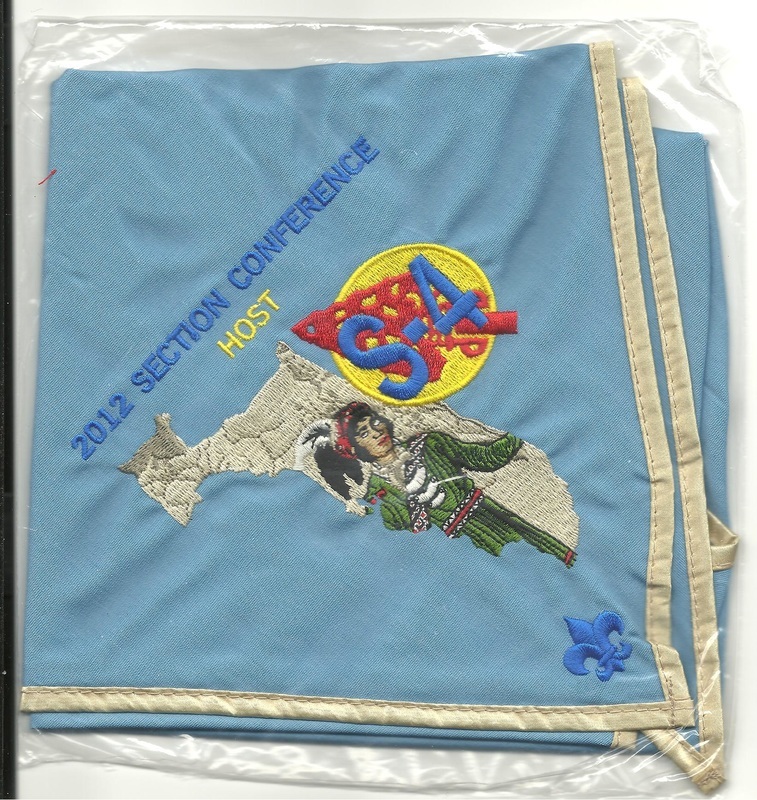 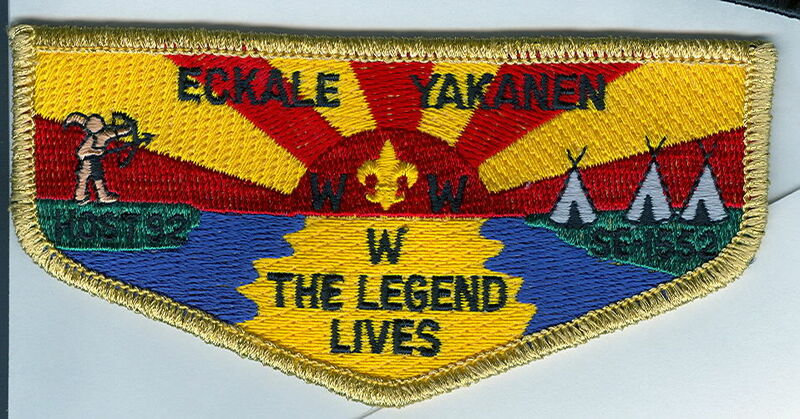 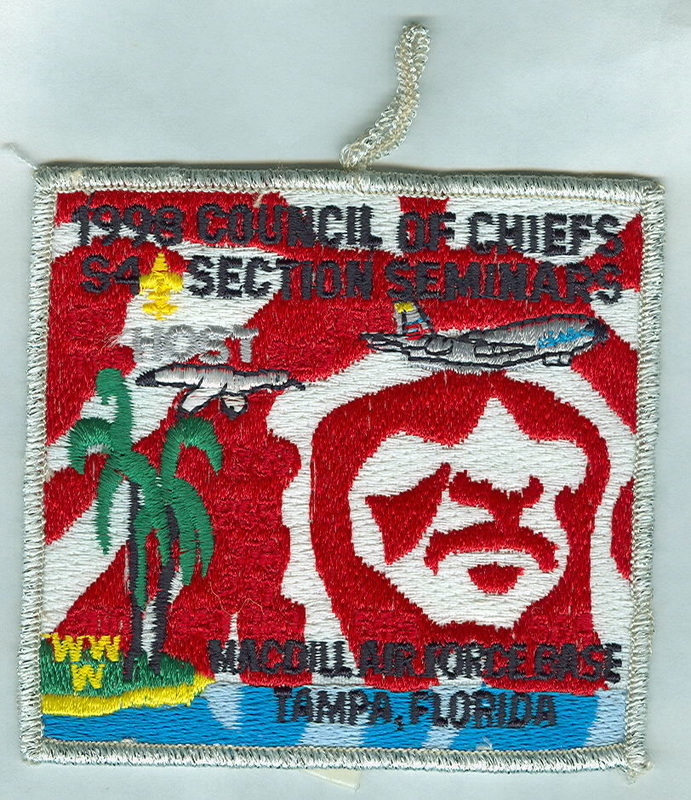 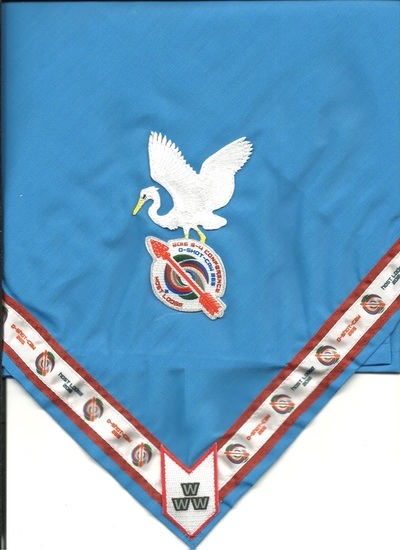 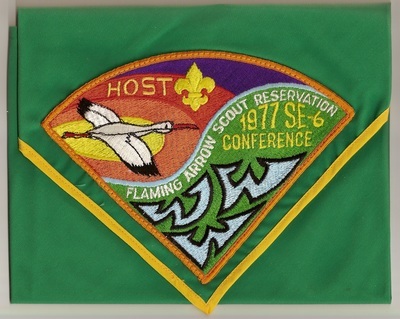 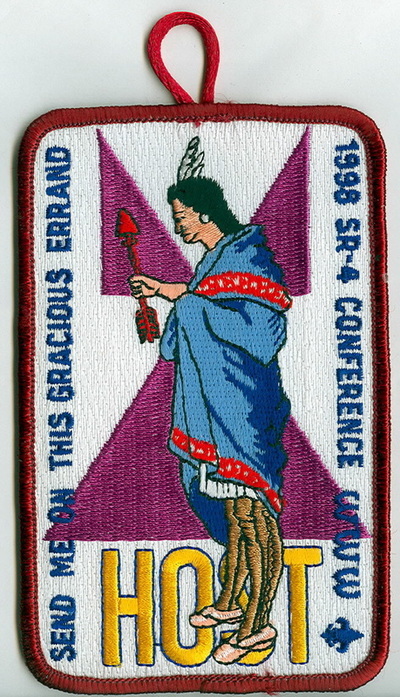 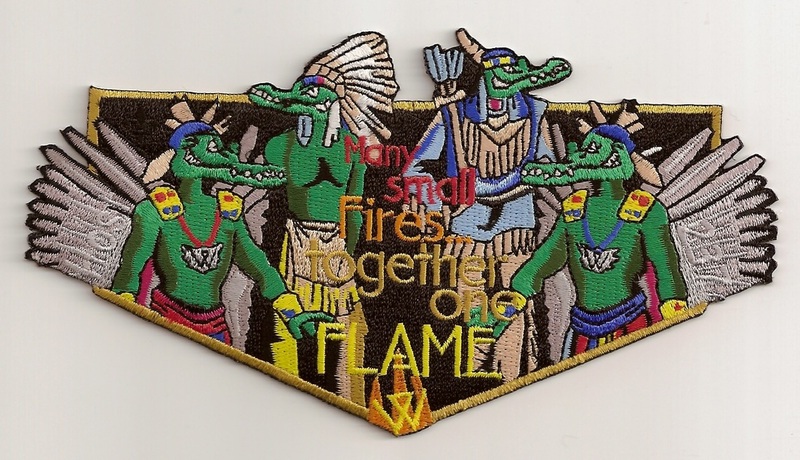 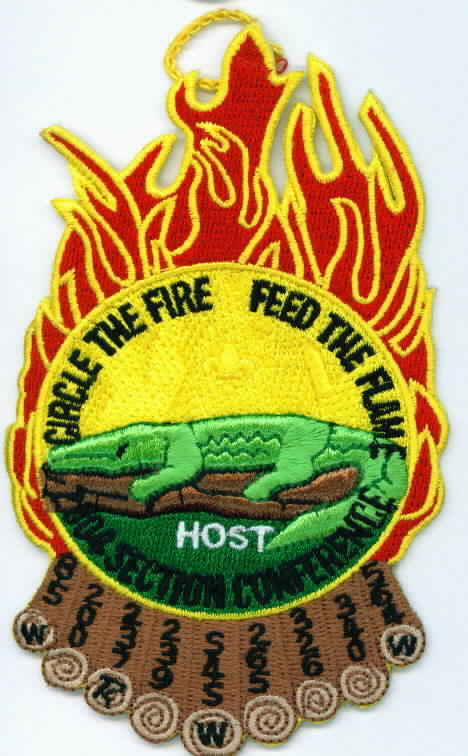 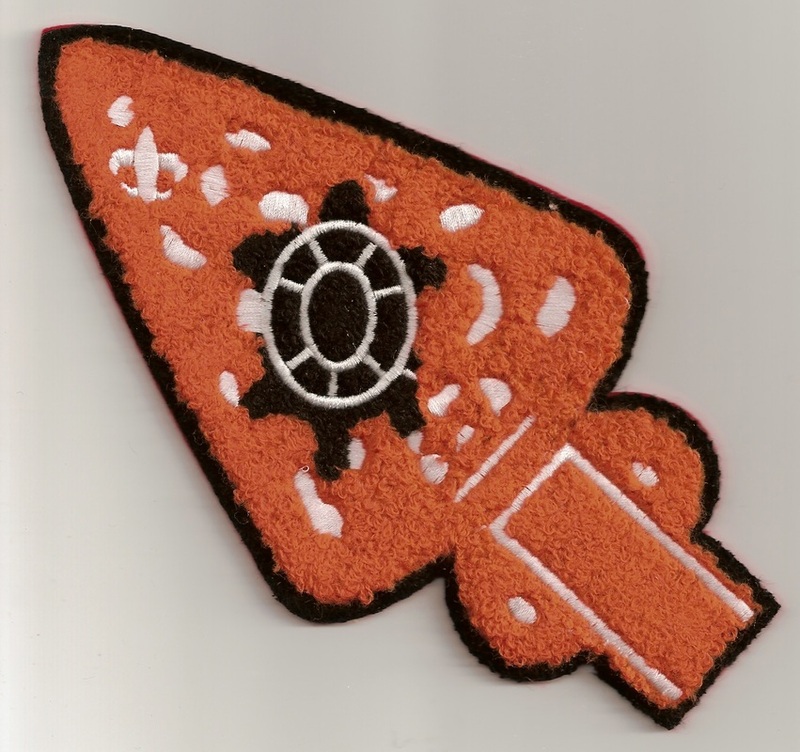 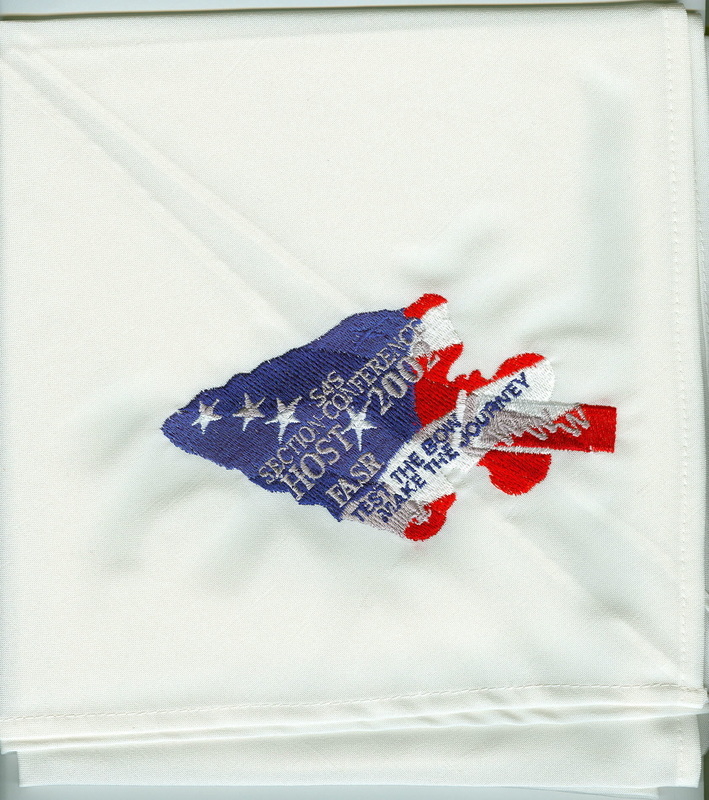 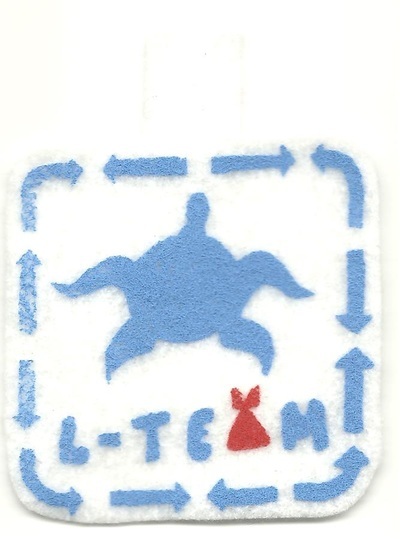 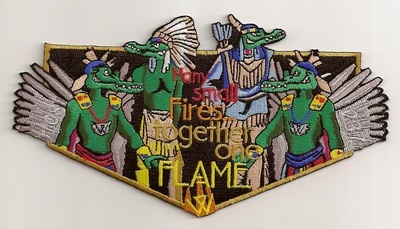 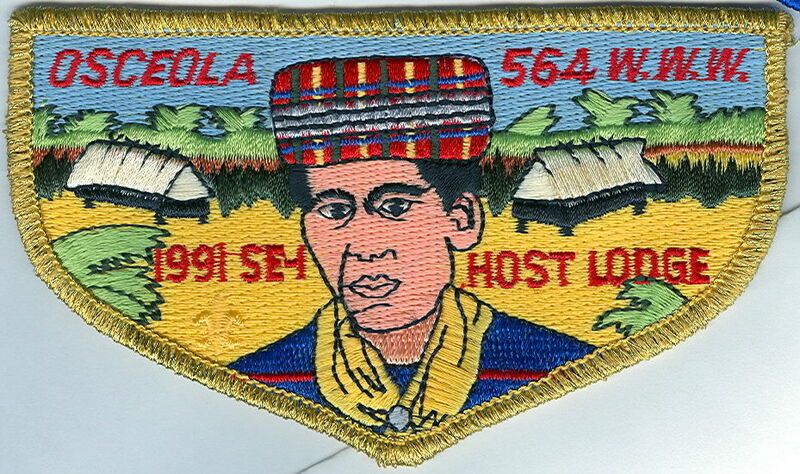 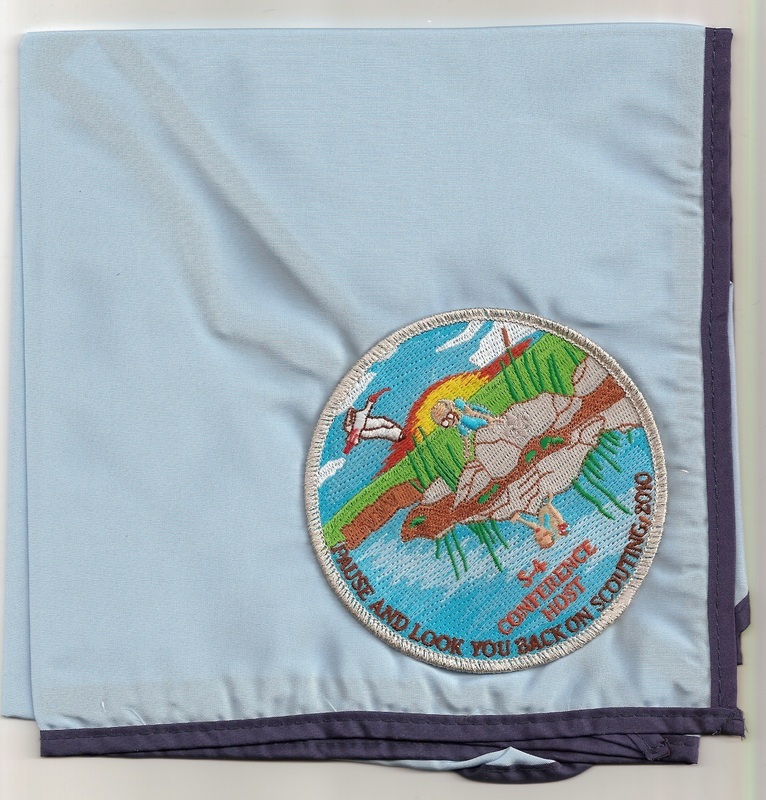 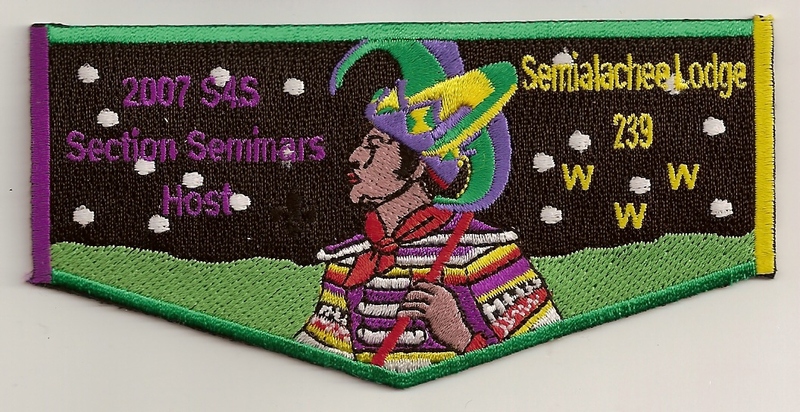 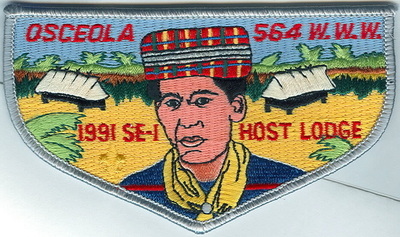 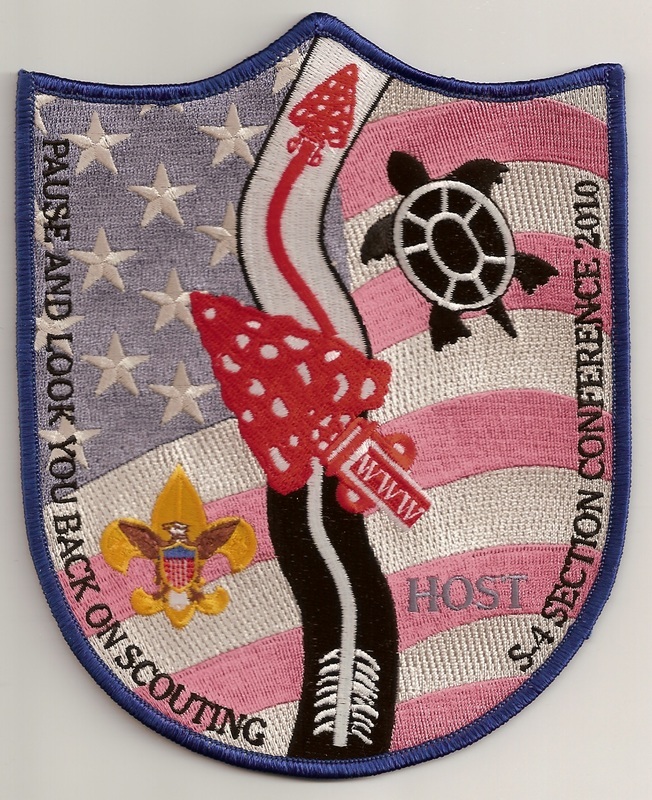 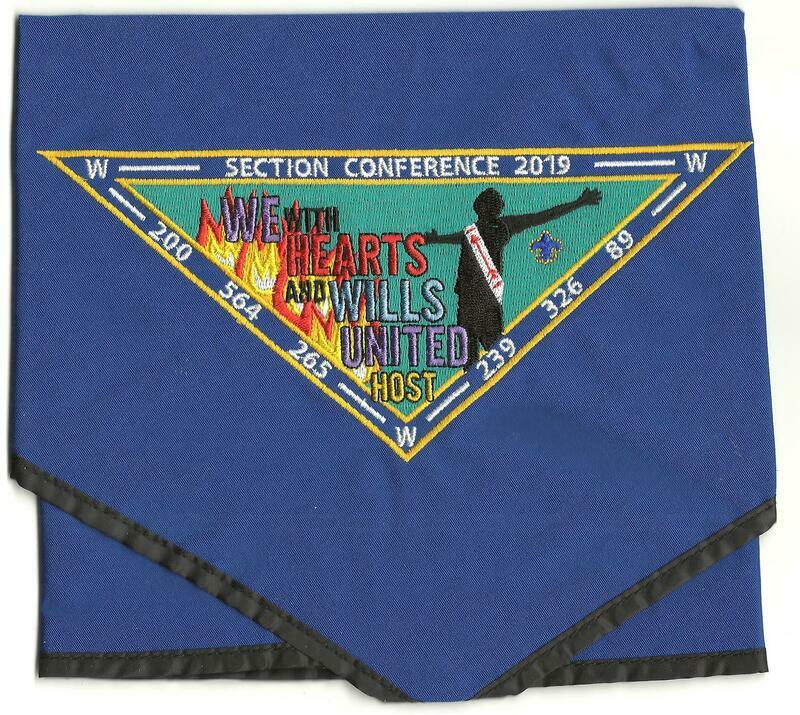 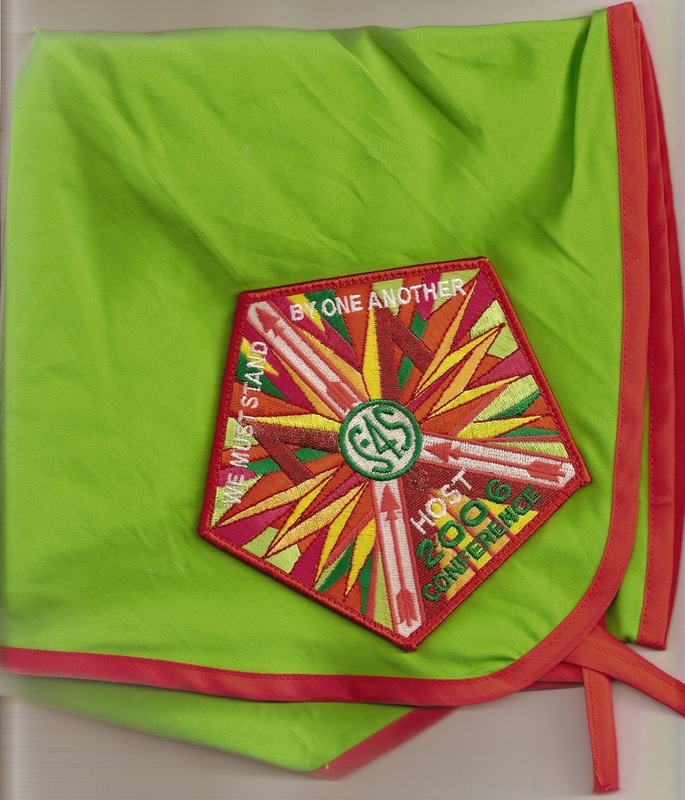 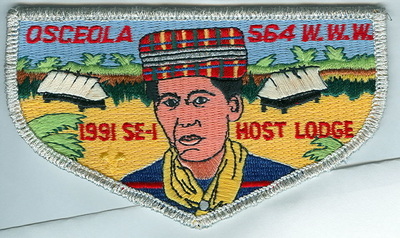 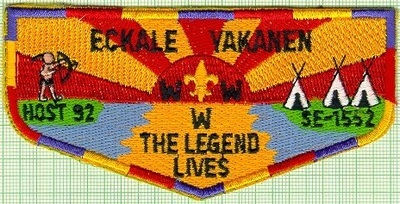 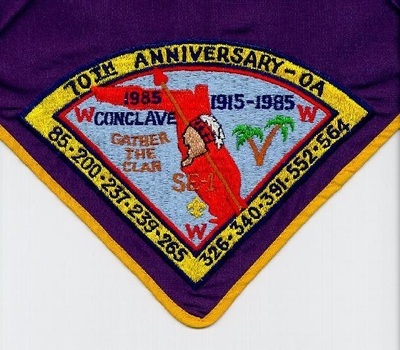 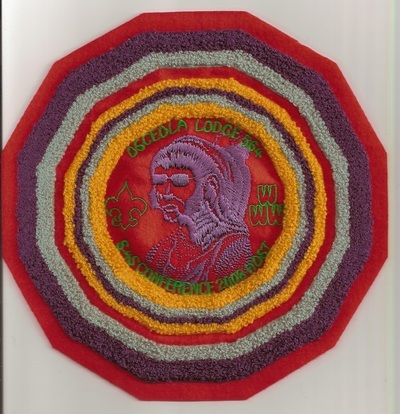 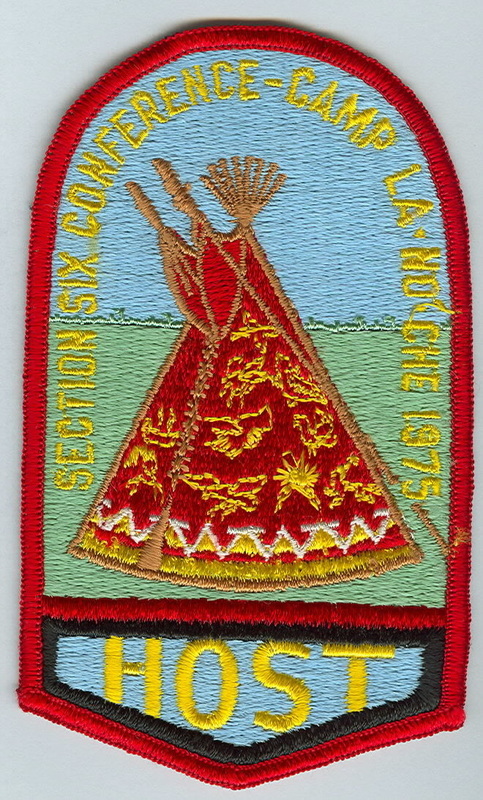 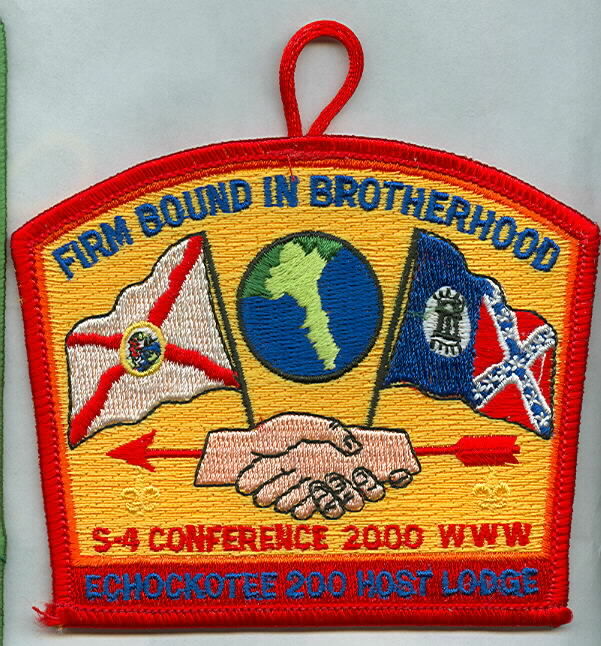 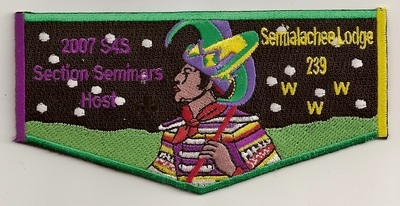 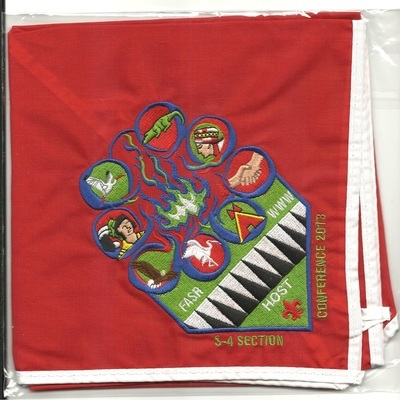 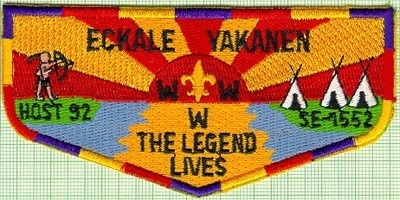 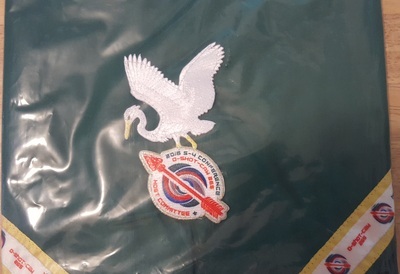 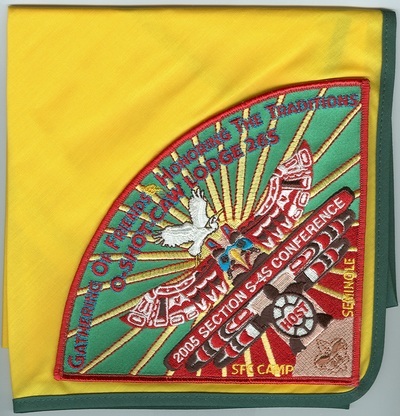 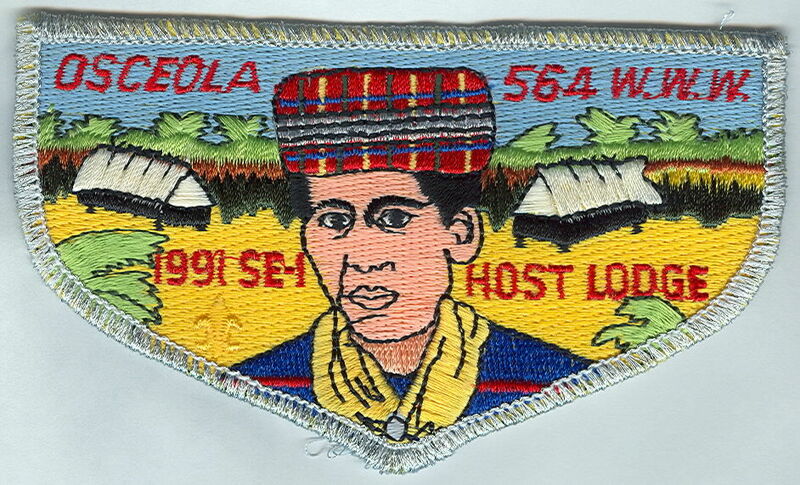 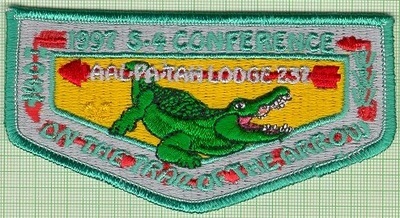 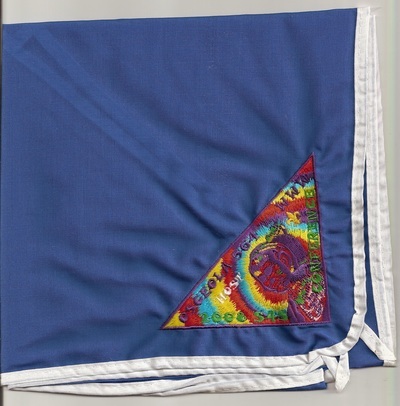 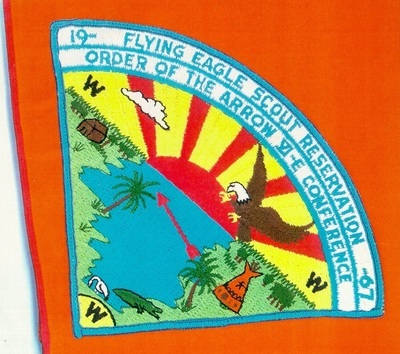 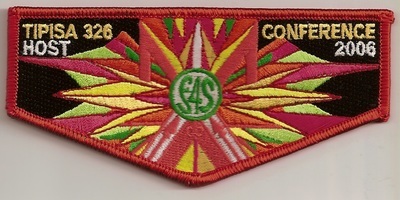 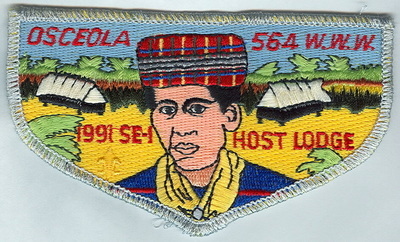 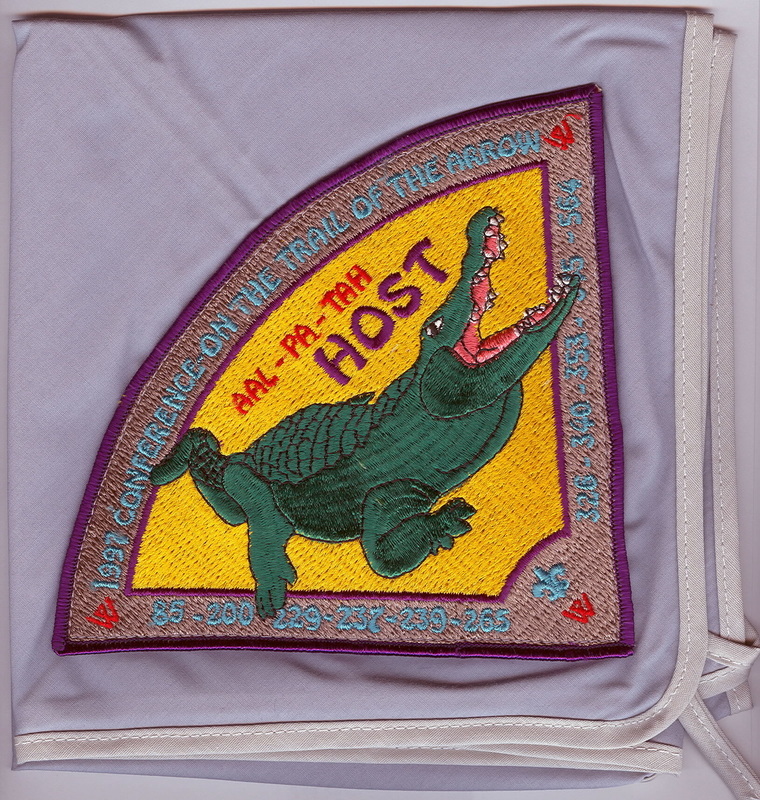 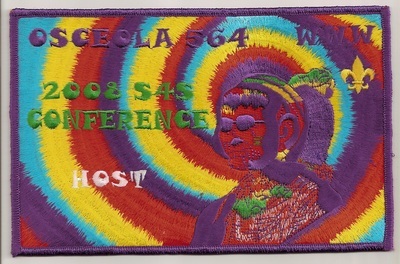 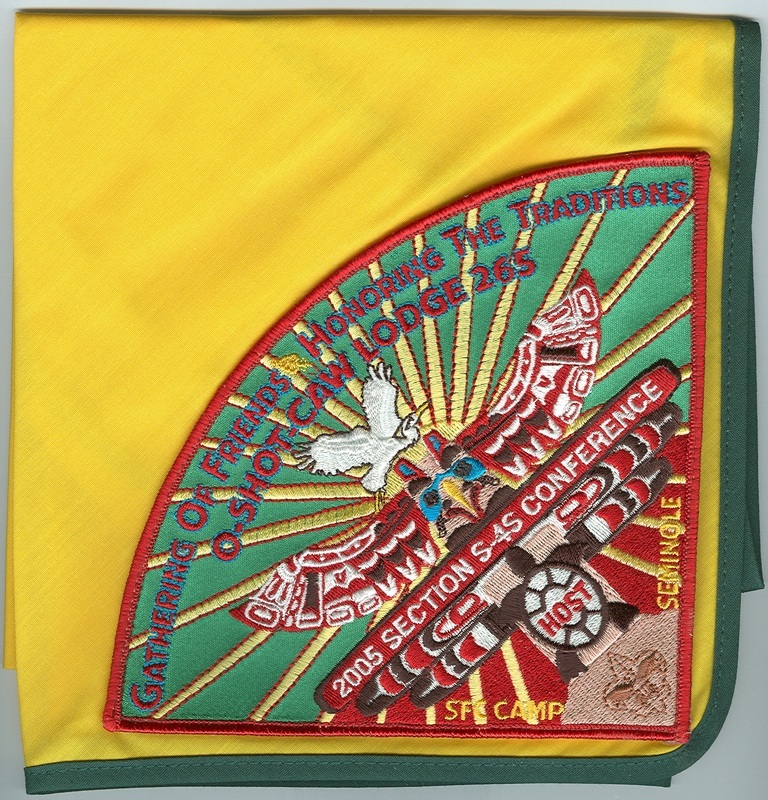 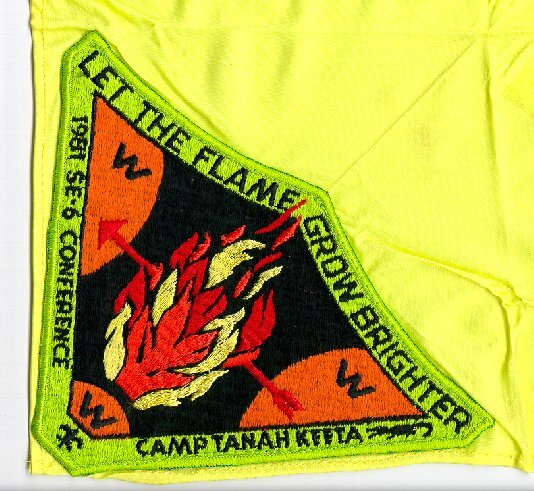 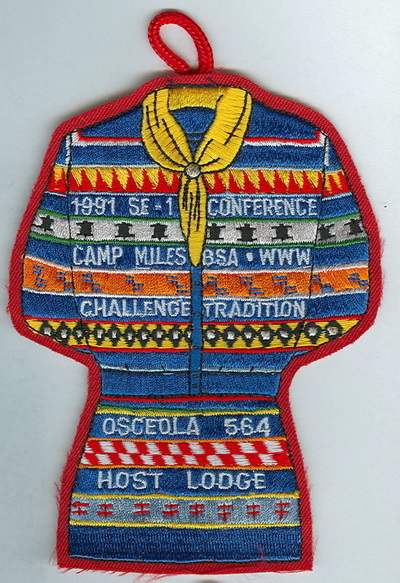 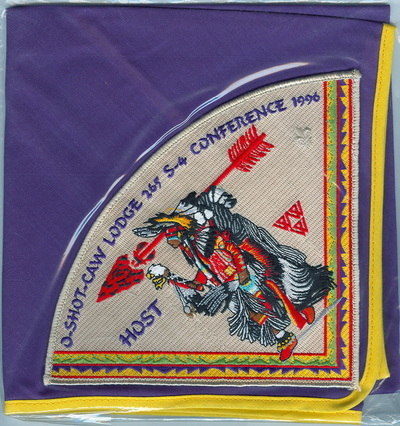 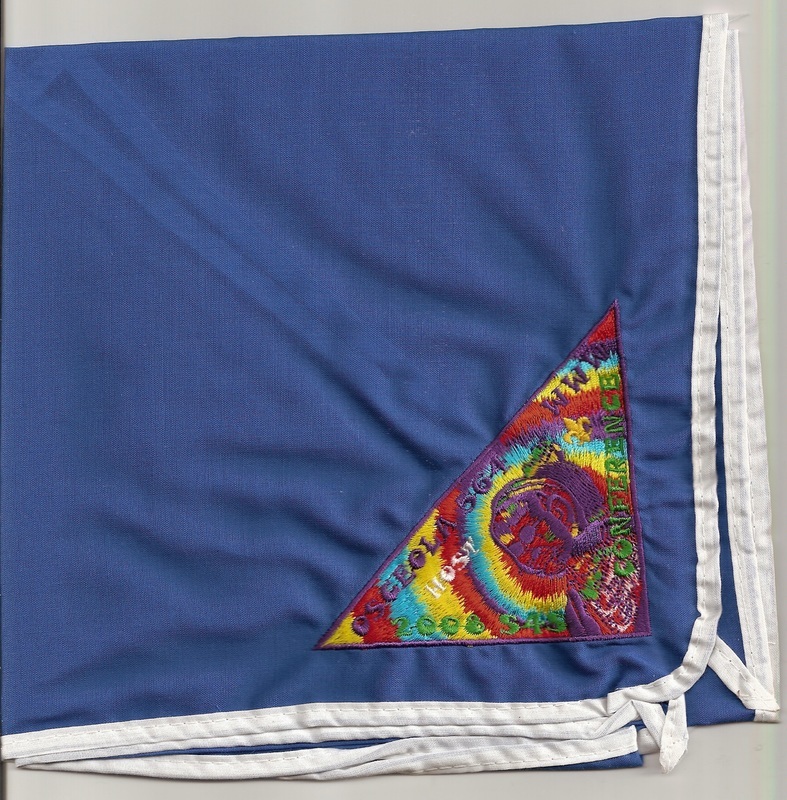 The first Florida host lodge - issued items were neckerchiefs for the 1967 and 1968 Area 6-E Conferences, with the regular activity neckerchief patch sewn on a different colored cloth. 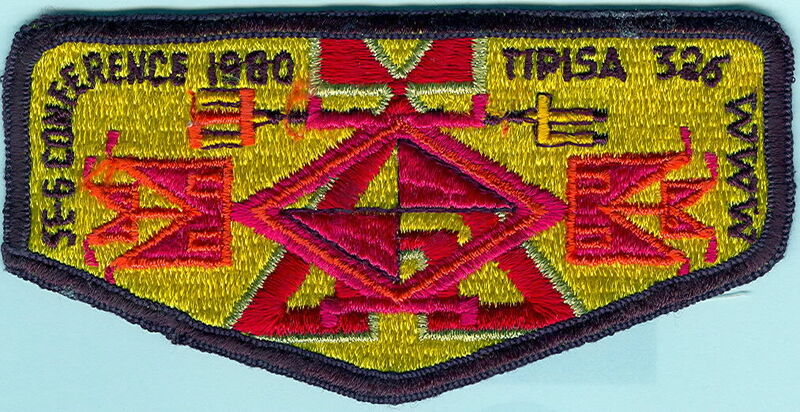 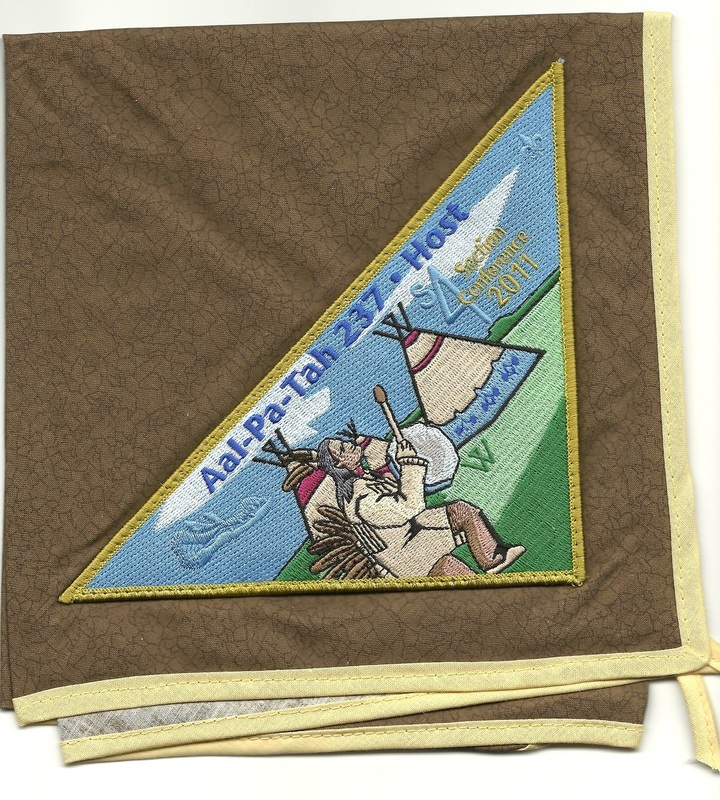 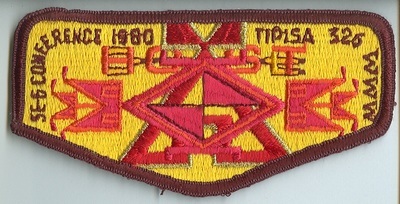 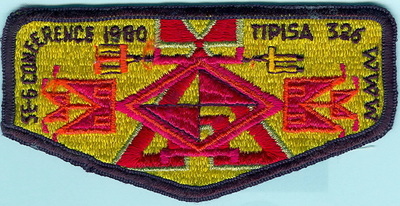 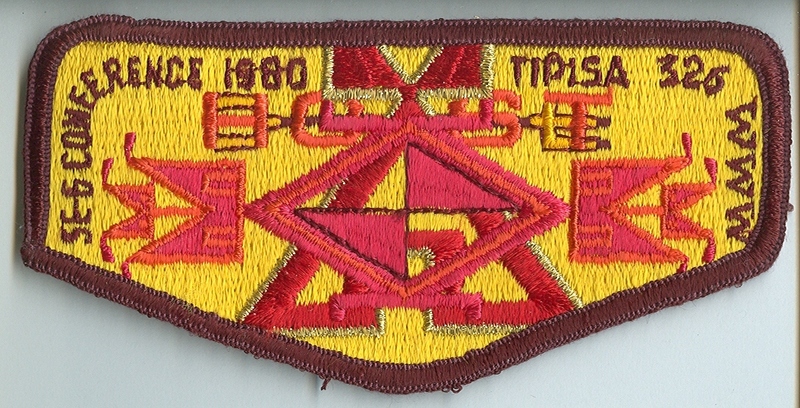 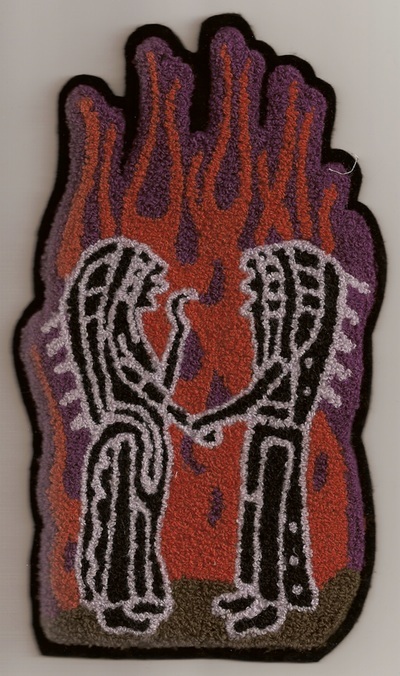 The first host flap was issued by Aal-Pa-Tah Lodge 237 in 1972. 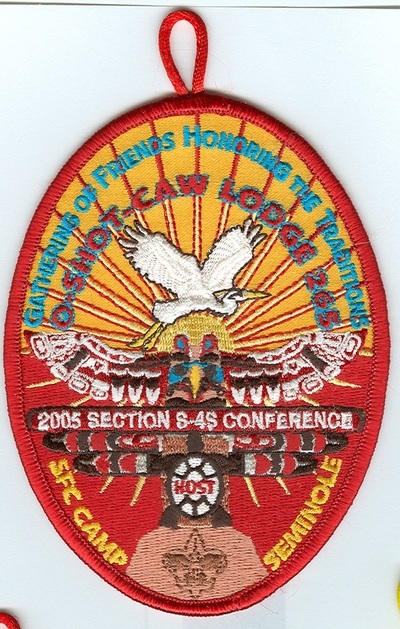 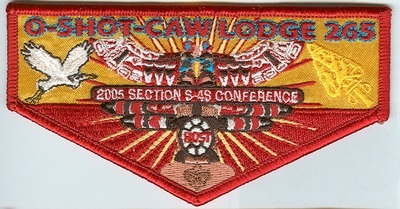 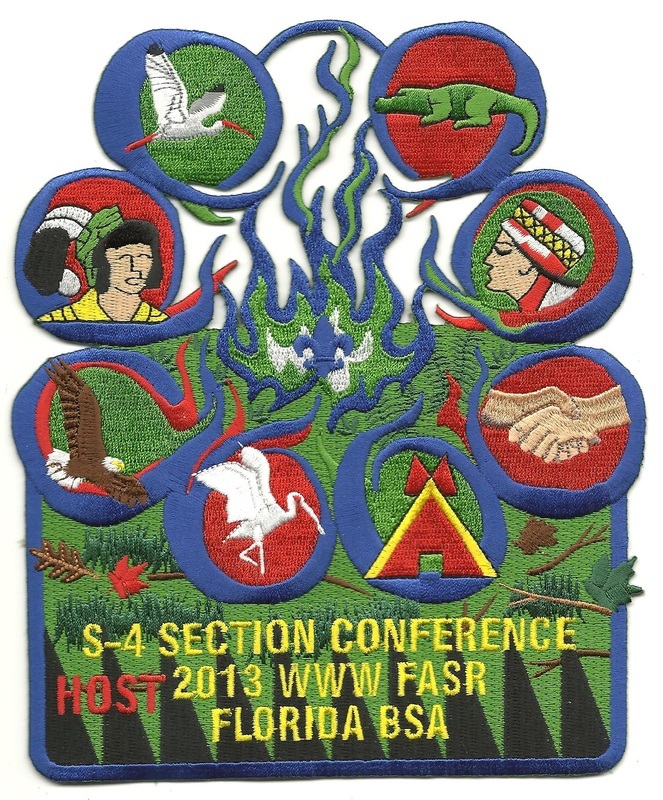 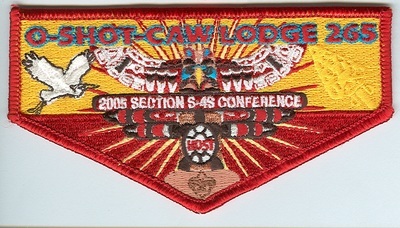 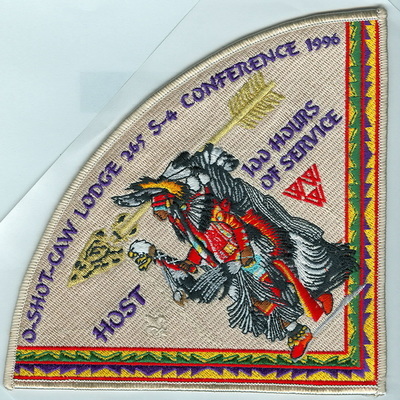 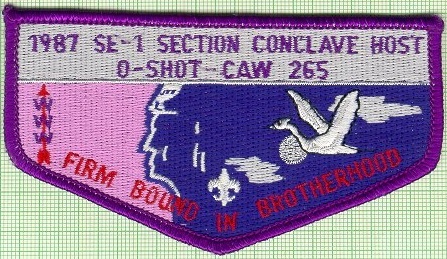 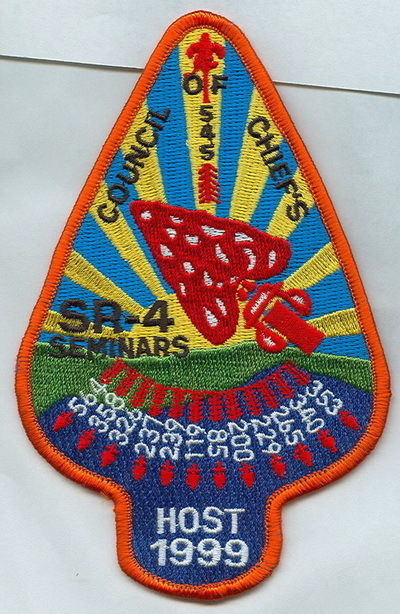 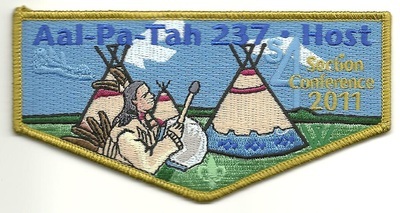 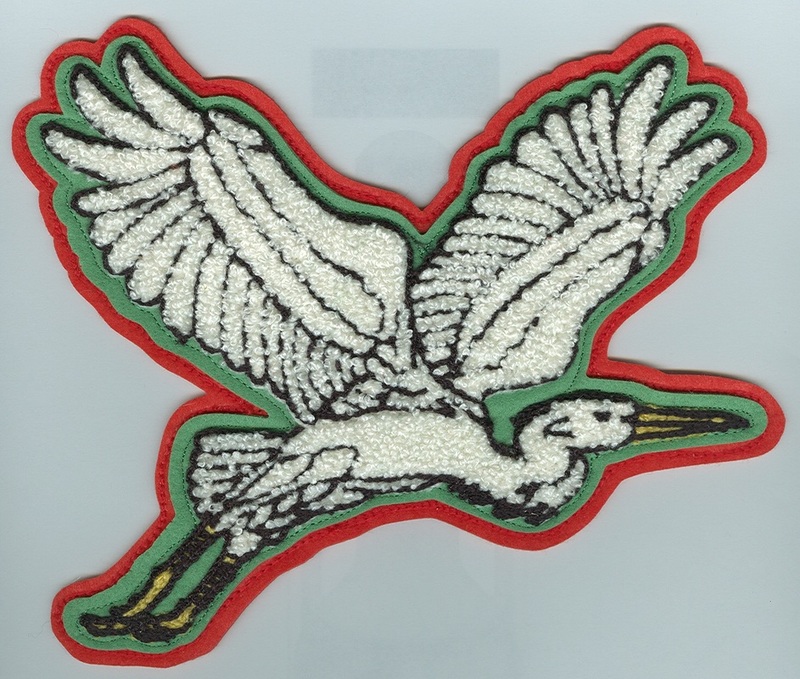 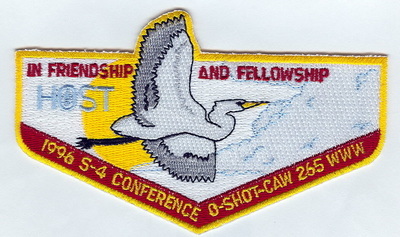 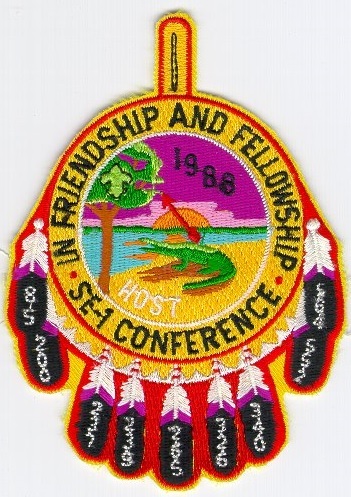 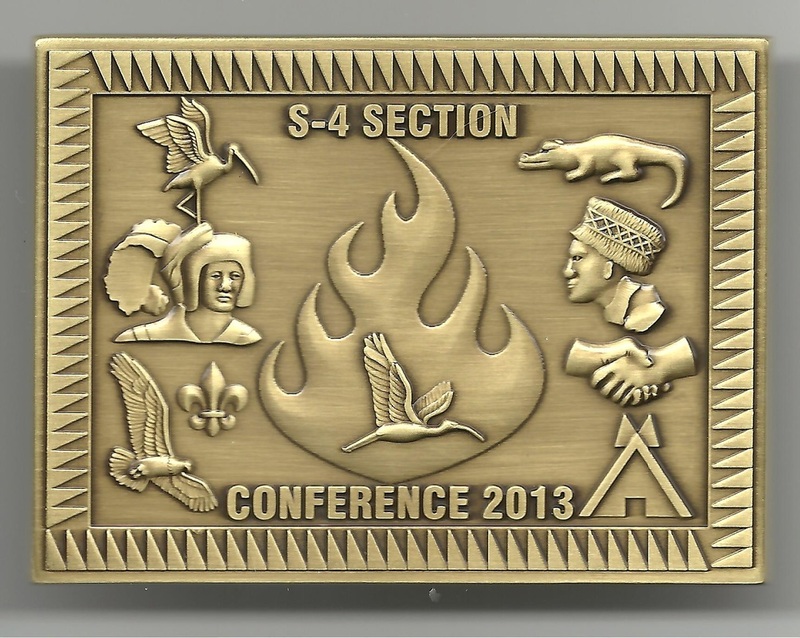 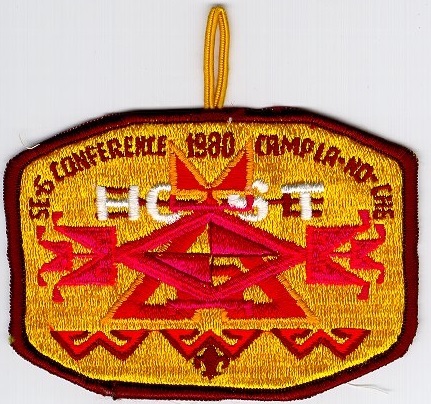 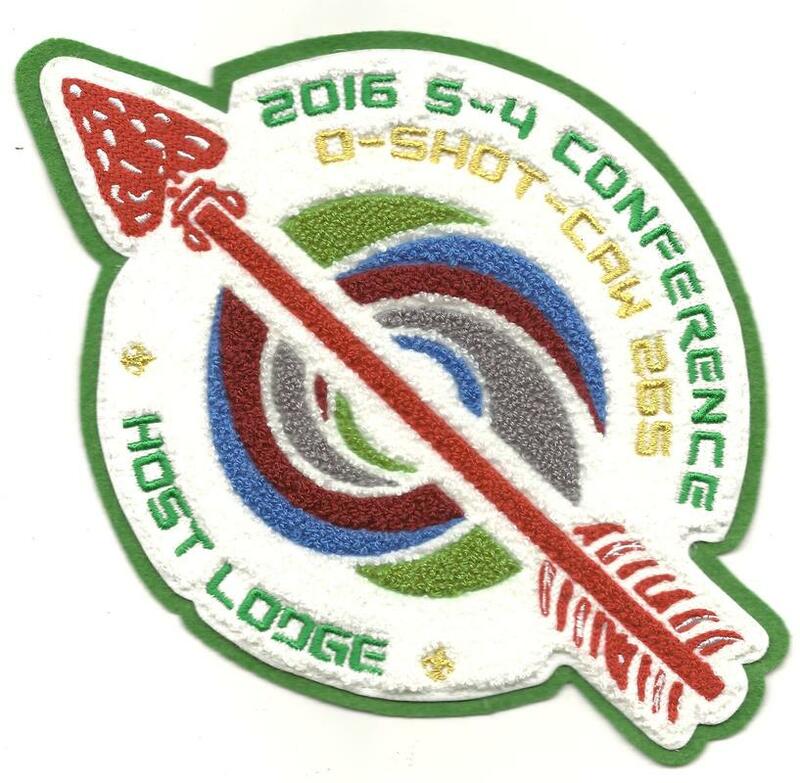 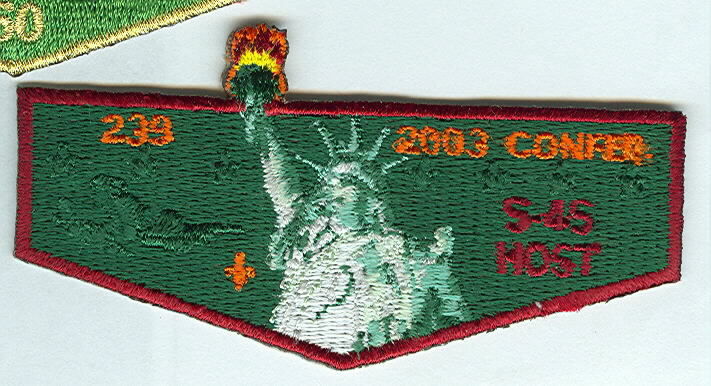 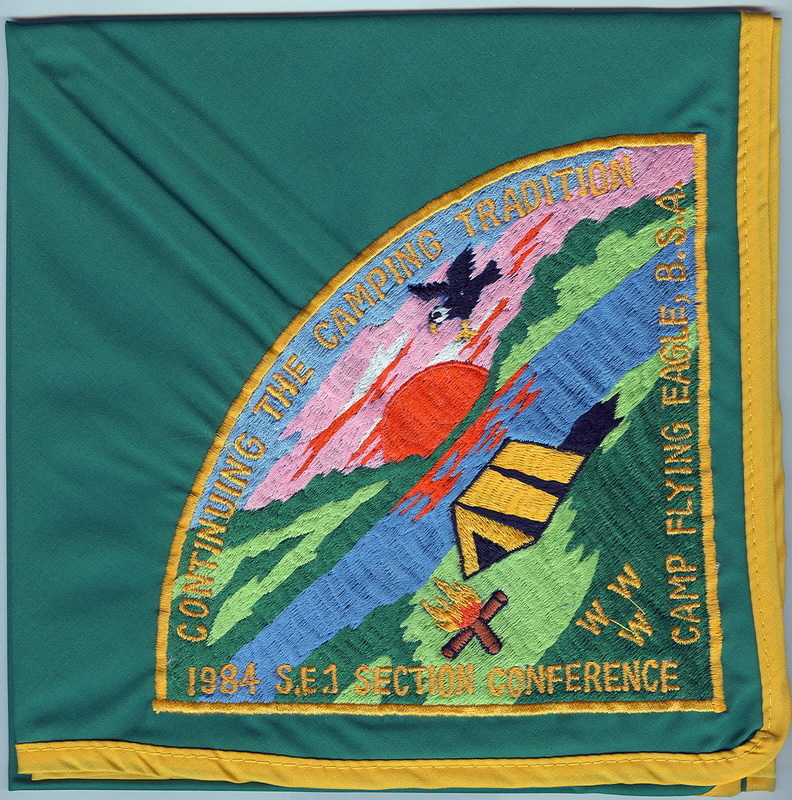 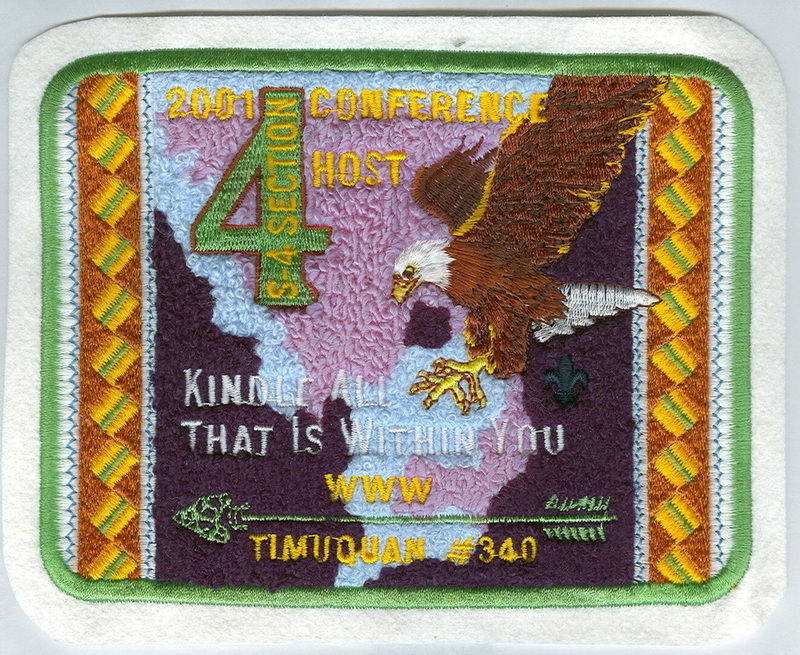 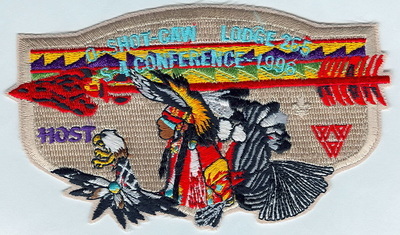 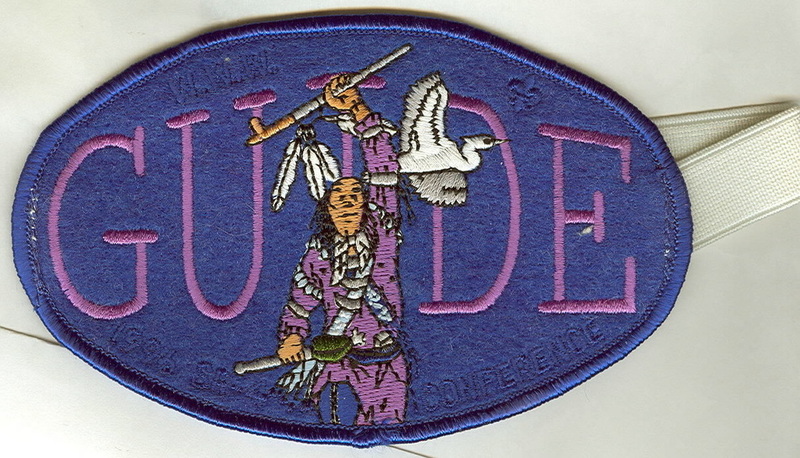 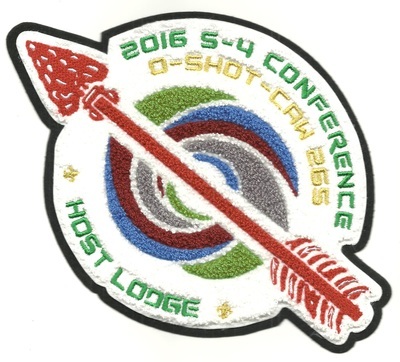 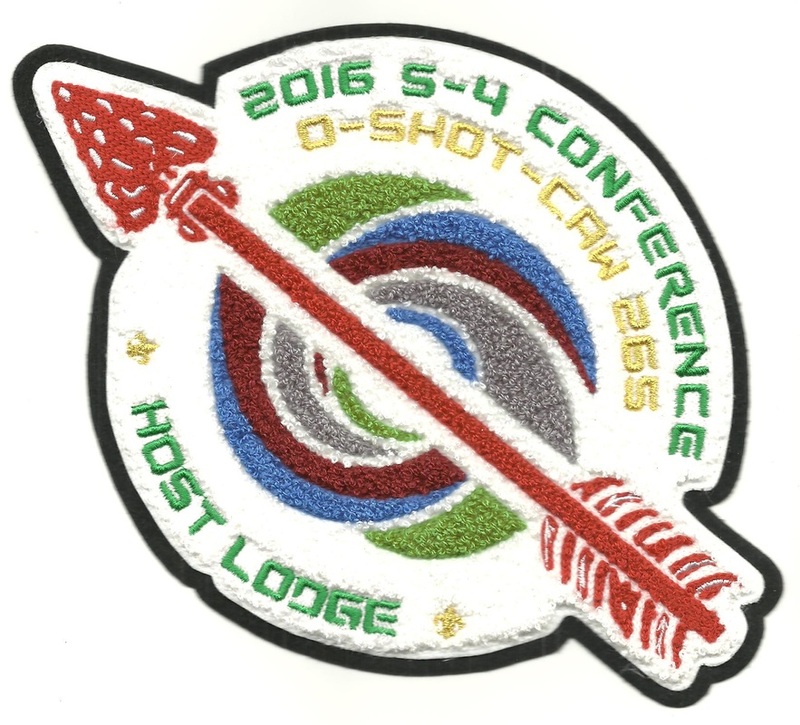 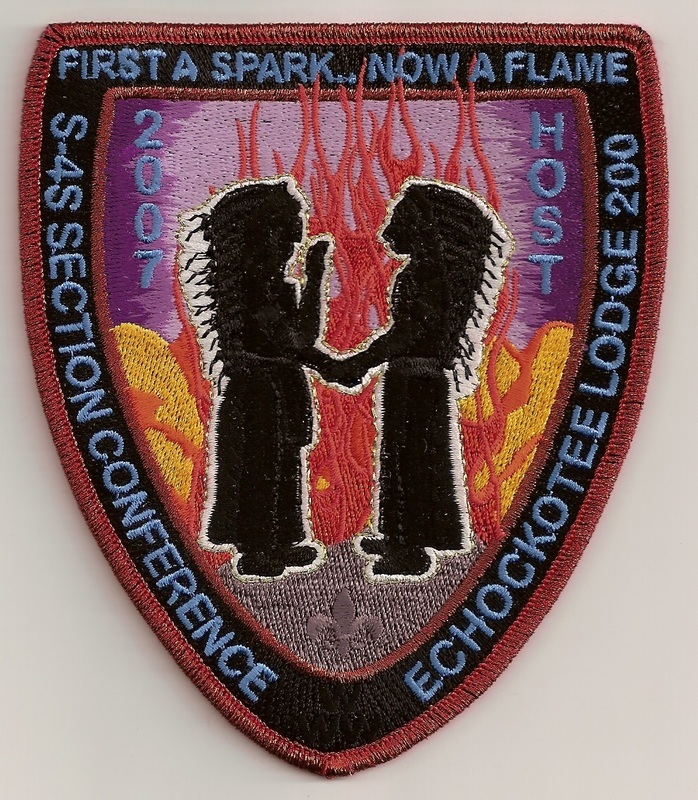 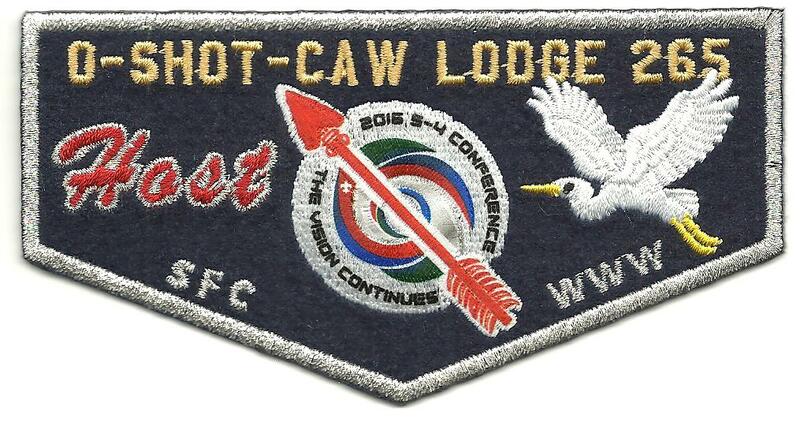 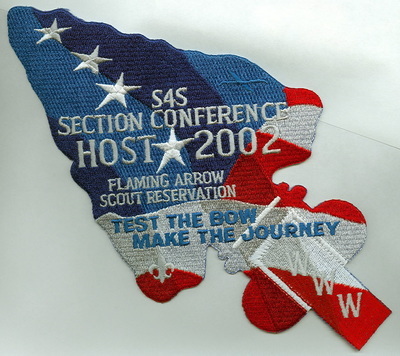 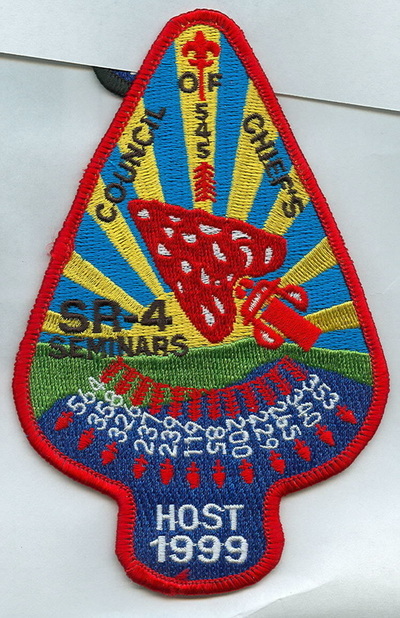 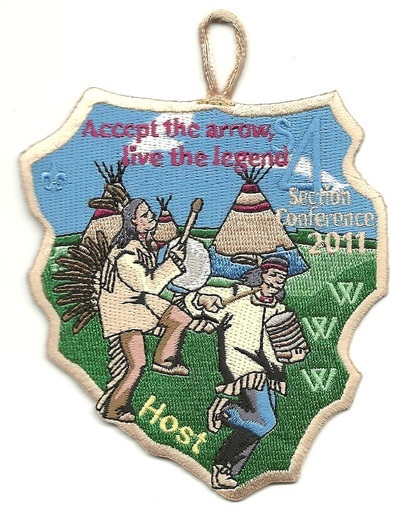 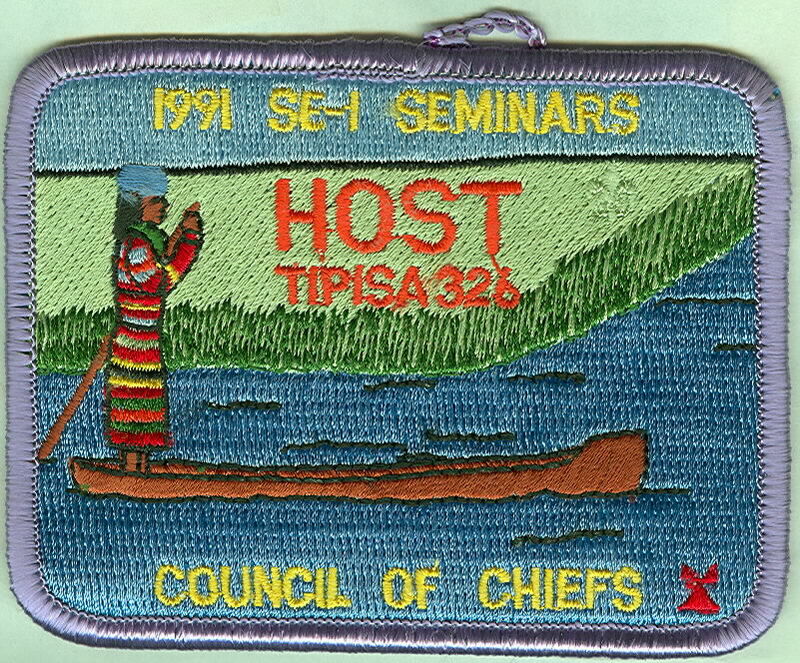 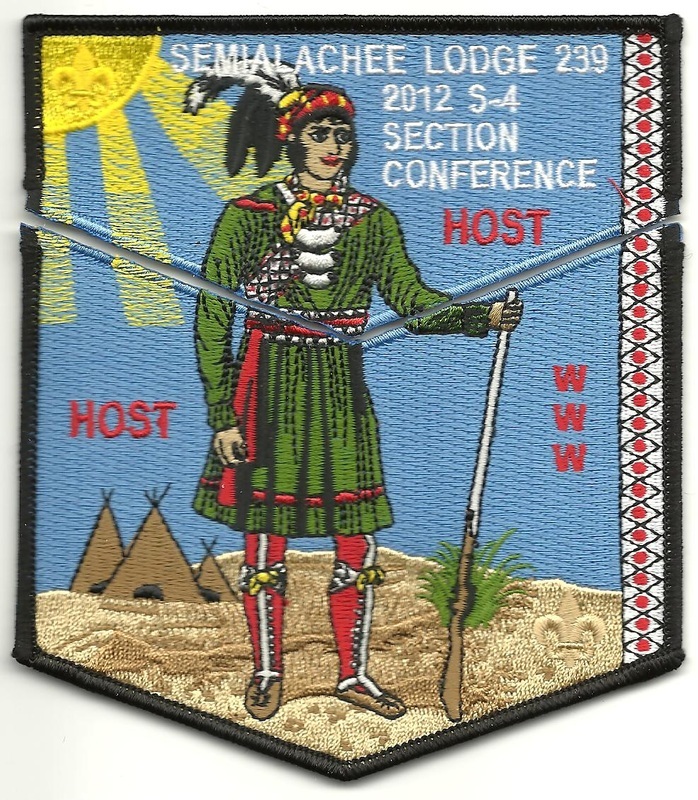 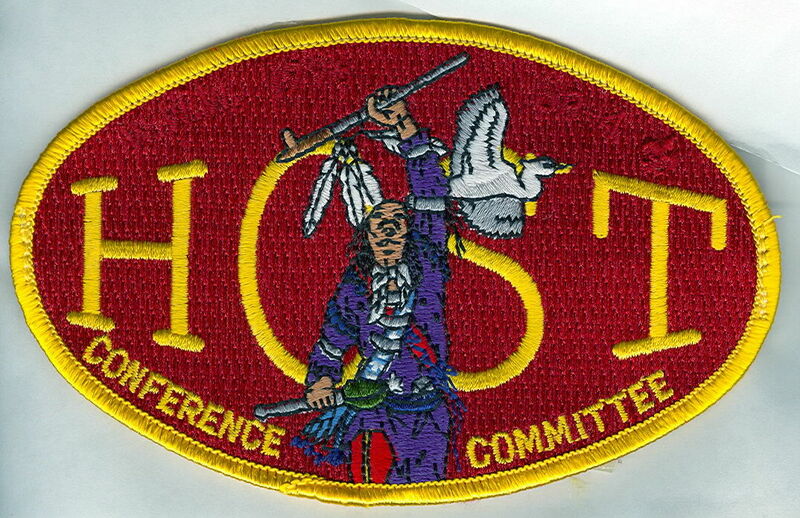 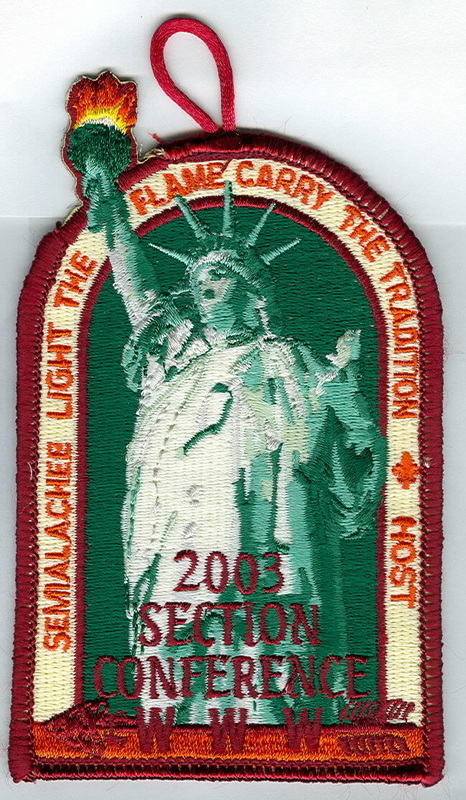 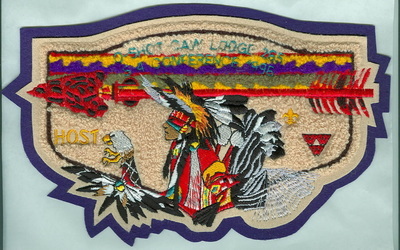 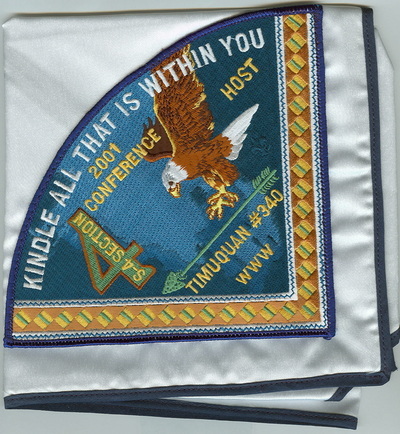 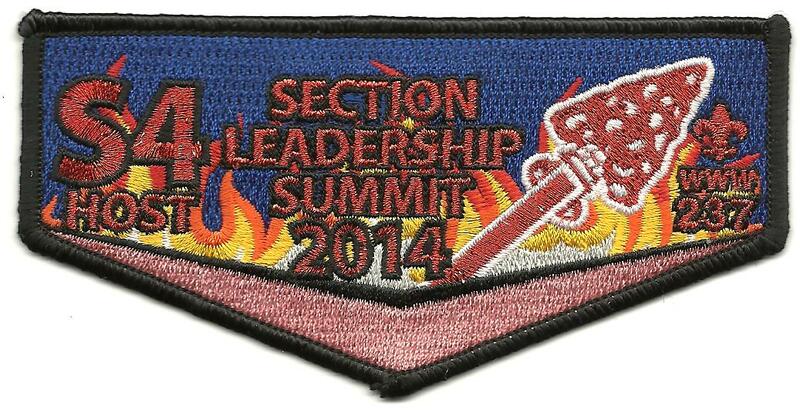 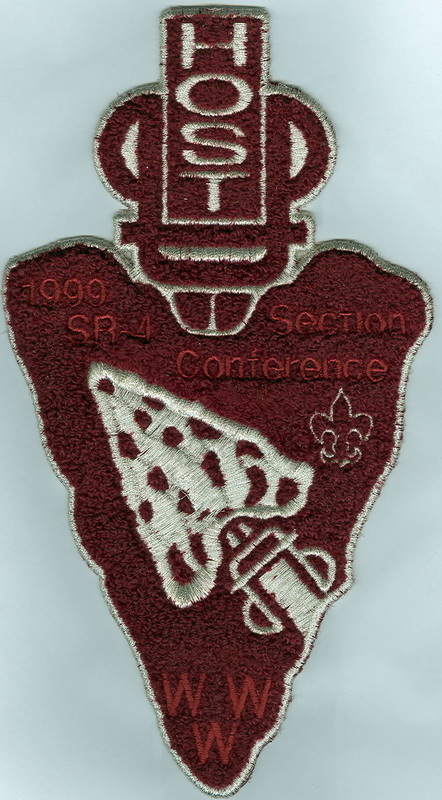 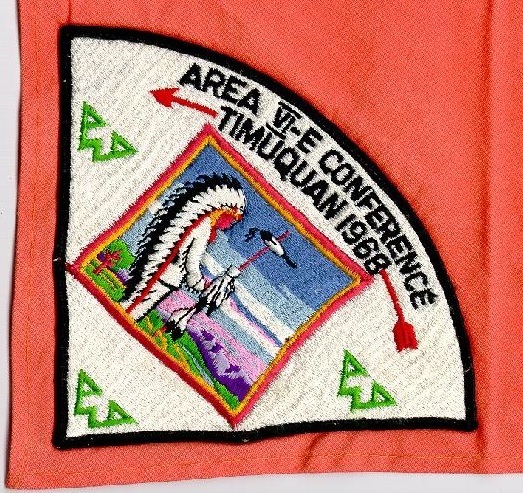 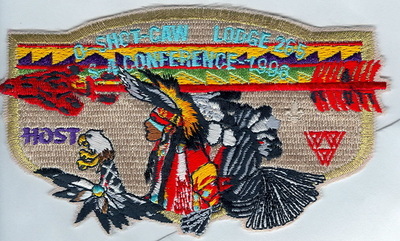 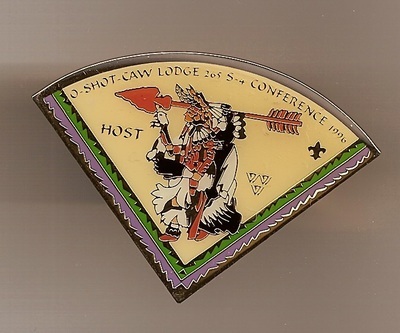 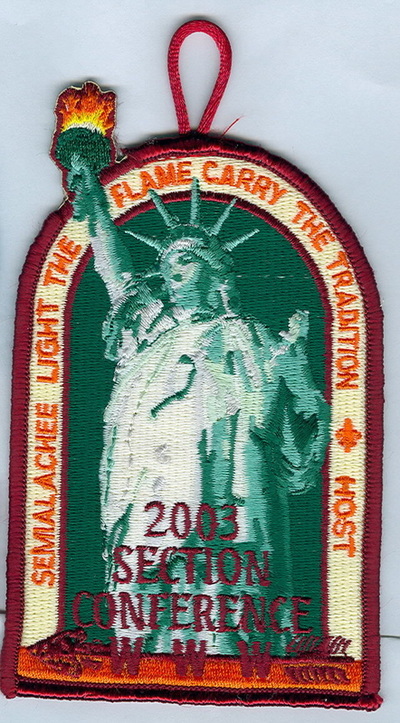 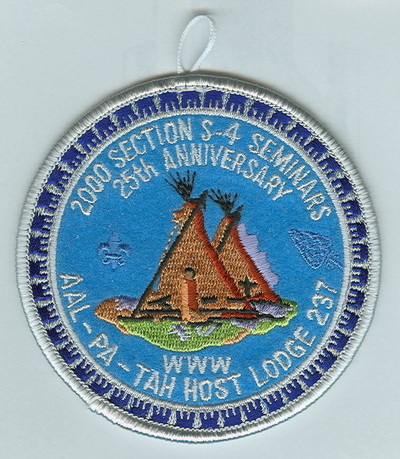 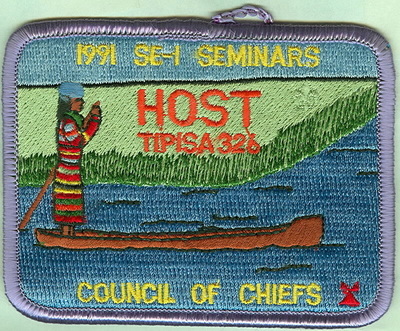 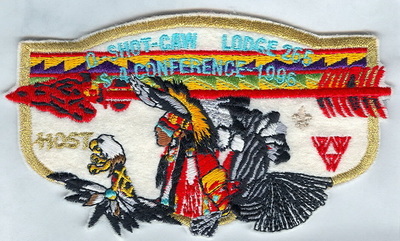 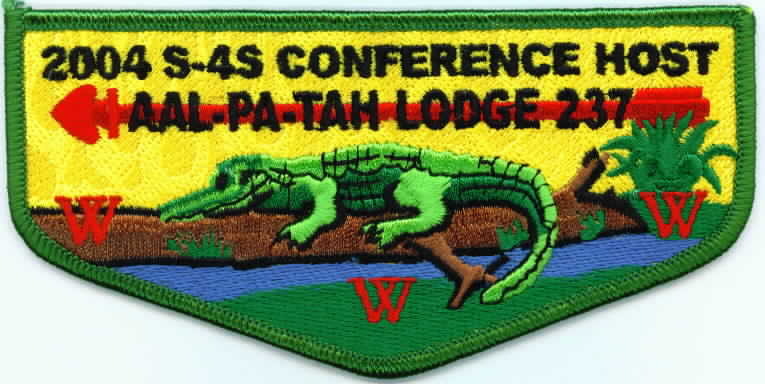 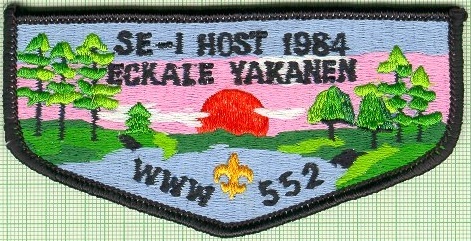 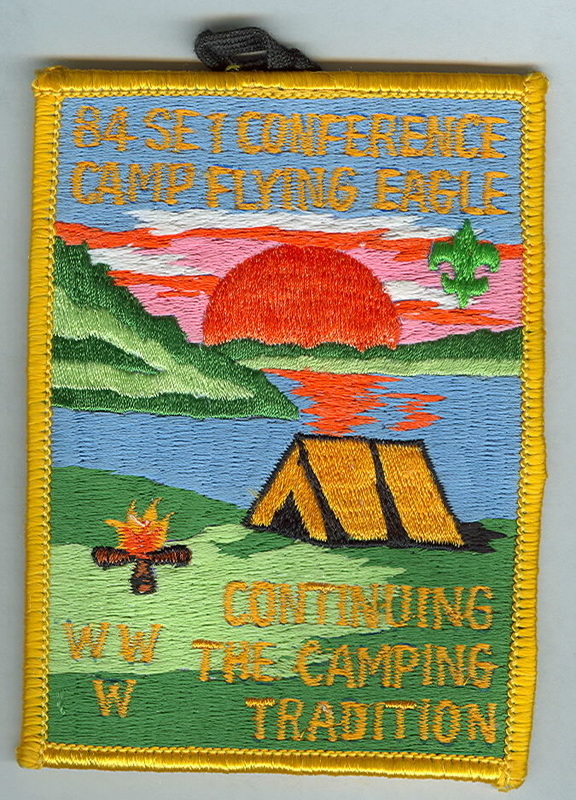 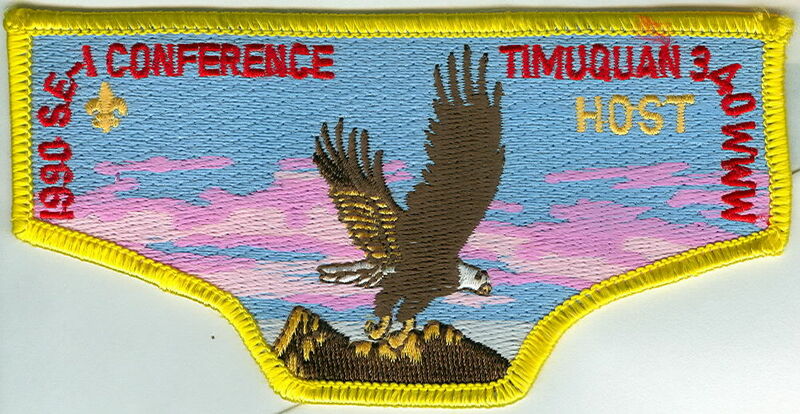 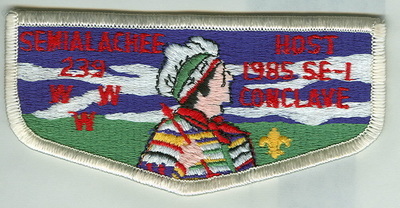 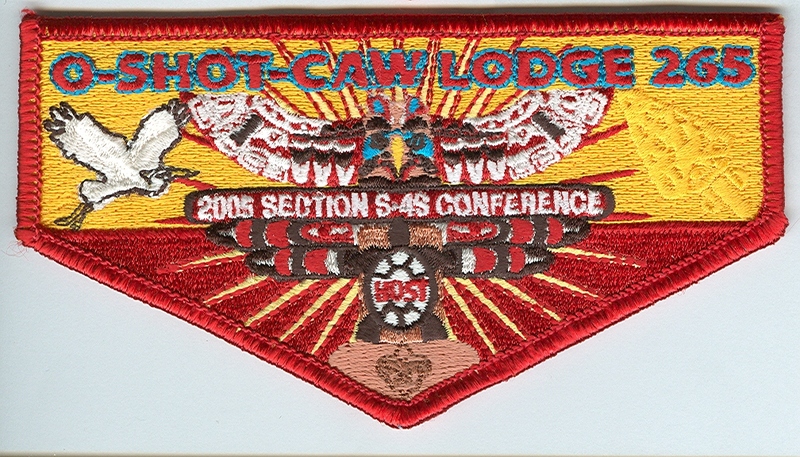 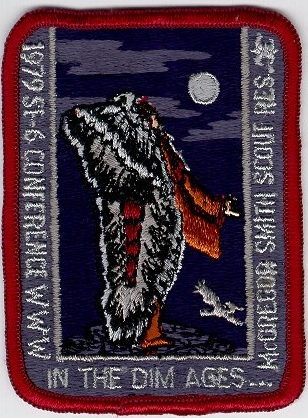 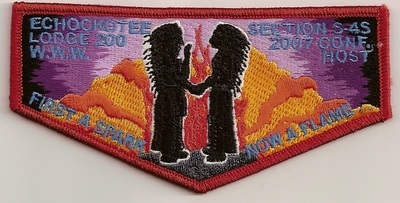 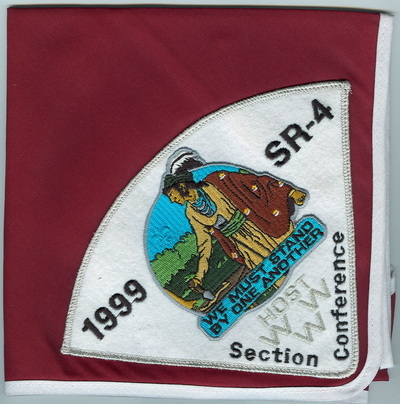 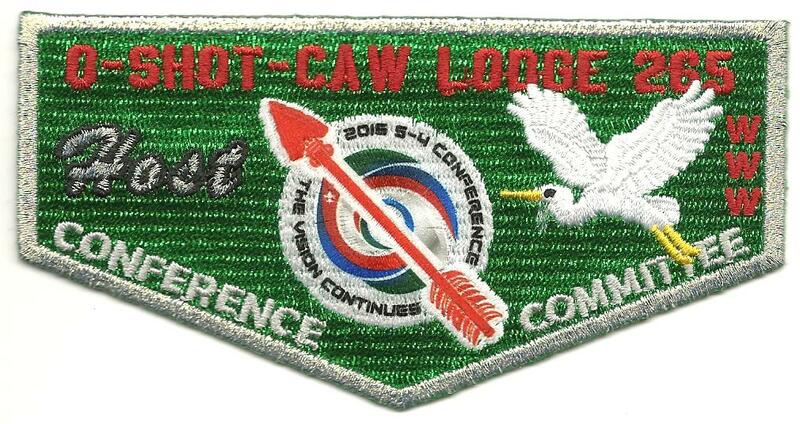 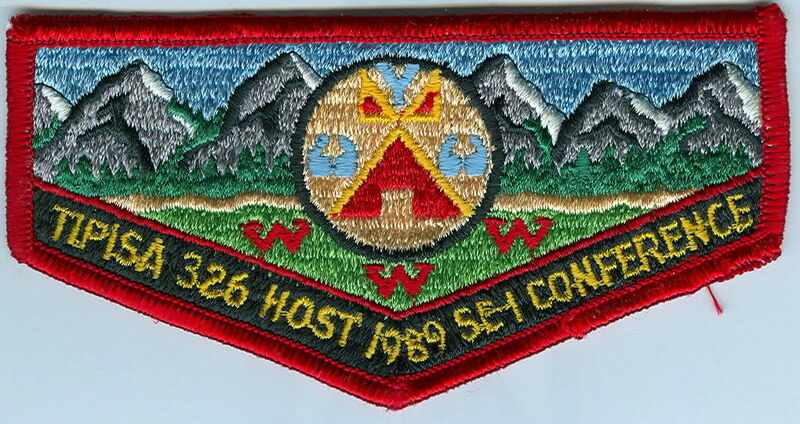 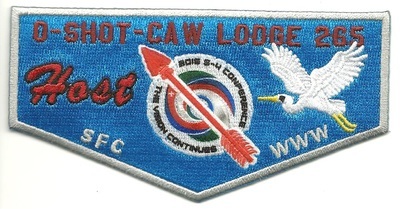 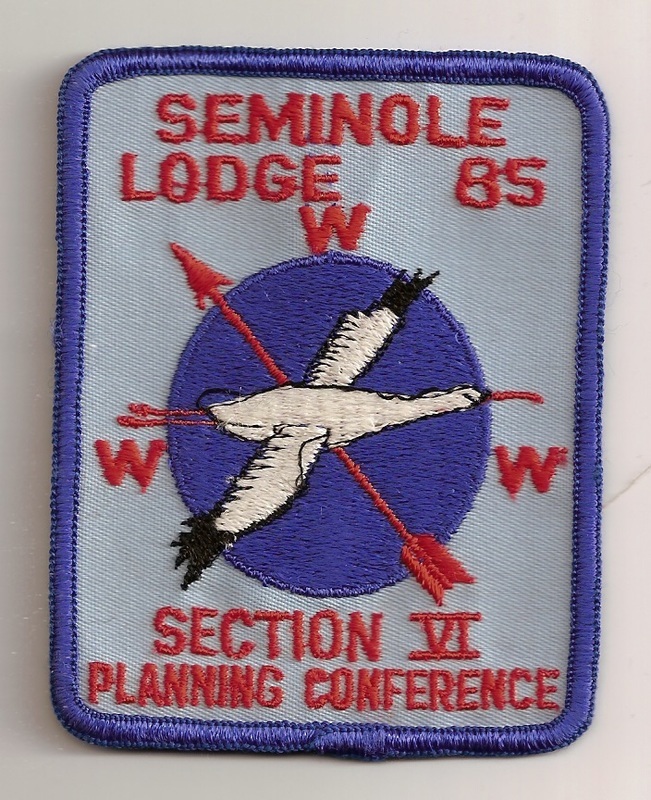 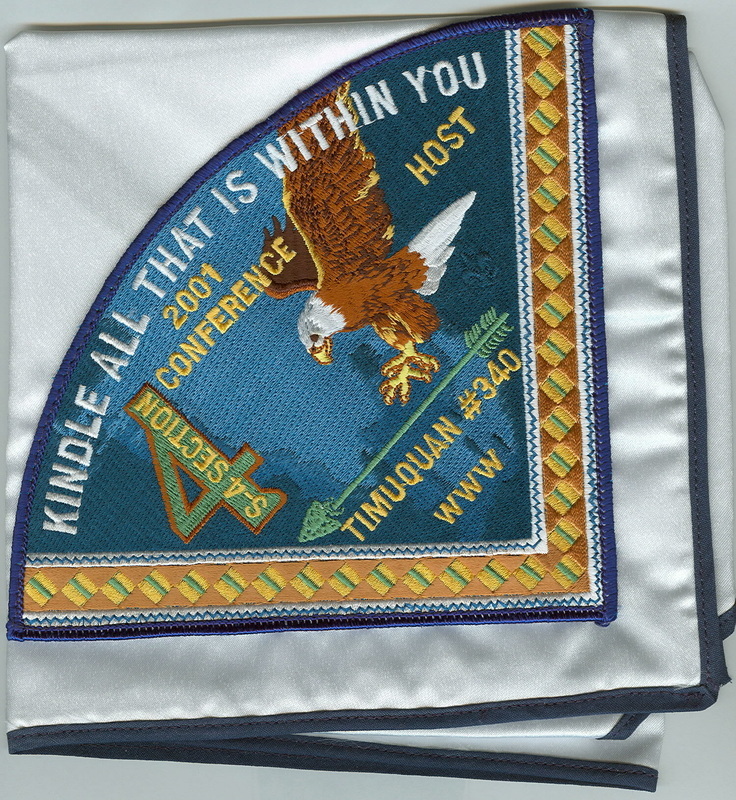 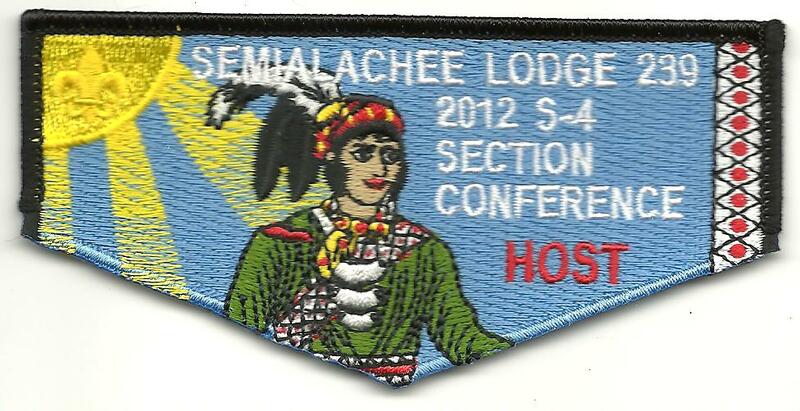 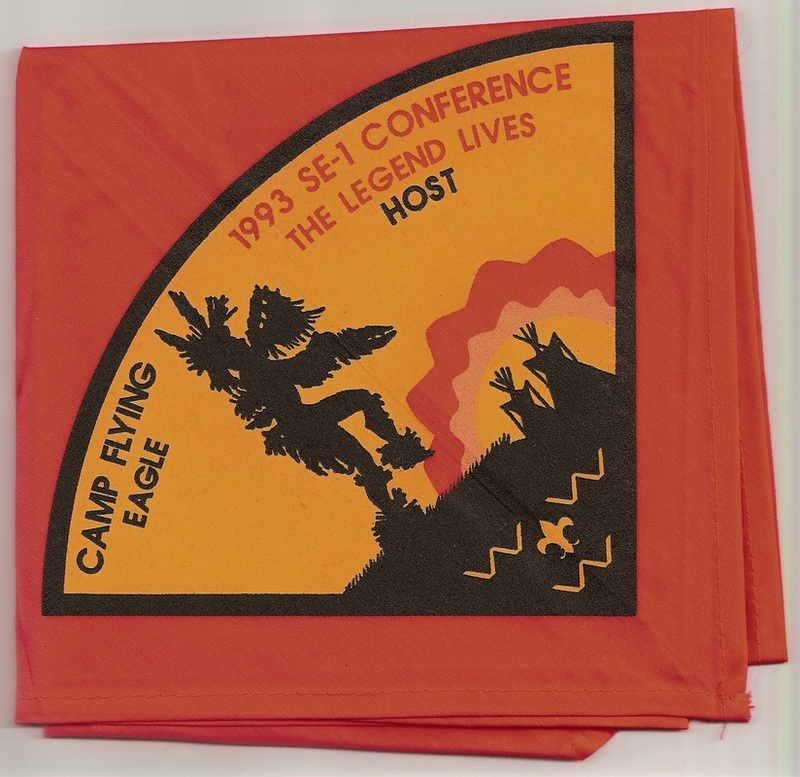 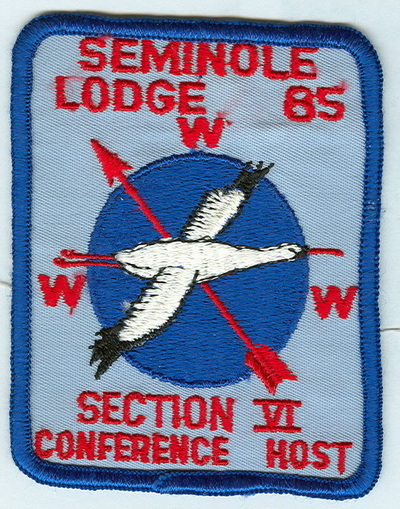 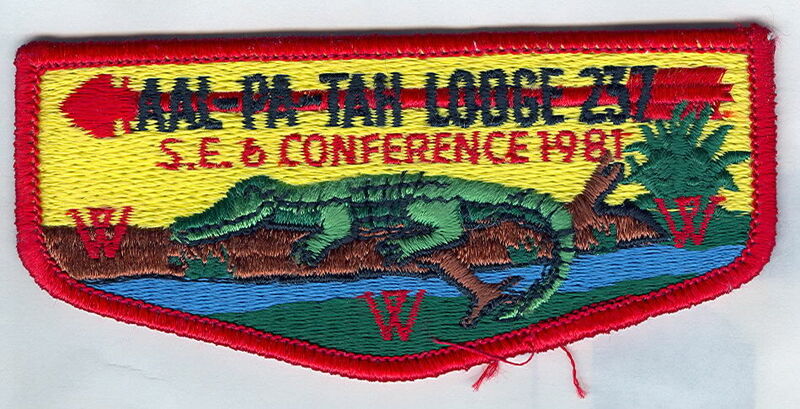 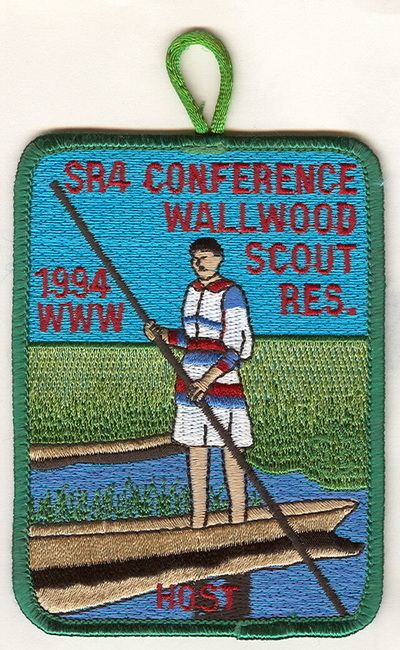 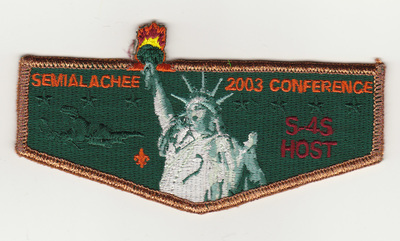 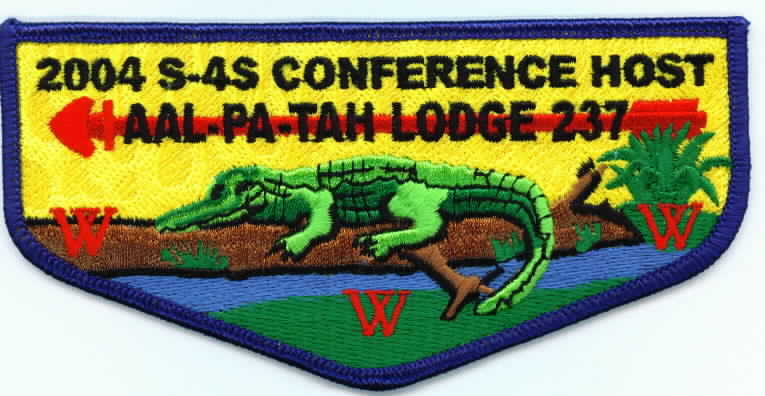 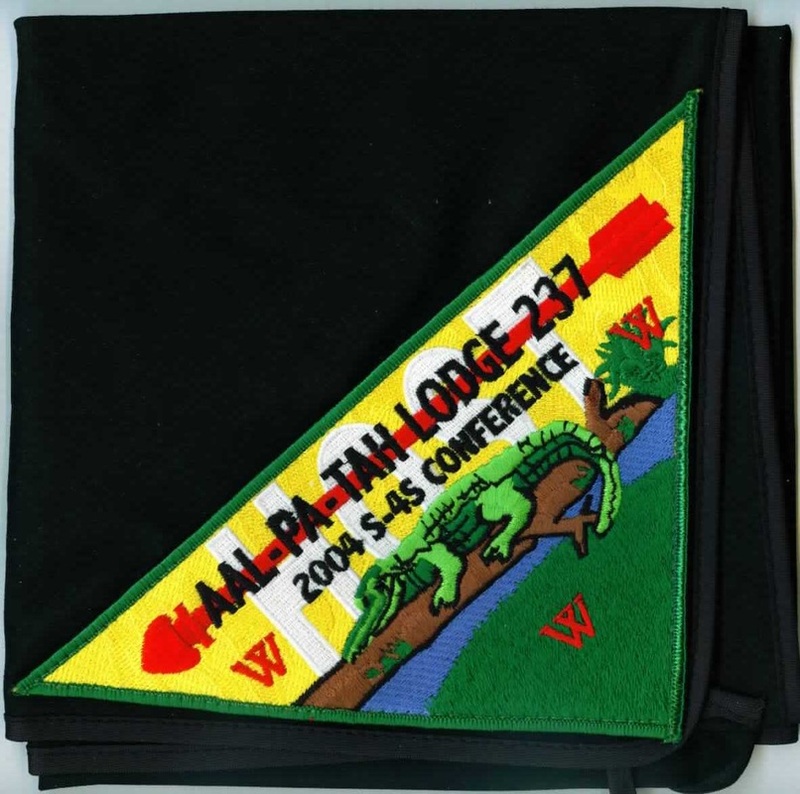 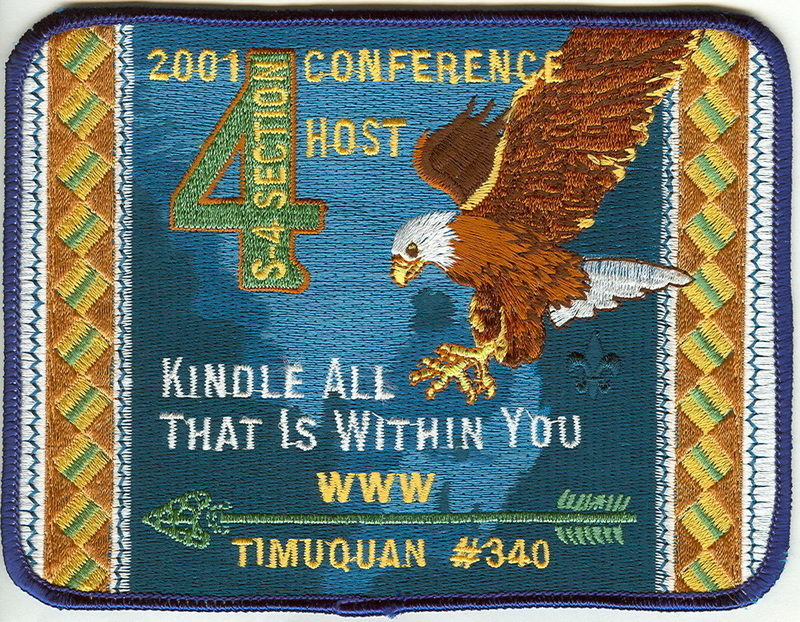 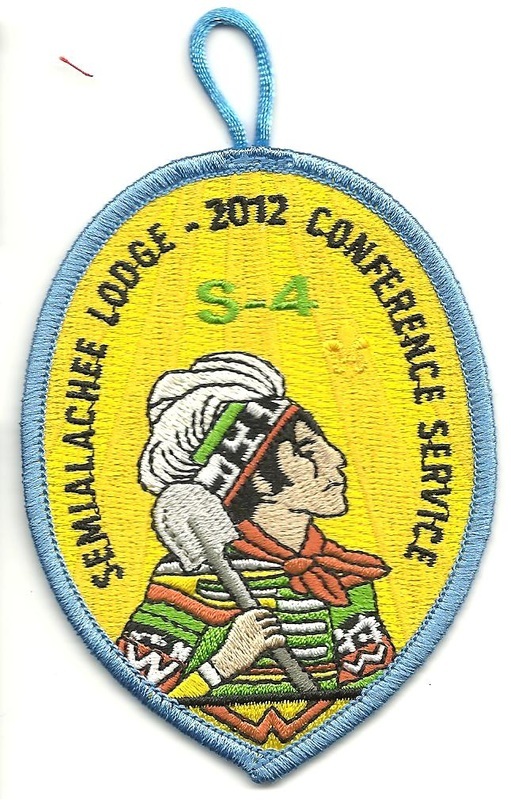 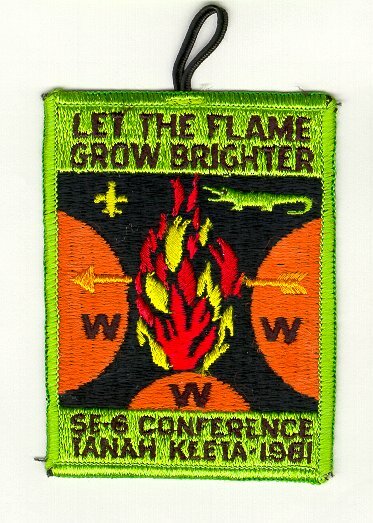 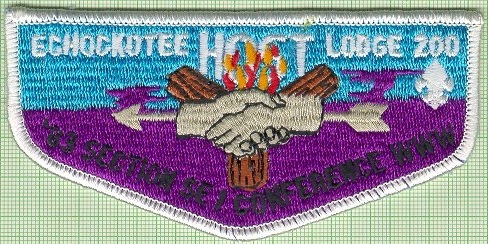 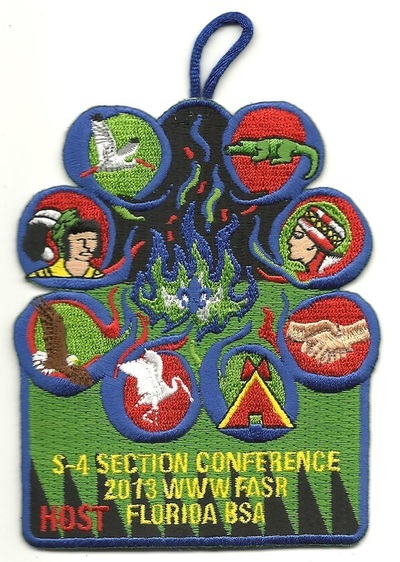 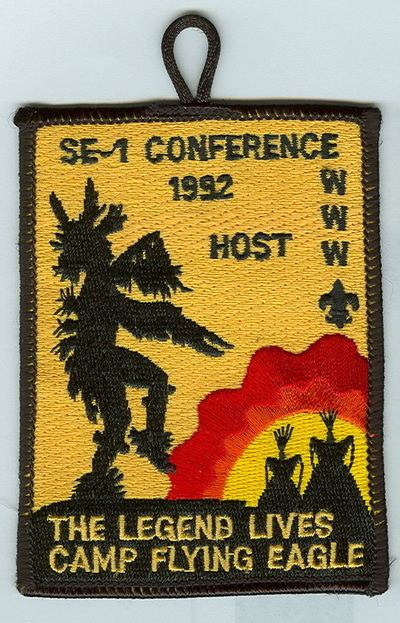 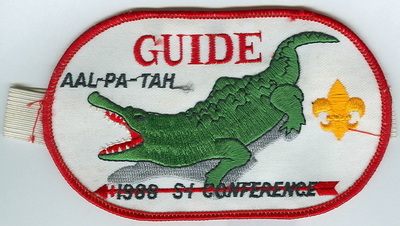 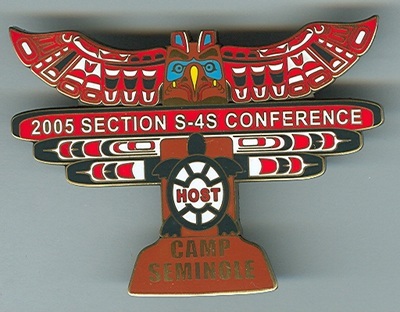 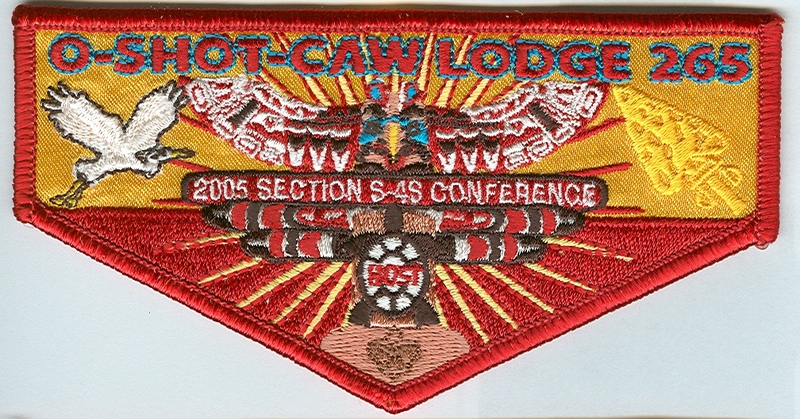 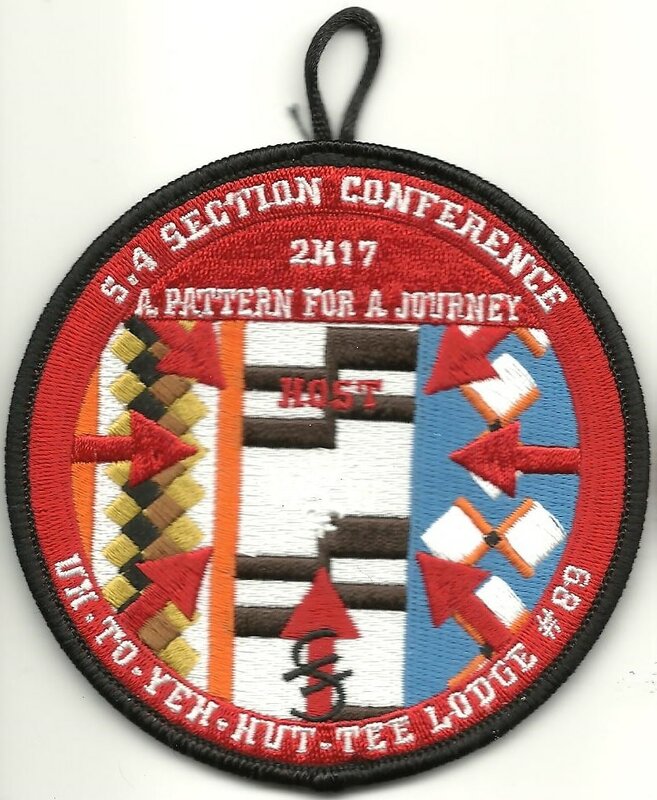 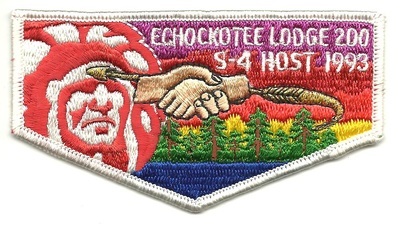 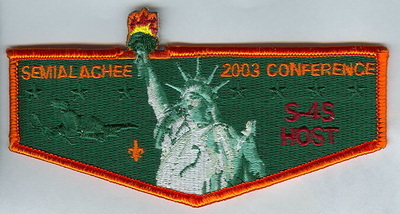 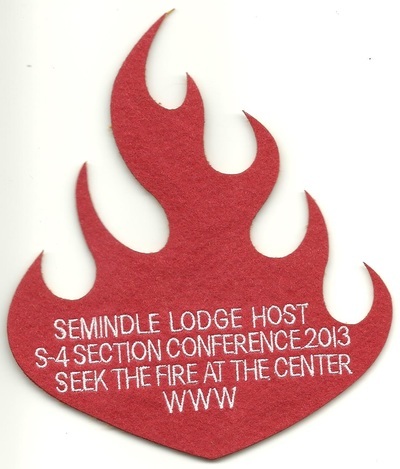 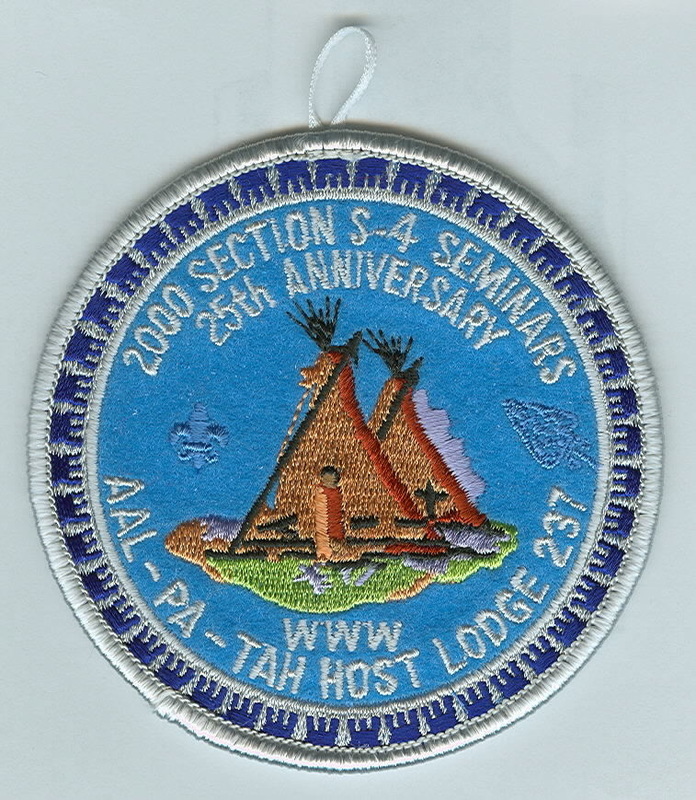 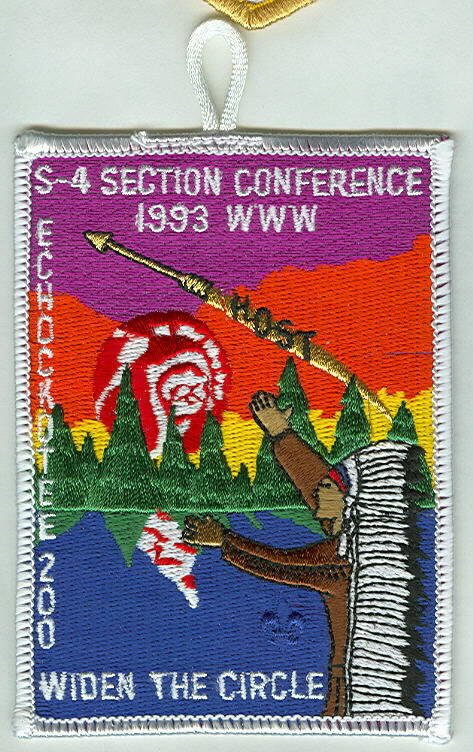 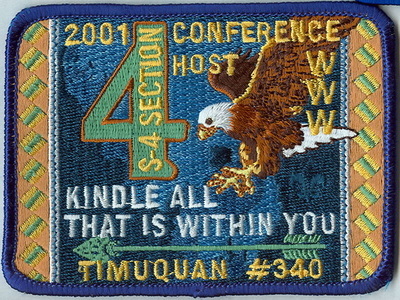 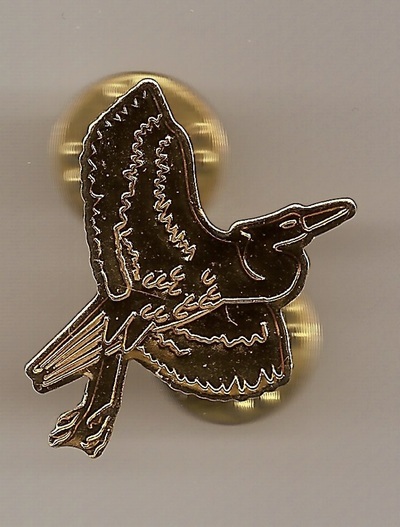 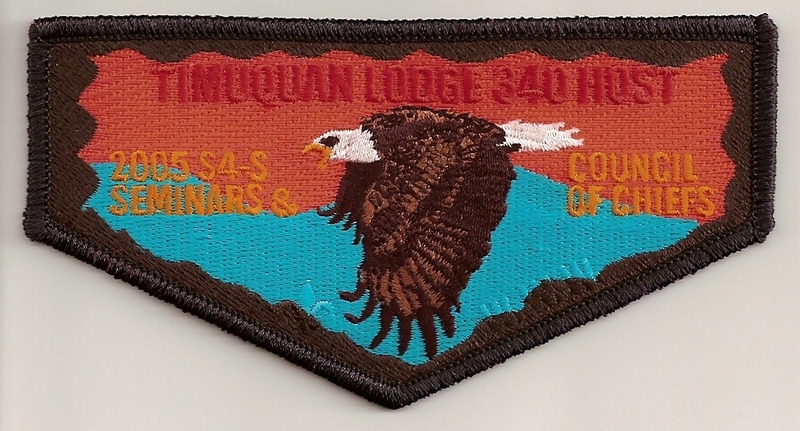 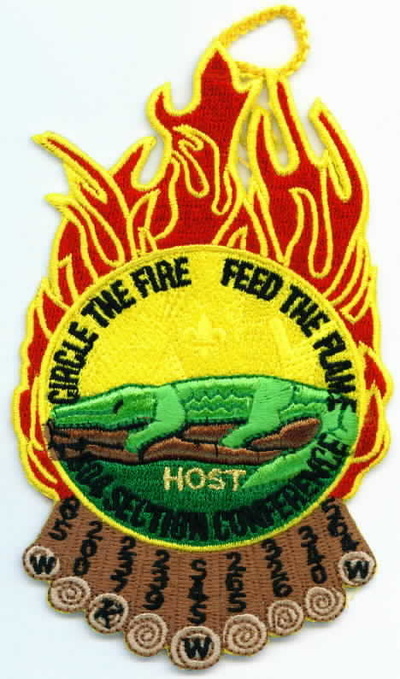 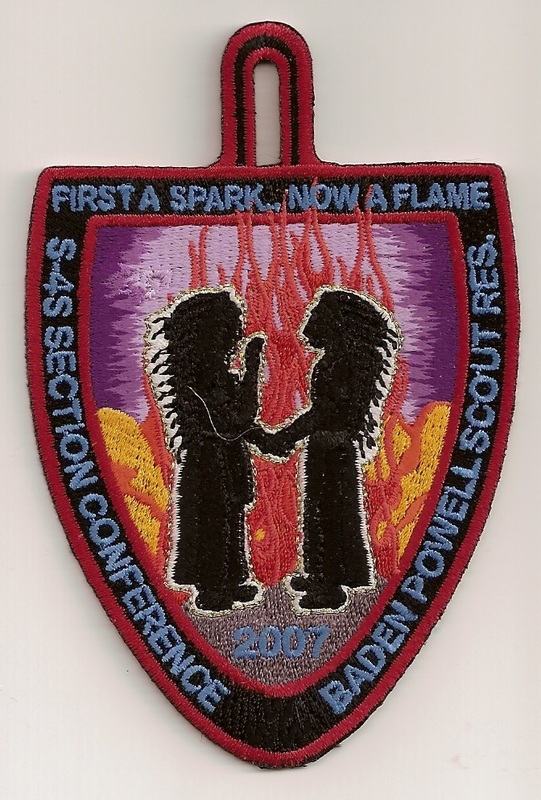 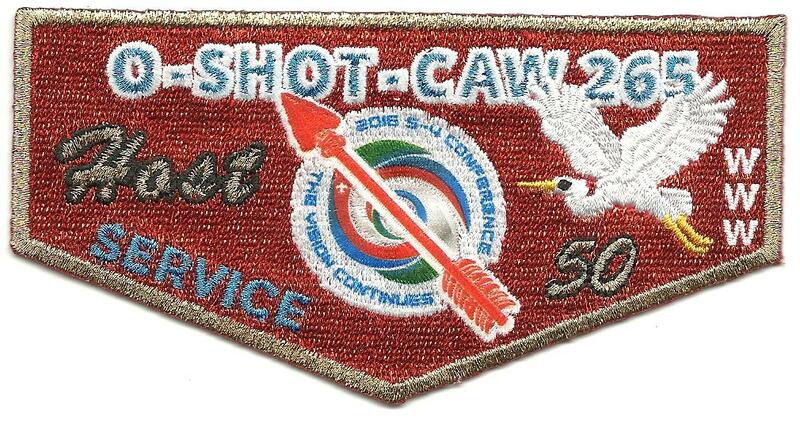 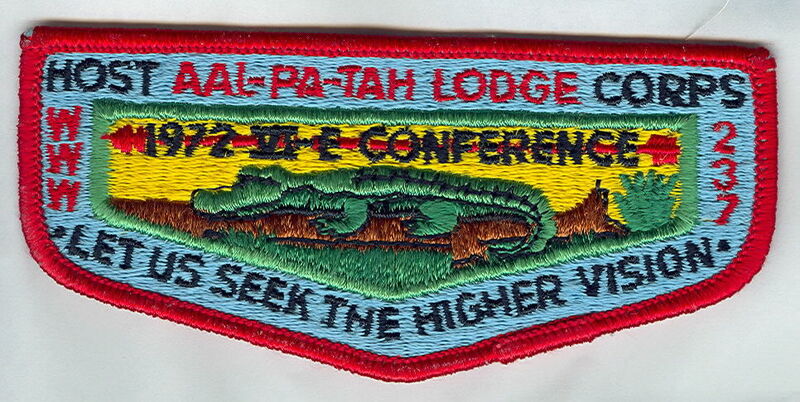 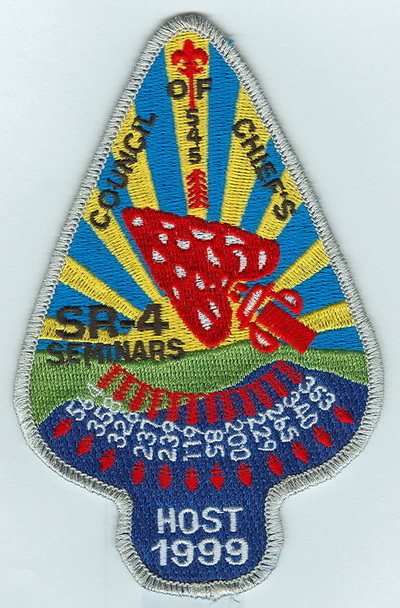 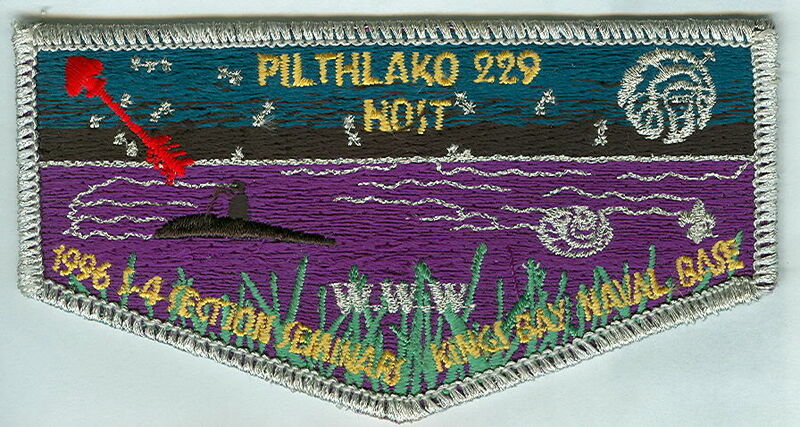 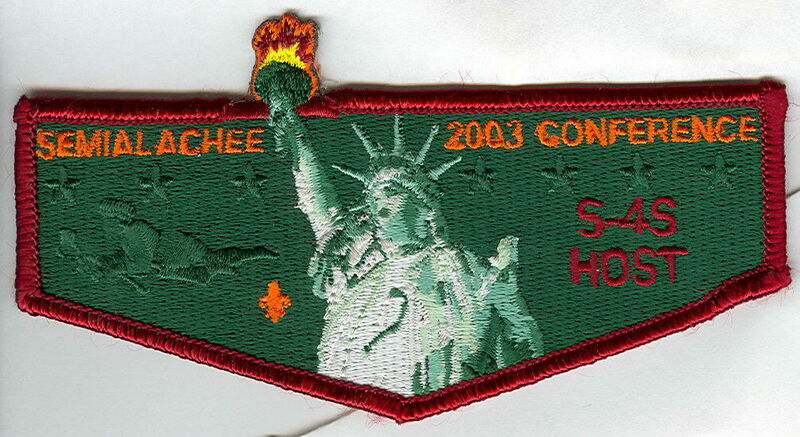 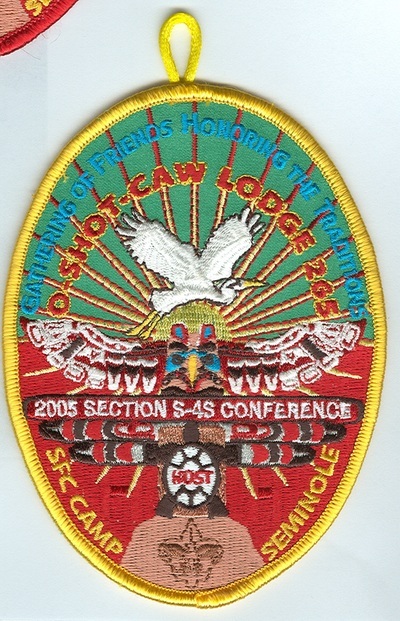 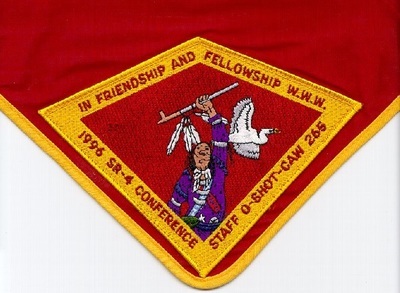 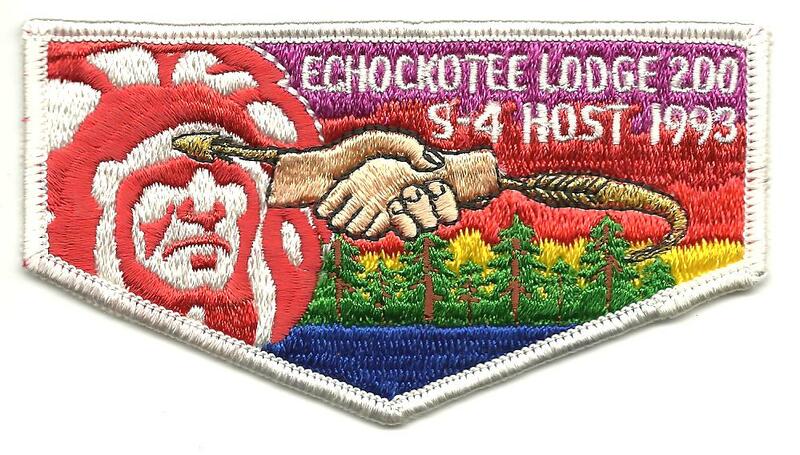 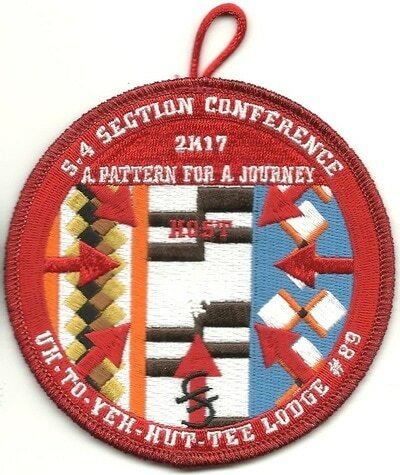 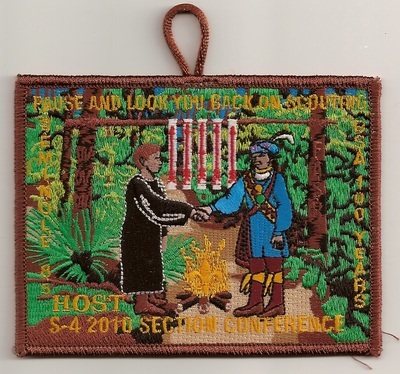 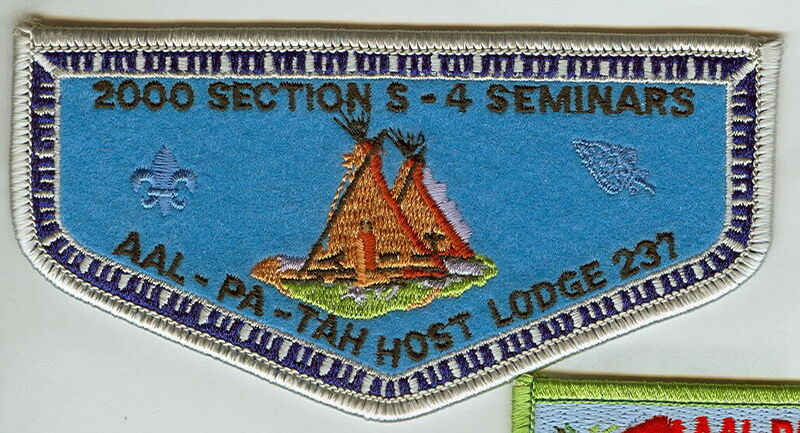 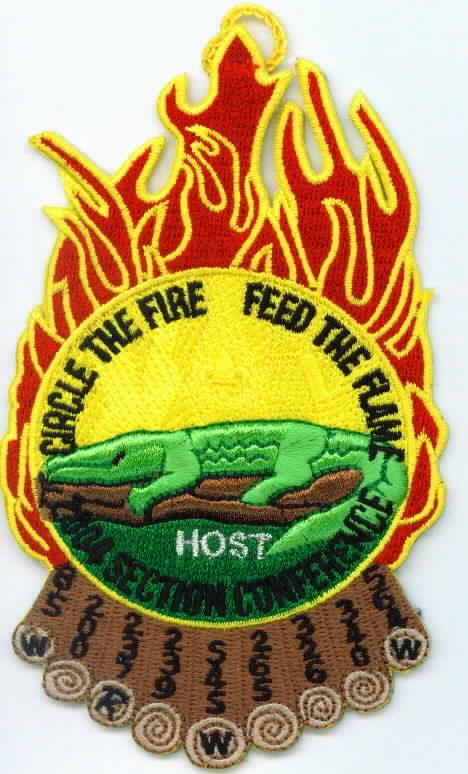 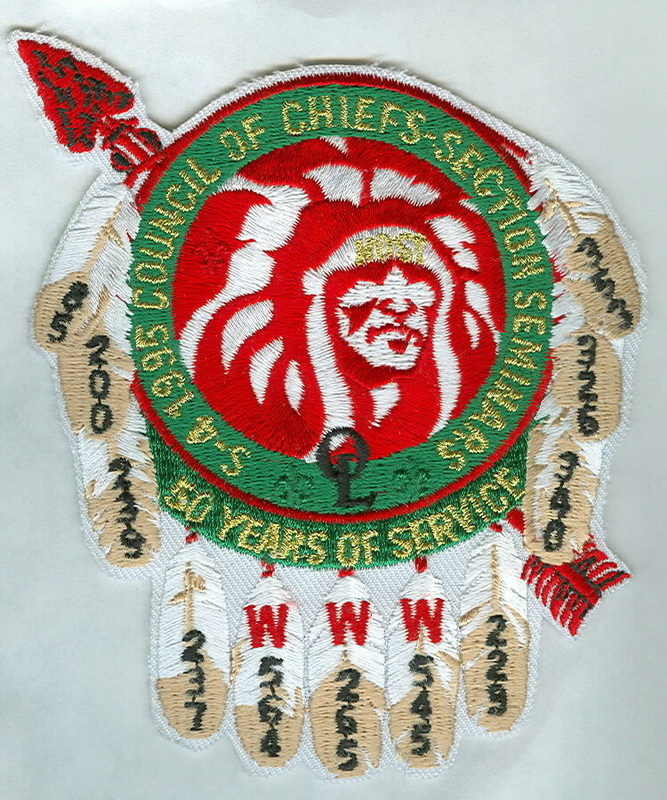 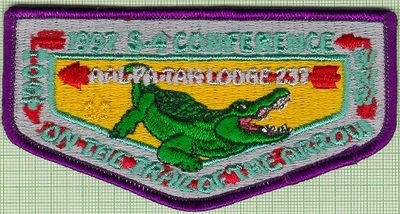 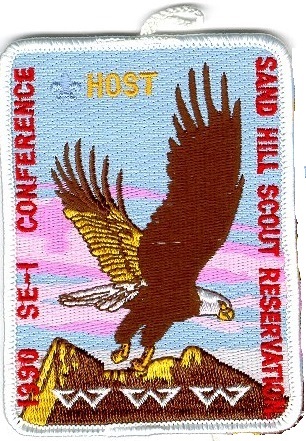 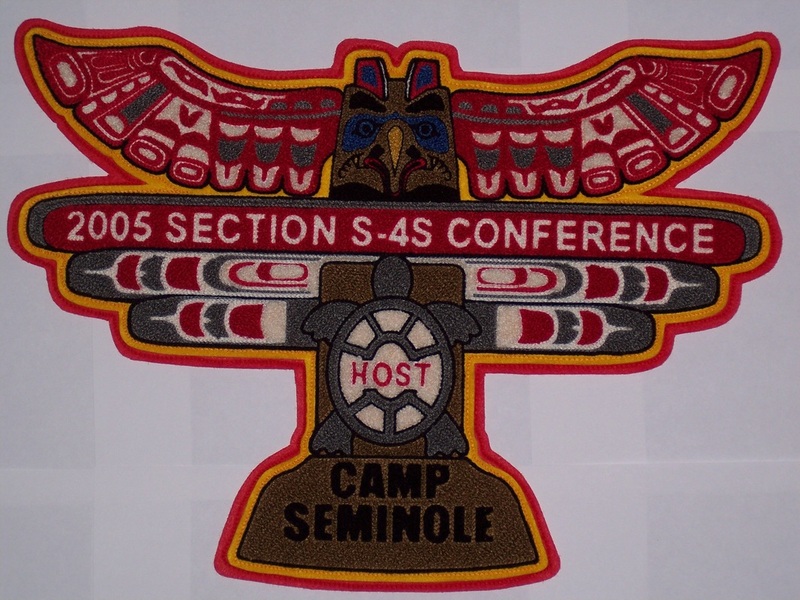 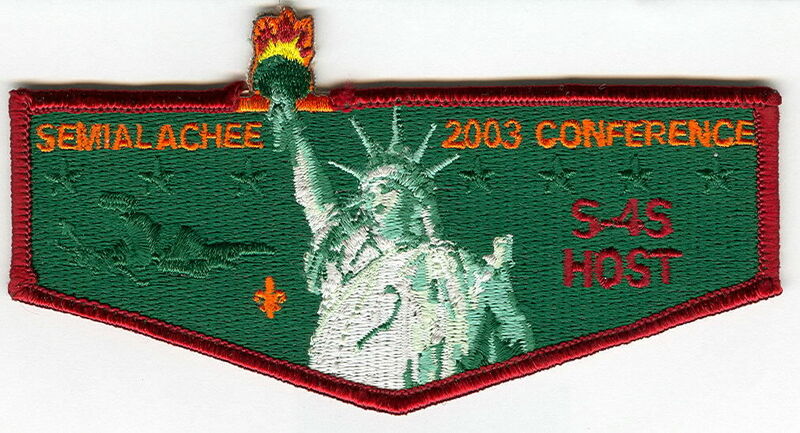 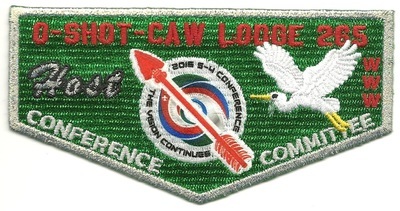 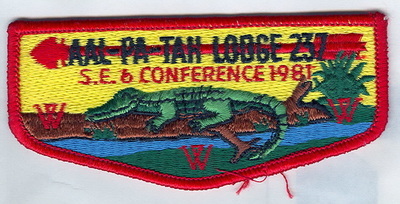 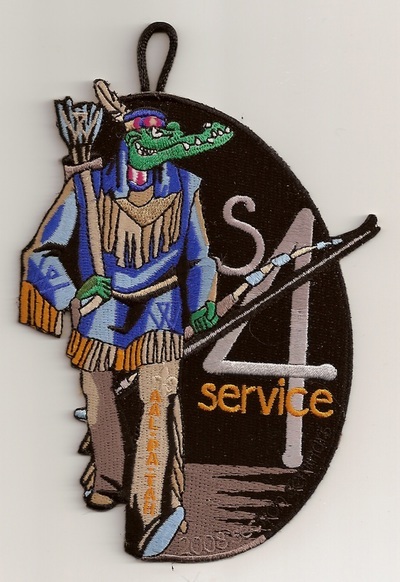 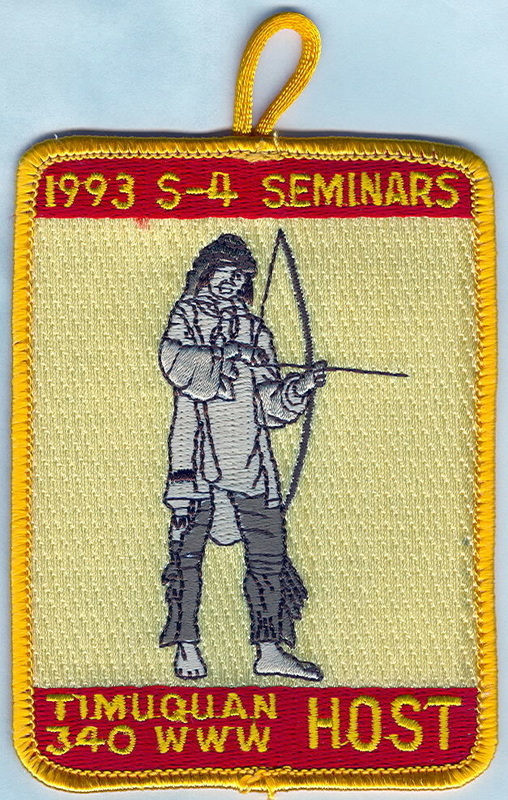 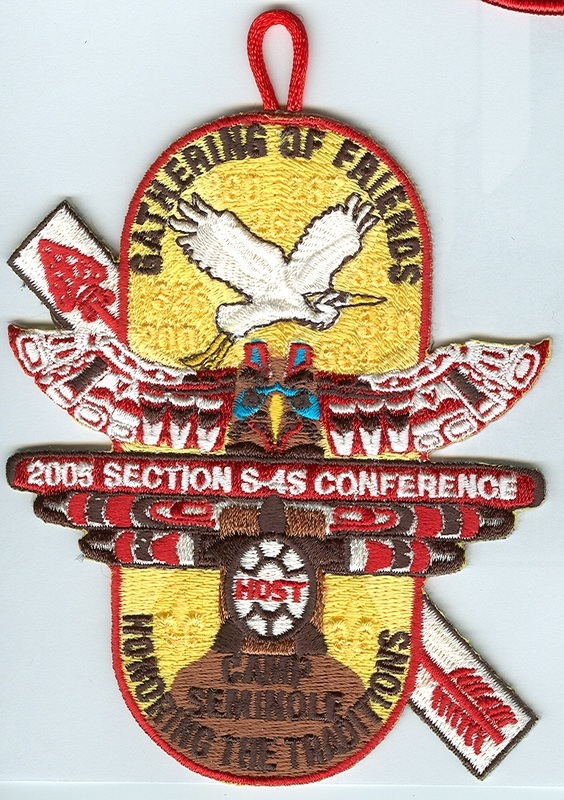 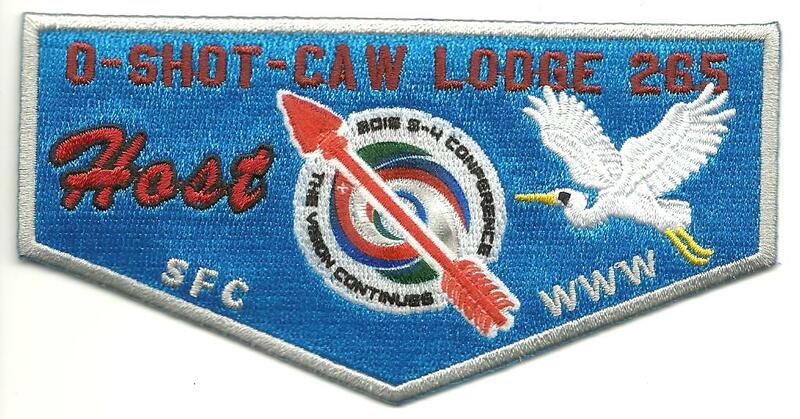 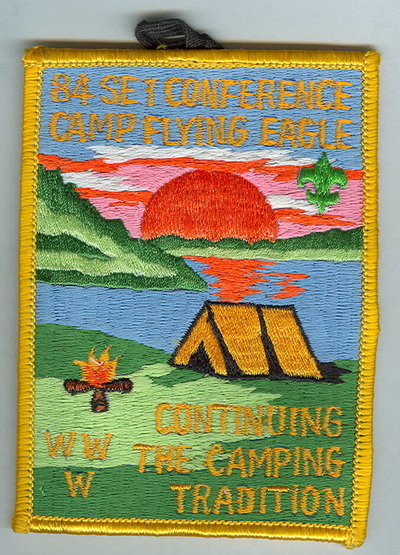 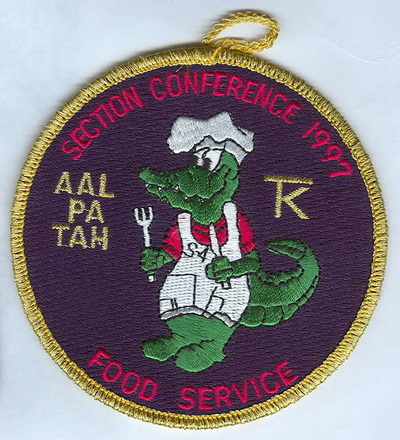 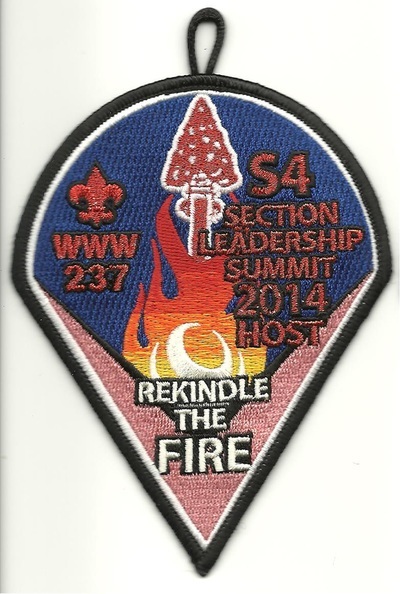 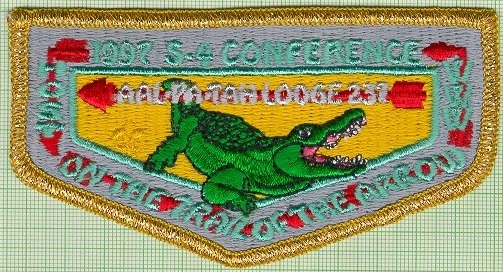 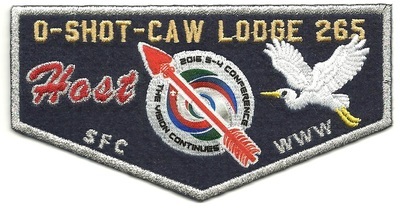 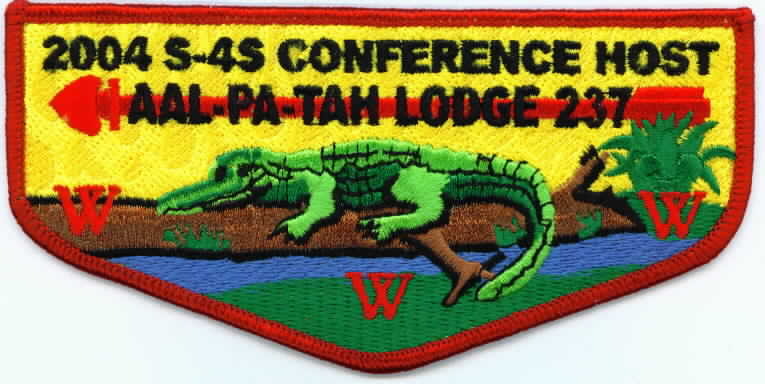 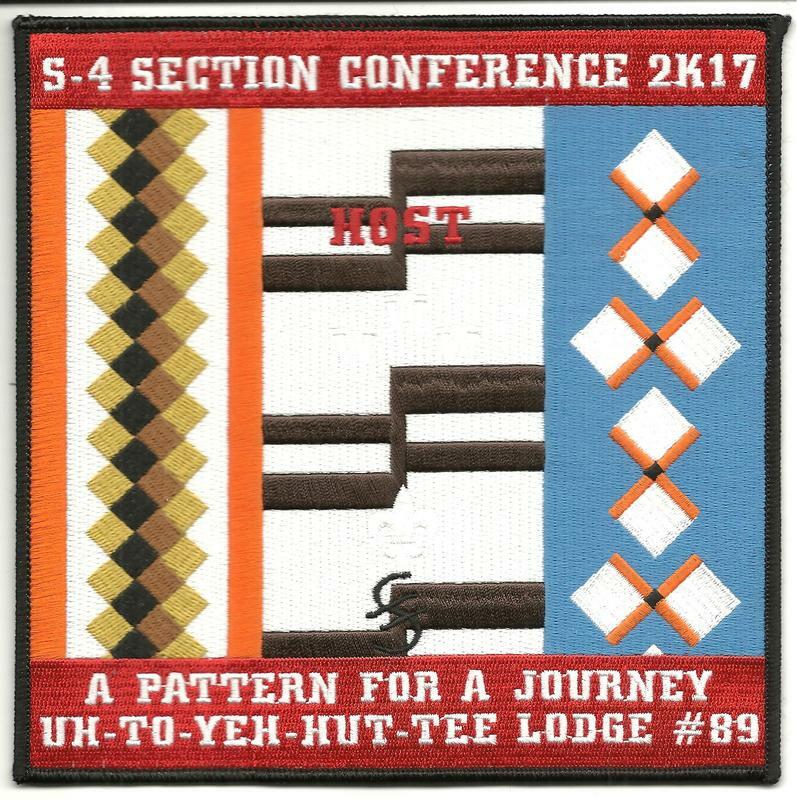 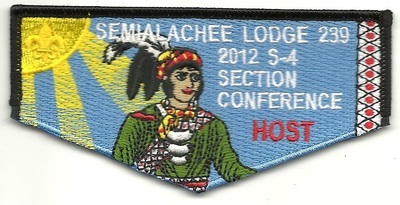 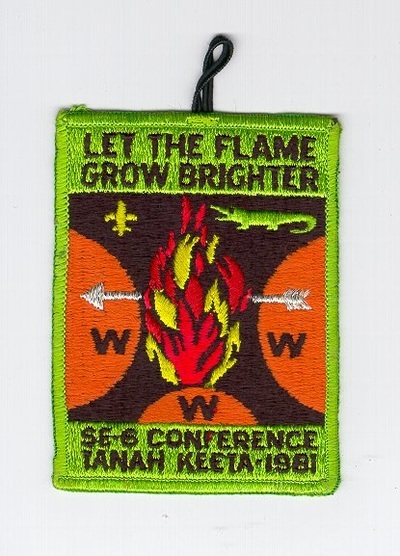 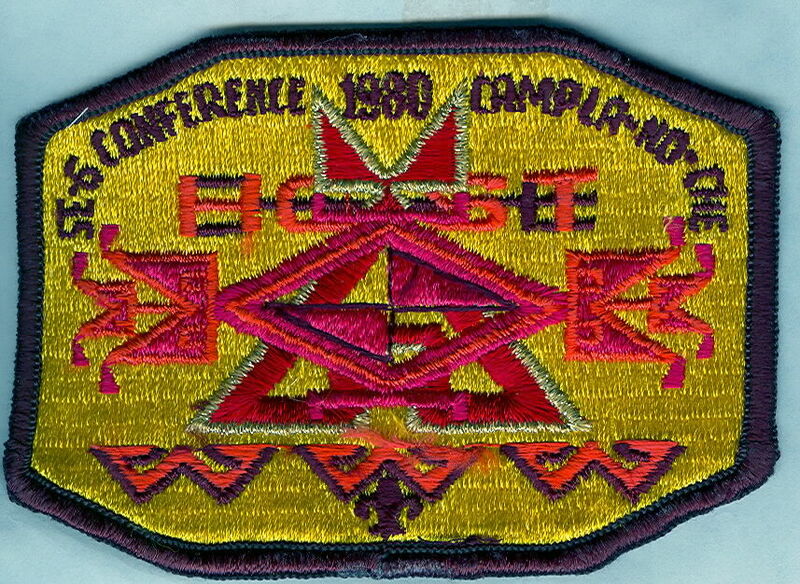 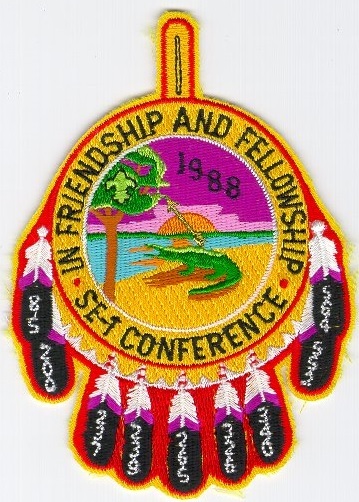 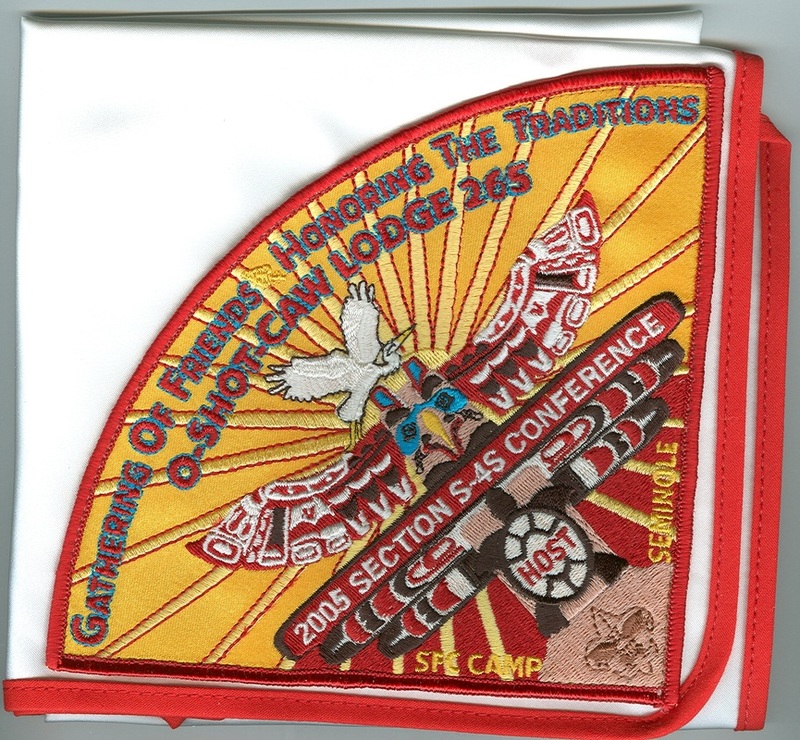 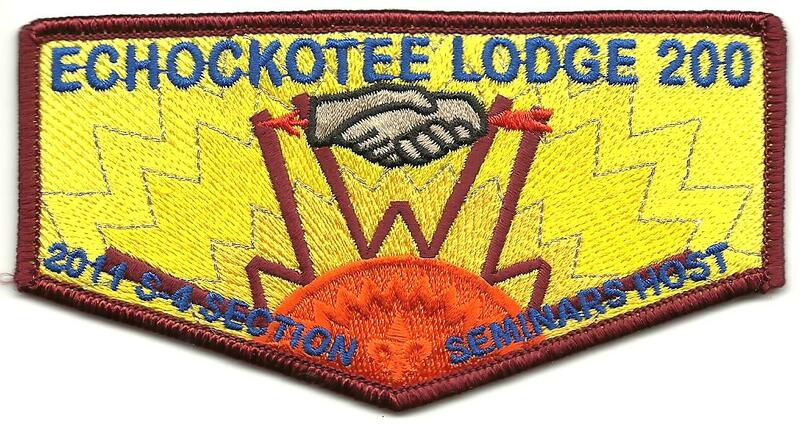 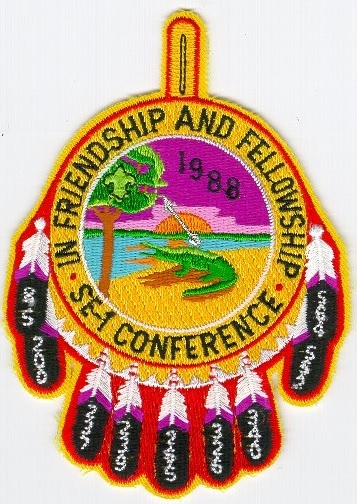 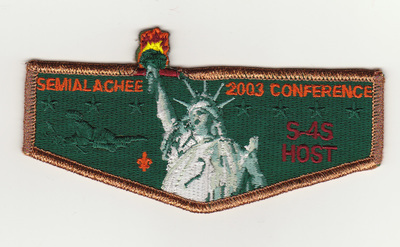 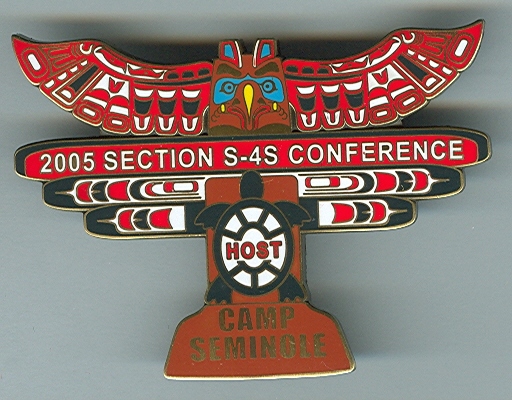 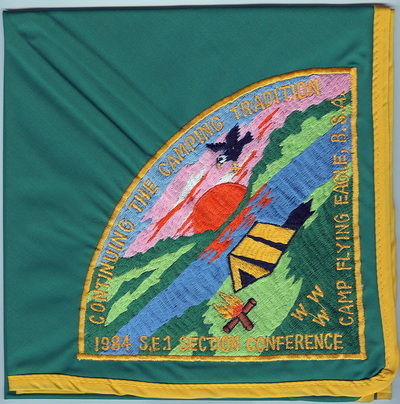 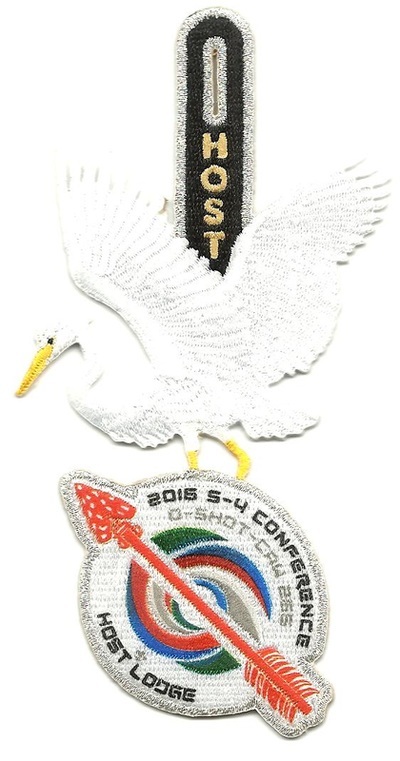 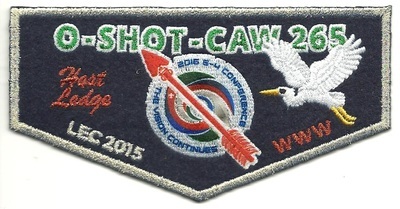 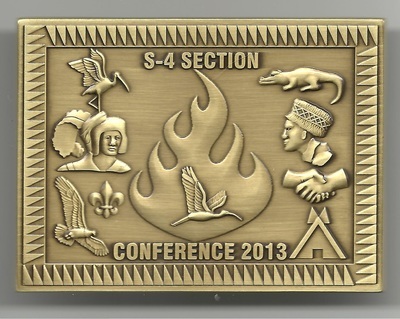 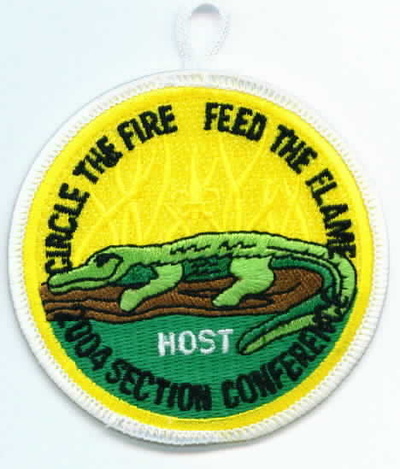 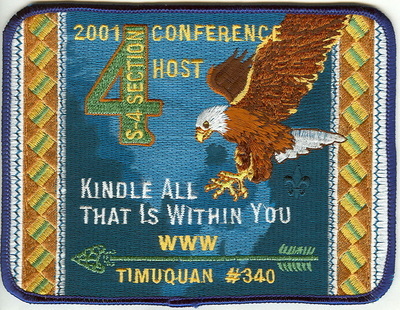 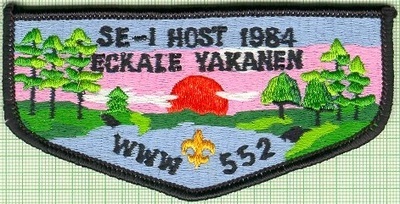 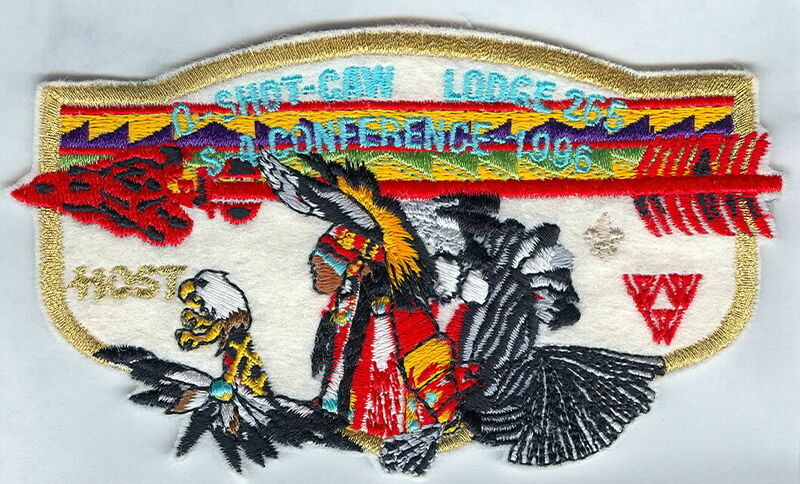 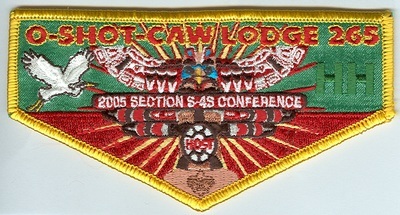 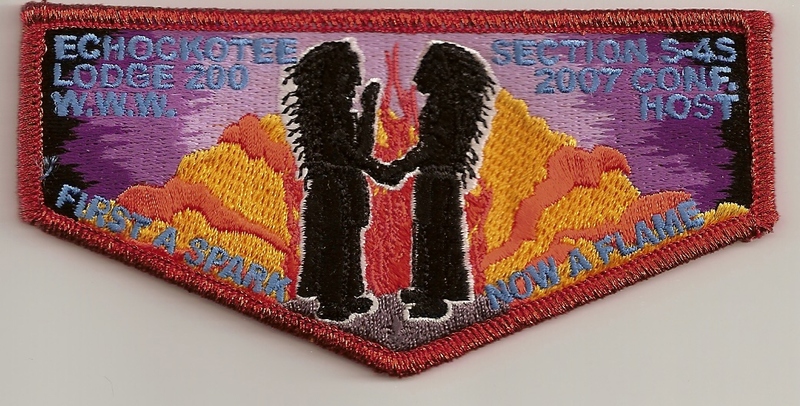 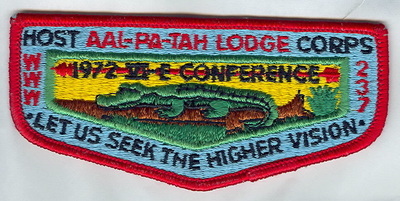 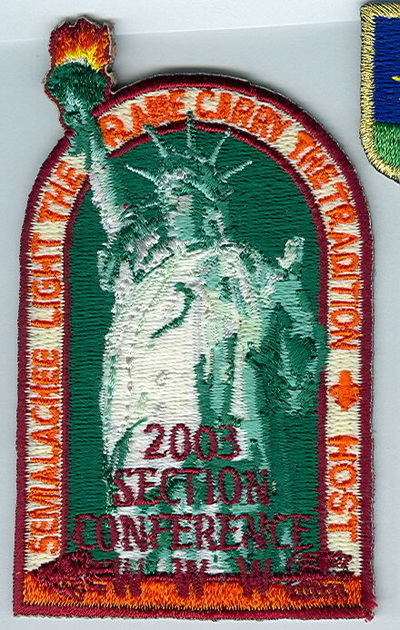 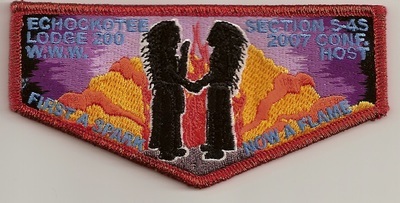 The last Section Conference without a host flap was in 1974 (Semialachee Lodge 239). 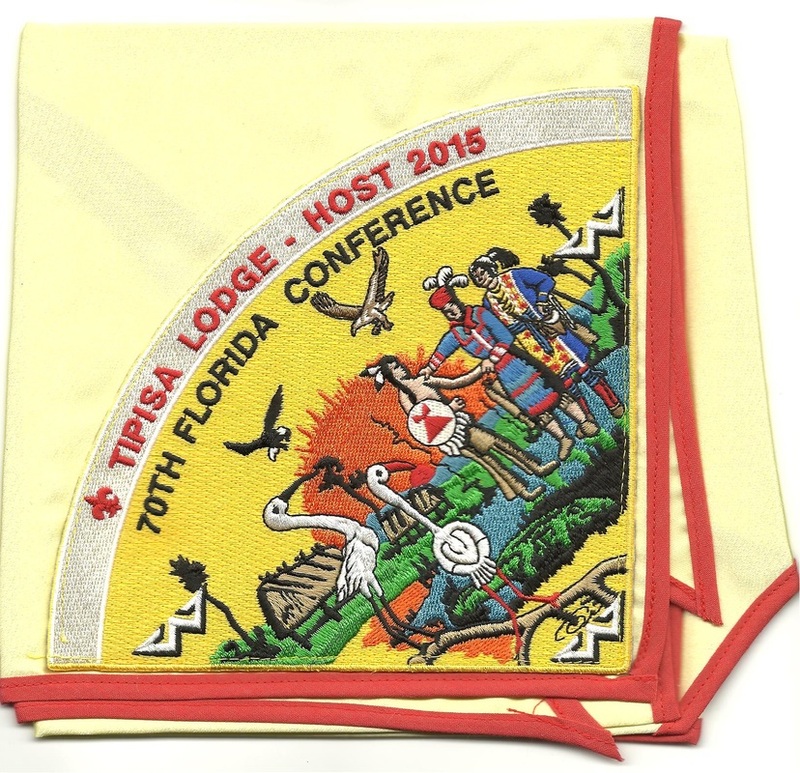 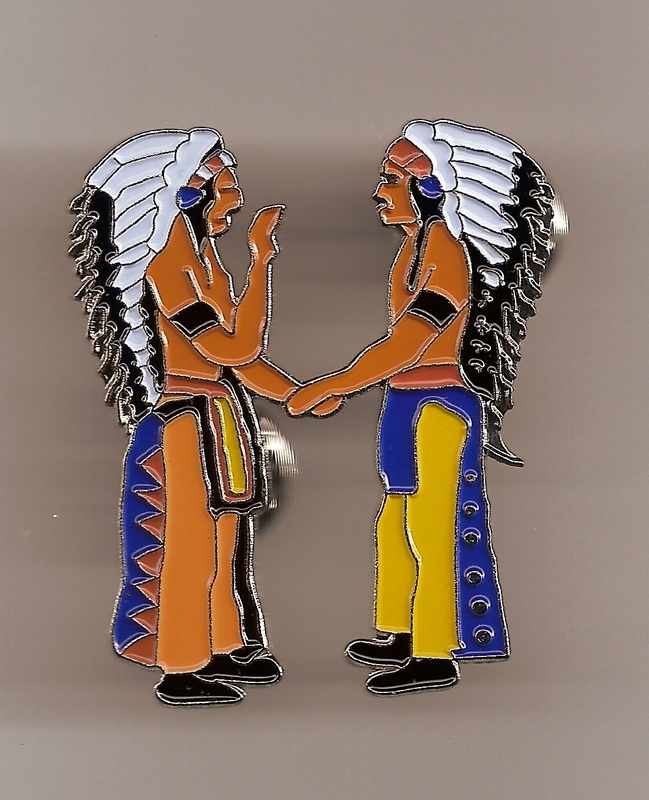 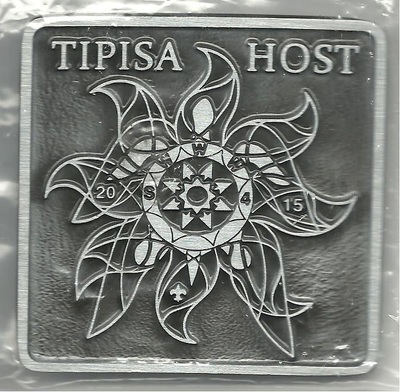 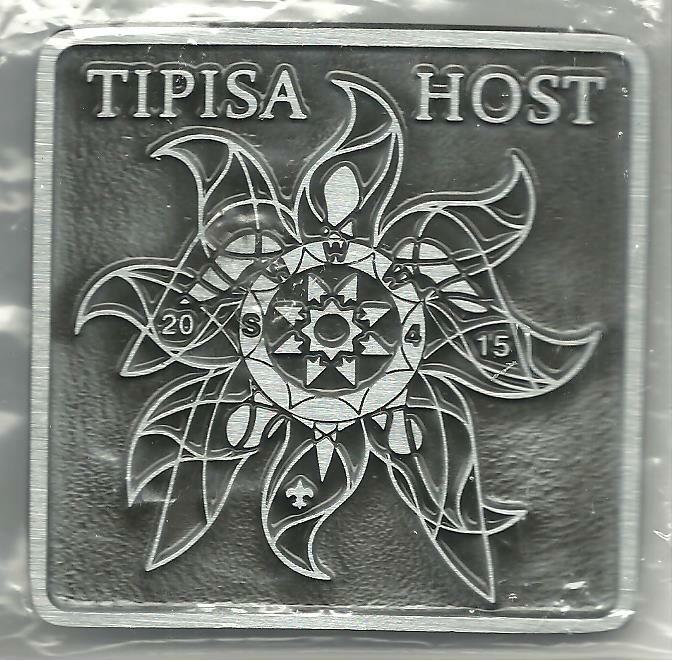 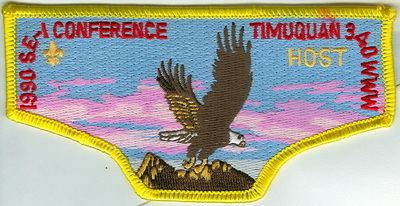 The first Section Seminars and Council of Chiefs Host item was created by Timuquan Lodge 340 in 1993, while the first Seminars Host flaps were issued by Pilthlako Lodge 229 in 1995. 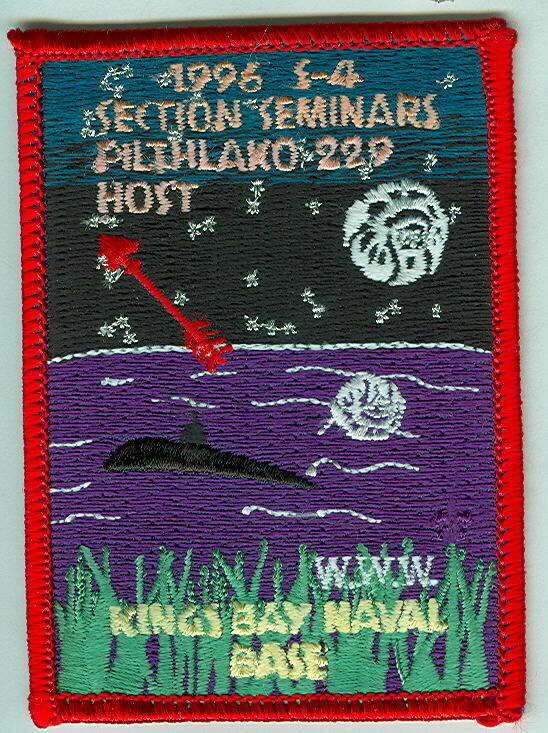 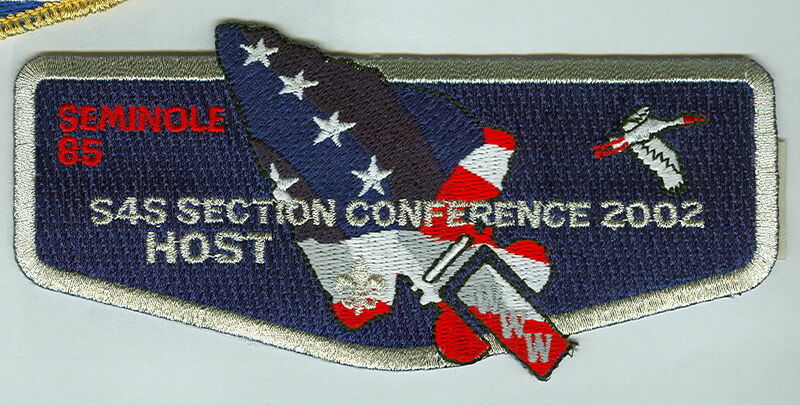 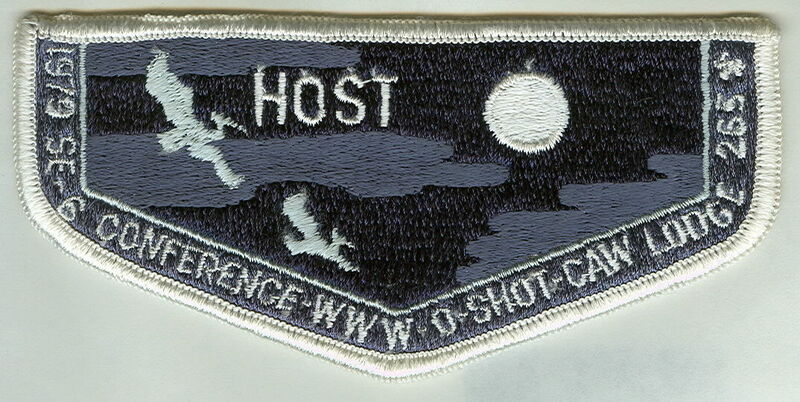 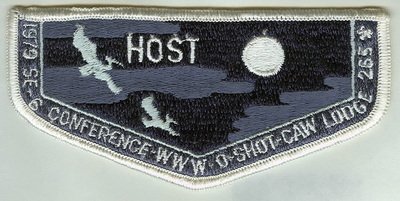 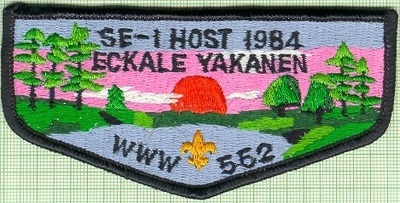 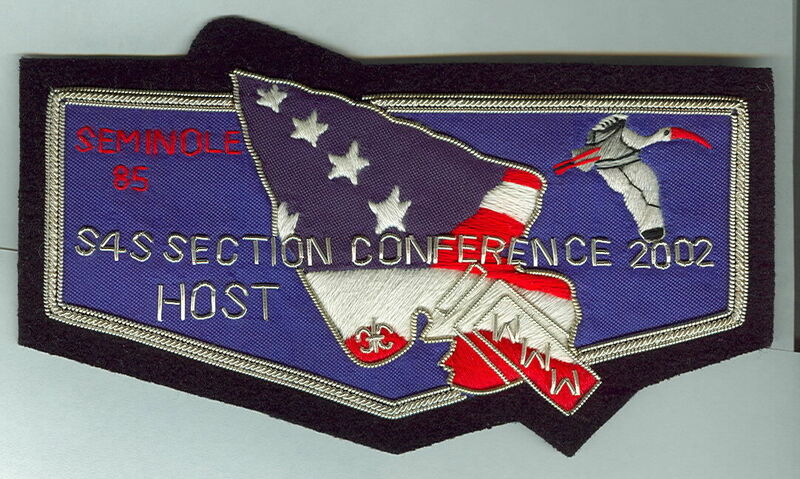 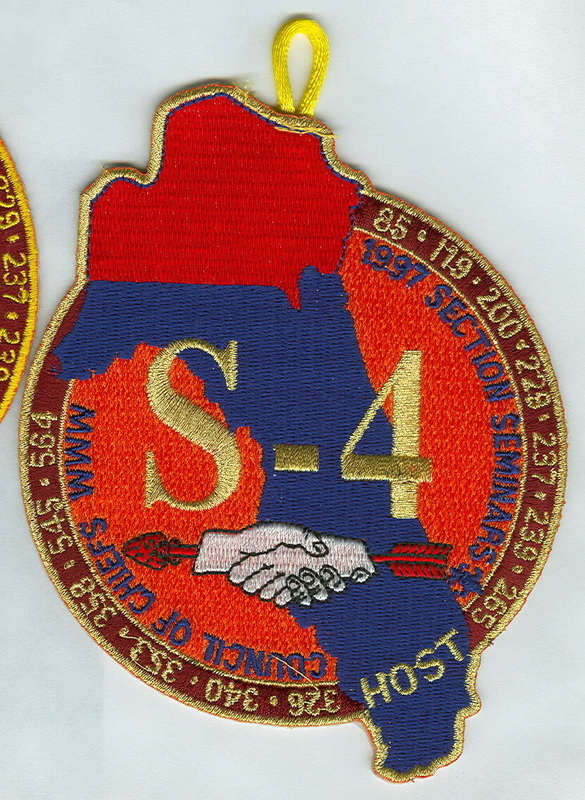 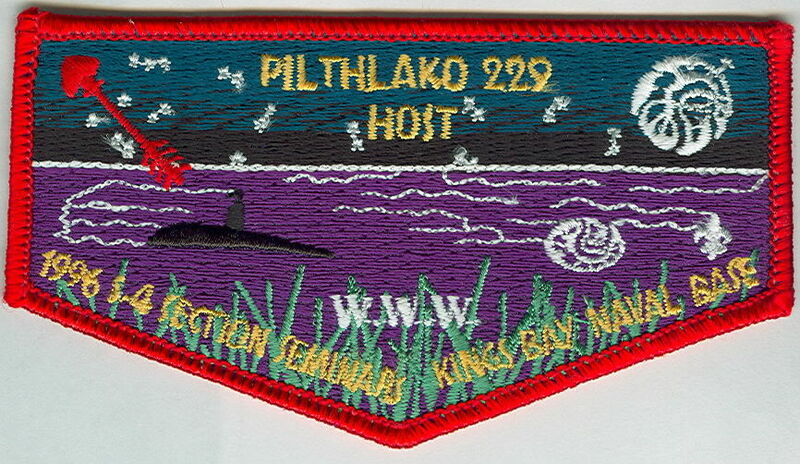 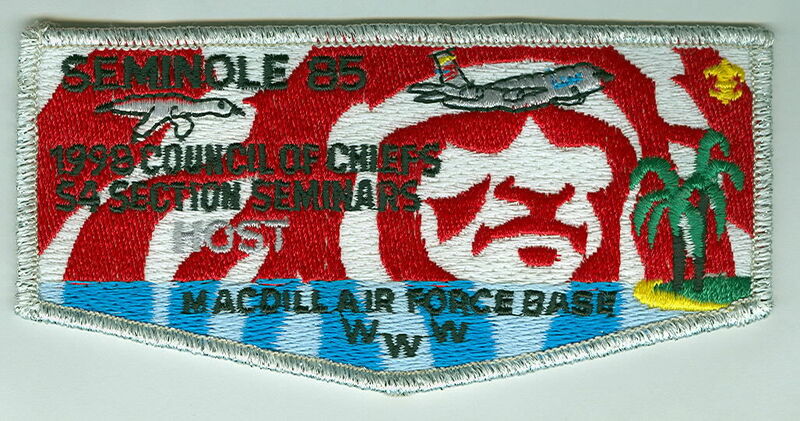 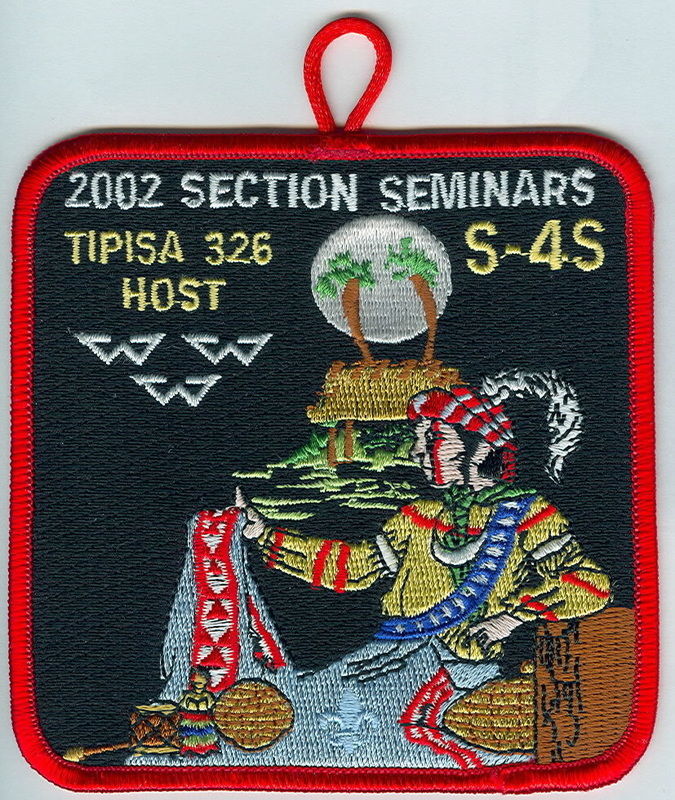 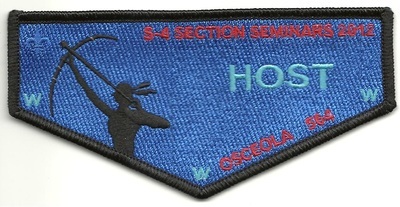 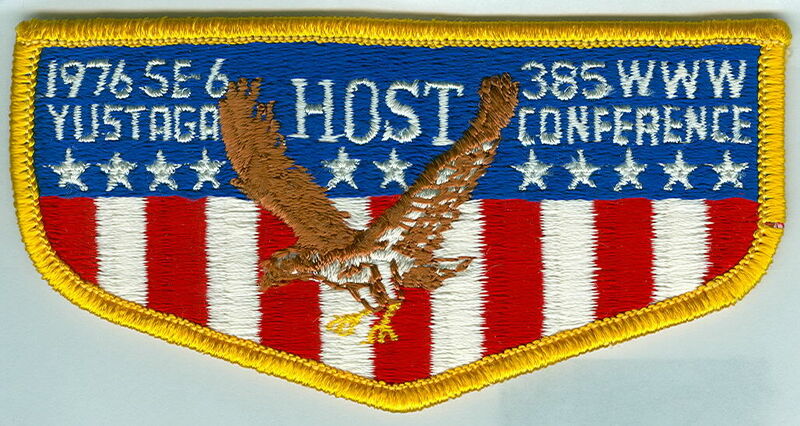 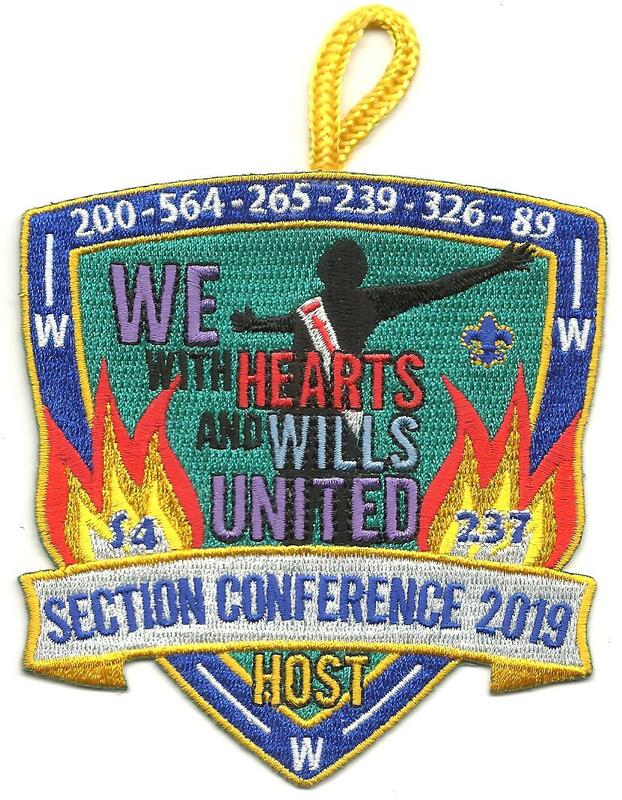 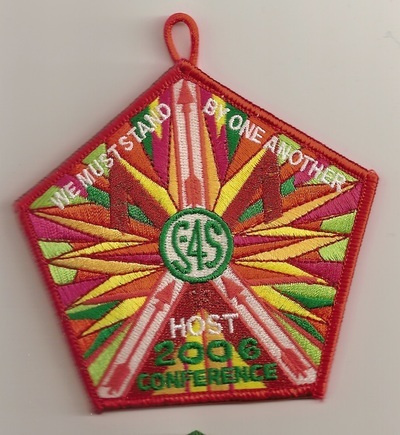 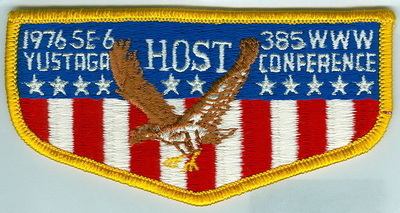 237-X-93 2011 Section S-4 Conference Host pocket patch; WHT "HOST"
237-X-94 2011 Section S-4 Conference Host pocket patch; GMY "HOST"